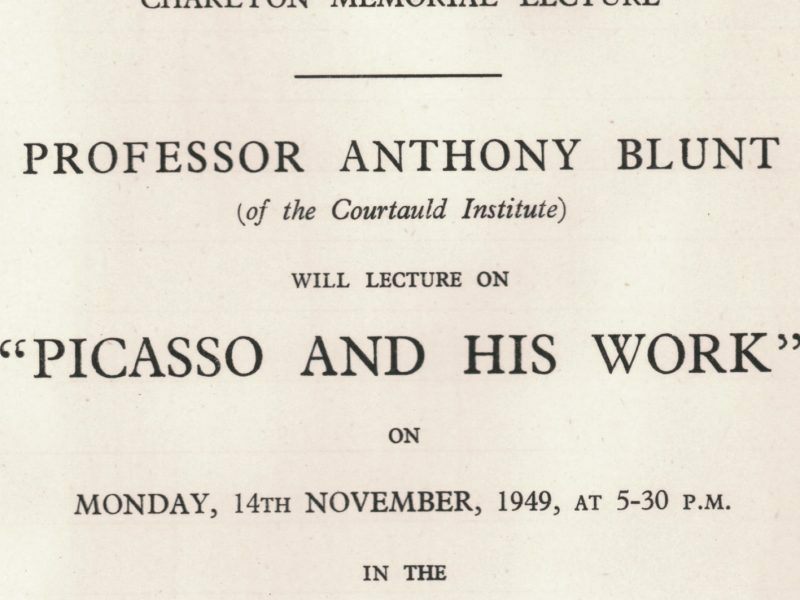 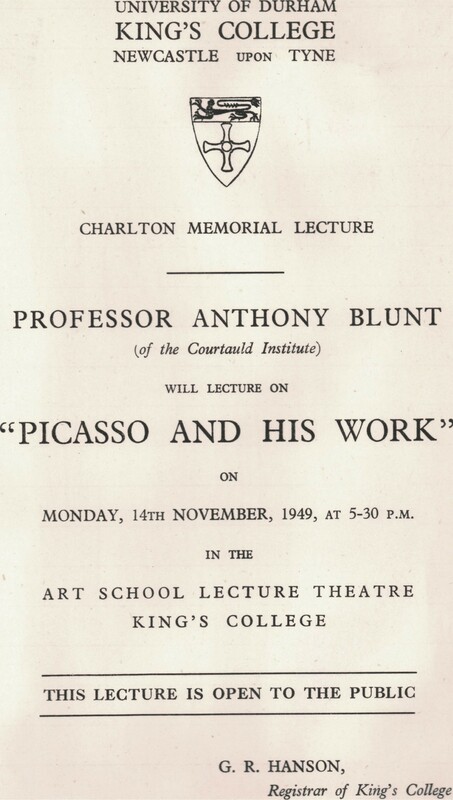 Gowing used his connections and influence across the art world to get the most eminent academics to deliver the annual Charlton Lecture, in 1949 Anthony Blunt, by then not only Surveyor of the King’s Pictures, but also Professor of the History of Art at the University of London, and the director of the Courtauld Institute of Art, spoke about Picasso. 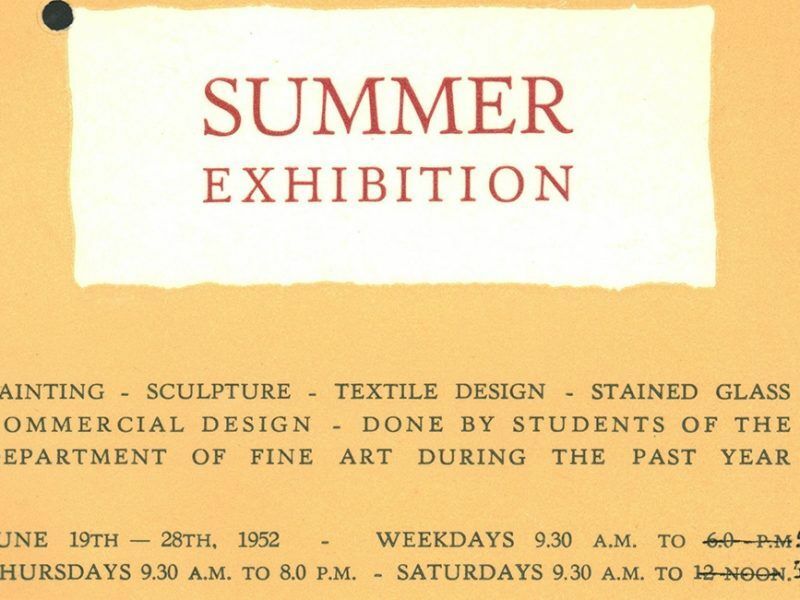 During this period the student Summer Exhibition brought together work from all disciplines and stages of the course. 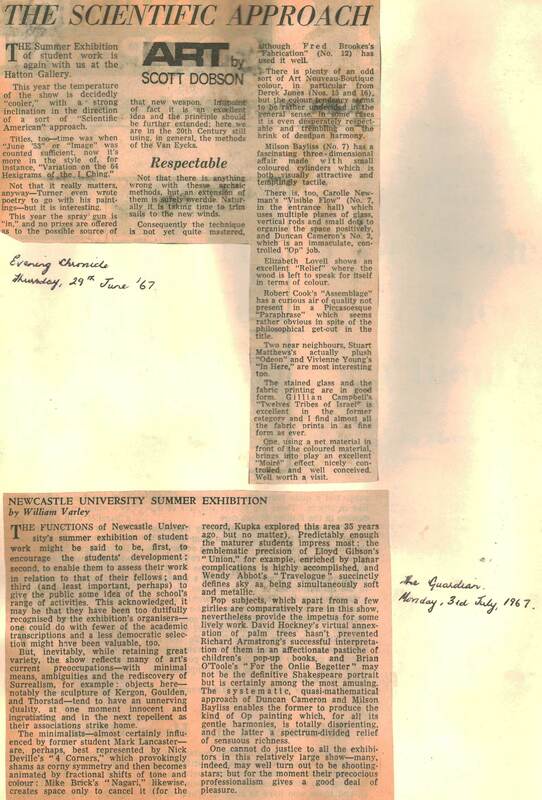 Student alumnus Derek Carruthers (1953-57) describes the entrance interview. 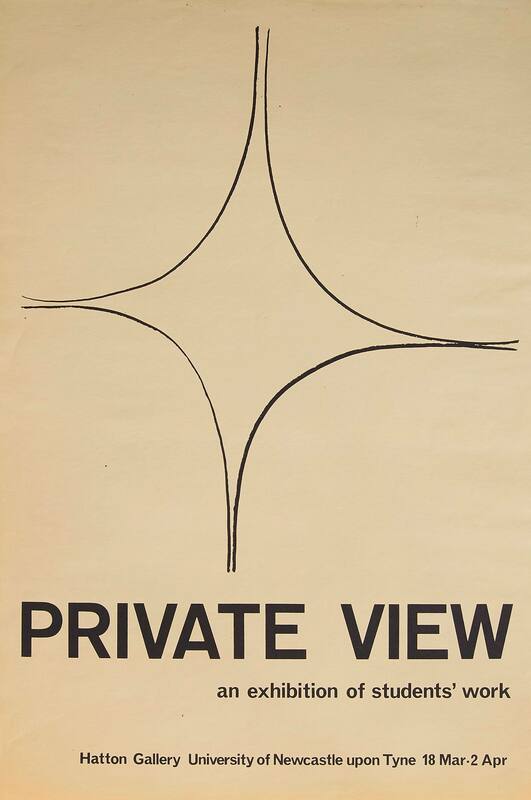 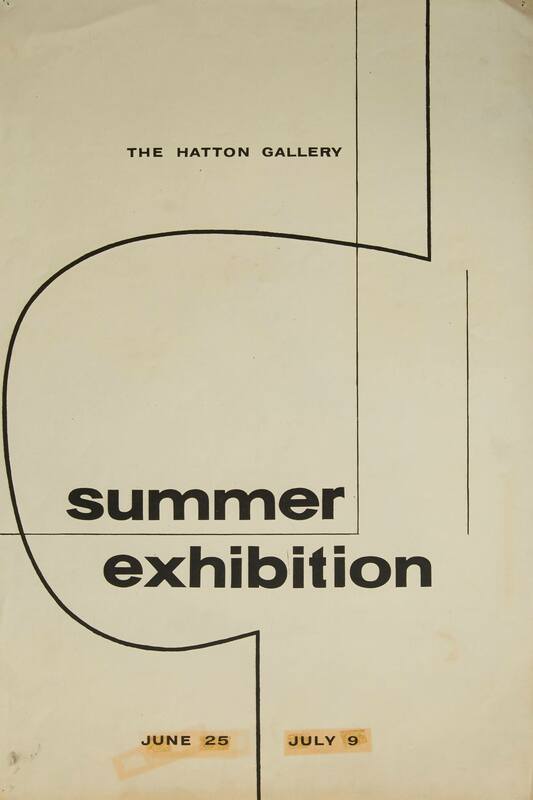 It is not clear whether at the time this poster for the 1955 Summer Exhibition was designed to so consciously contrast the old with the new, but certainly in retrospect, it would appear after the first full year of the new ‘basic course’ a sharp contrast was being made between the ‘Euston Road’ type realism of Gowing and de Grey and radical abstraction of Pasmore. 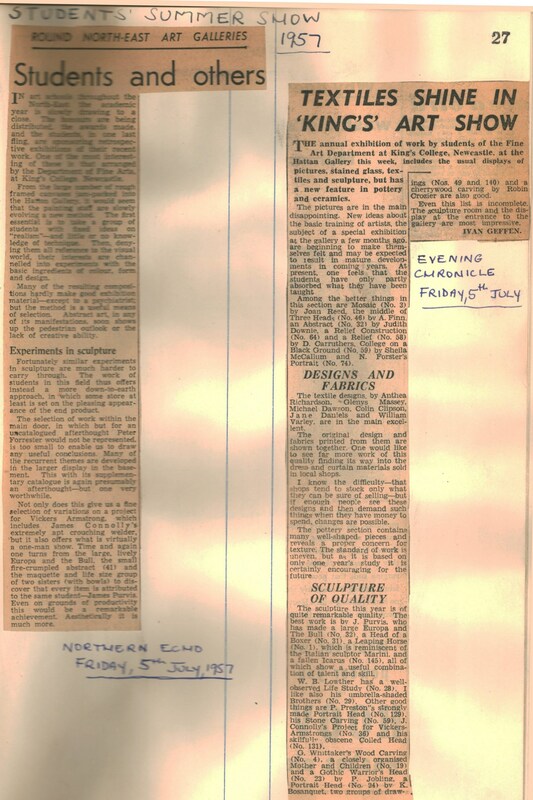 In 1955 the external examiners were William Coldstream and Wyndham Godden. 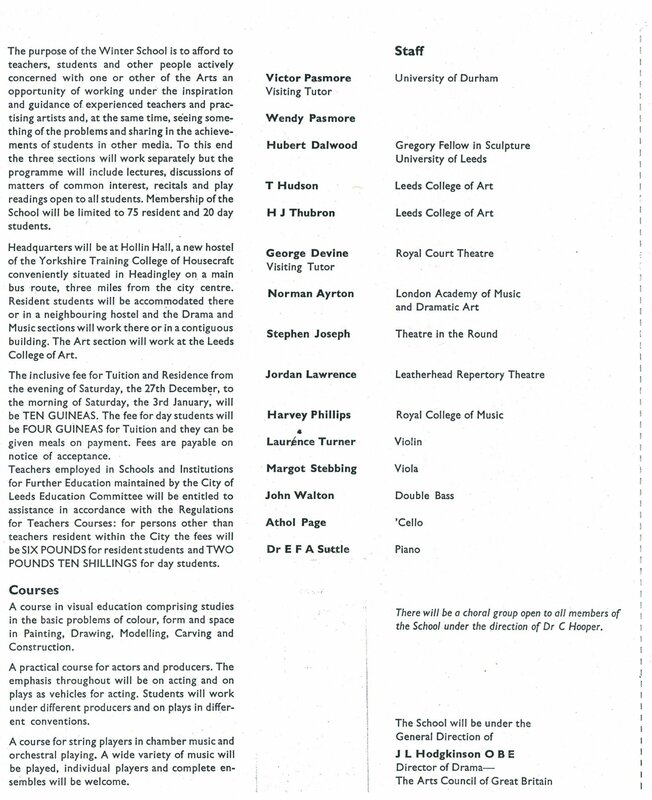 Alumni, Kate Stephenson, Elspeth Reynolds and Rosemary Saunders talk about their experience of the Basic Course. 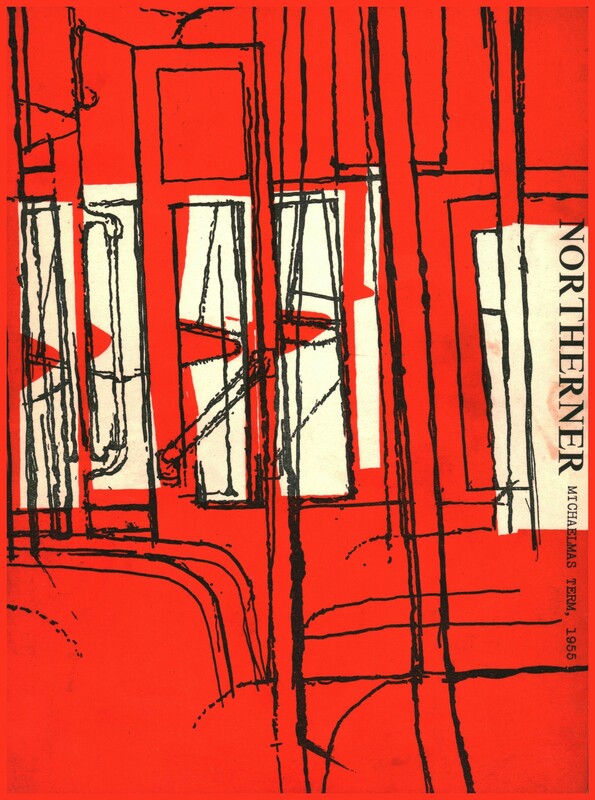 The Northerner was a campus wide, student led magazine, this cover was designed by Ian Stephenson, then in his year as a Hatton scholar, towards the end of his degree. 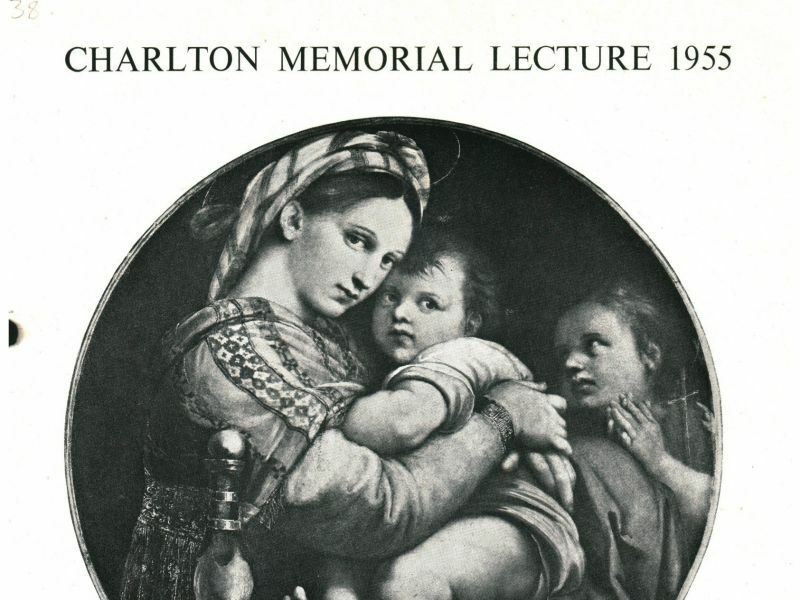 During the 1950s the annual Charlton Lecture, rather than being a broad survey of a particular topic, was generally focused on a single work of art. 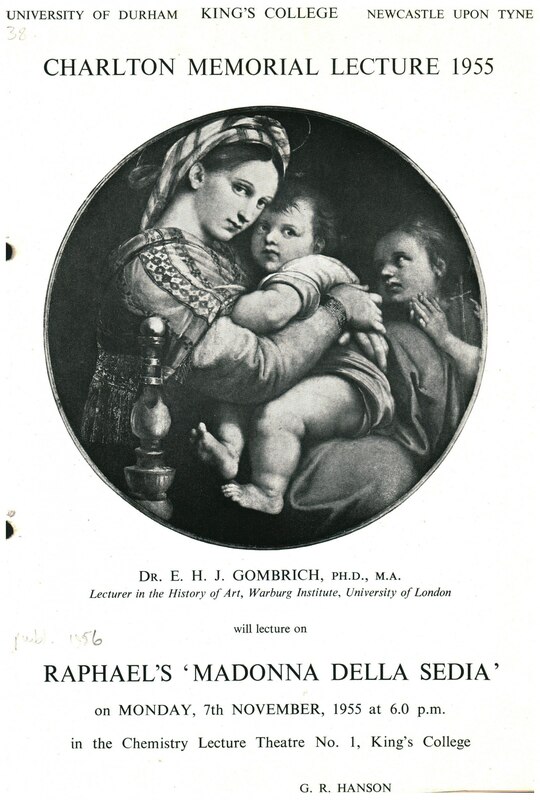 In 1955, five years after the publication of his ‘The Story of Art’, Ernst Gombrich delivered a lecture on Raphael’s Madonna della Sedia from the Palazzo Pitti collection in Florence. 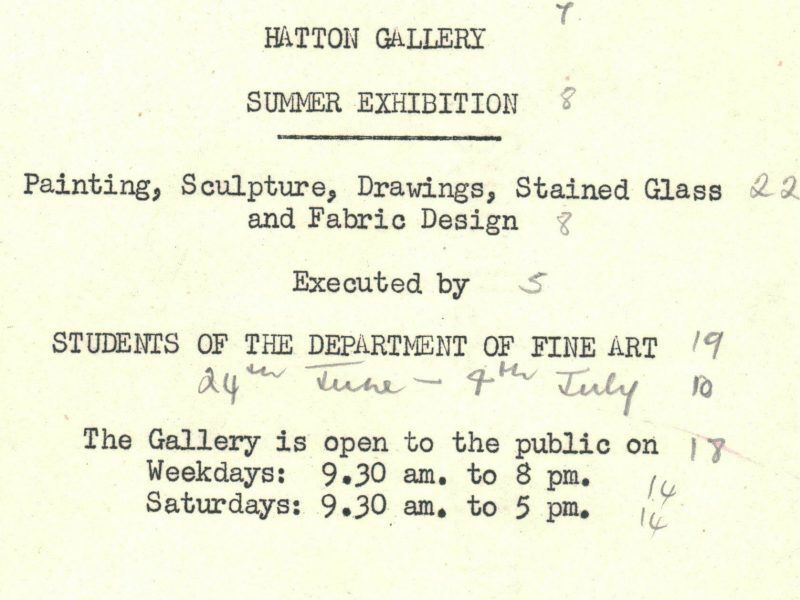 Annotated flyer / press release for the 1956 Summer Exhibition, the significance of the pencil figures appears to relate to the length of each line of text. 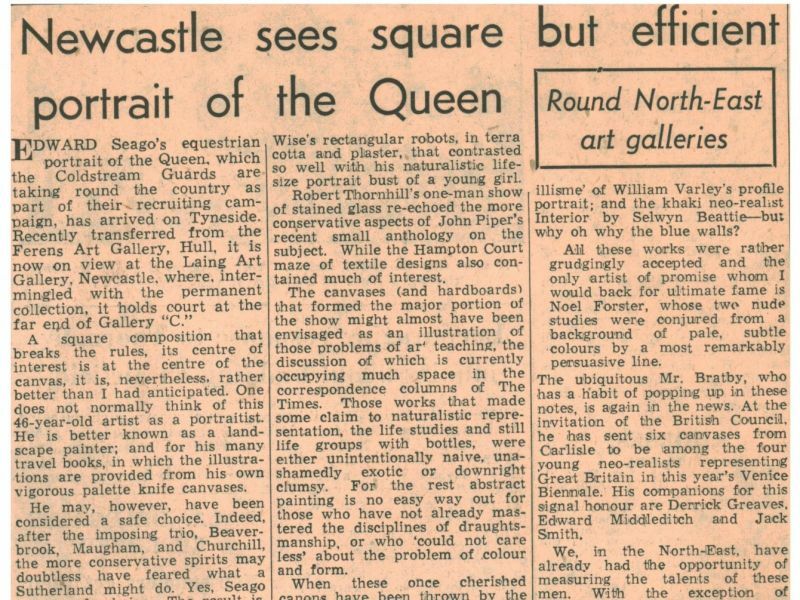 Following the paragraphs on Edward Seago’s ‘square but efficient’ portrait of the Queen on show at the Laing Art Gallery, are W.E. 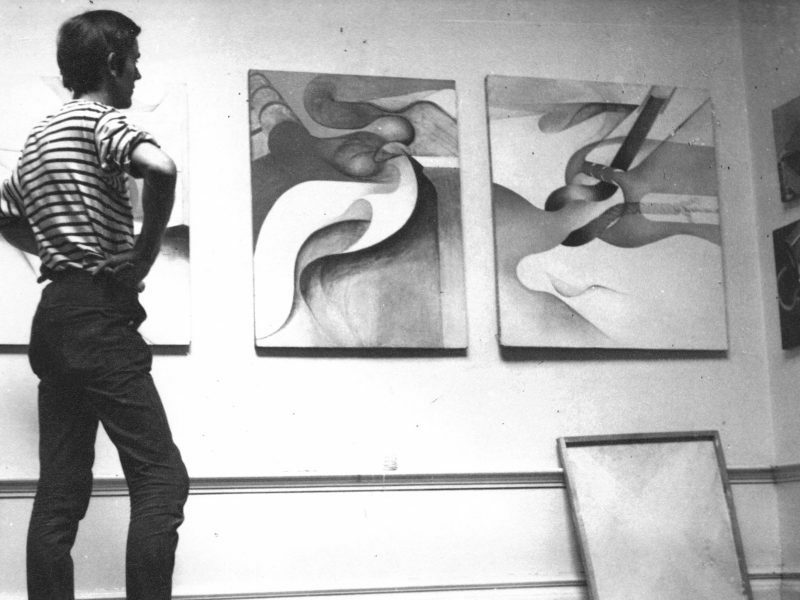 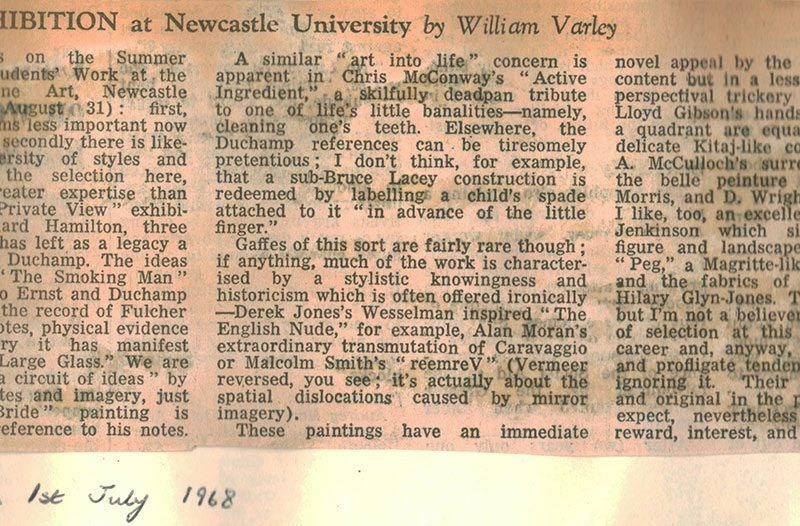 Johnson’s thoughts on the 1956 student Summer Exhibition, where he finds himself at a loss at the quantity and quality of the many abstract paintings. 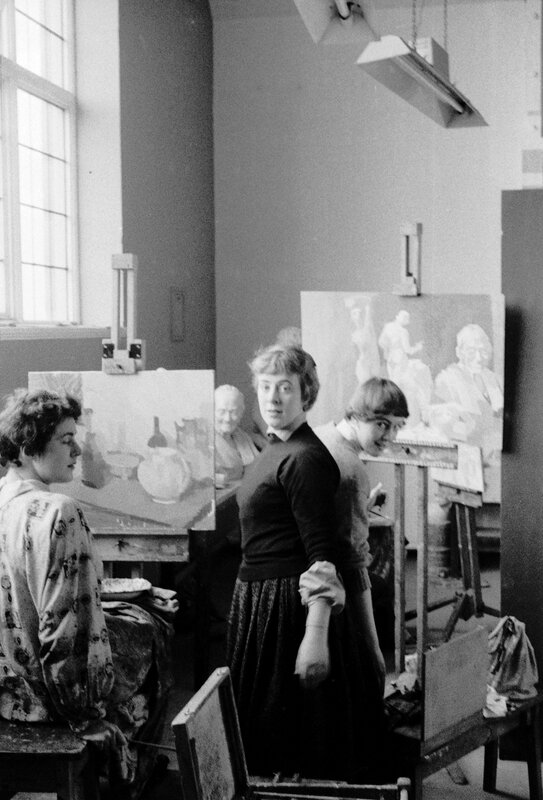 This photograph from c.1956 shows that although Pasmore and Hamilton’s ‘basic course’ was underway and being taught to First Year students, more traditional painting from still life continued to be available and actively pursued. 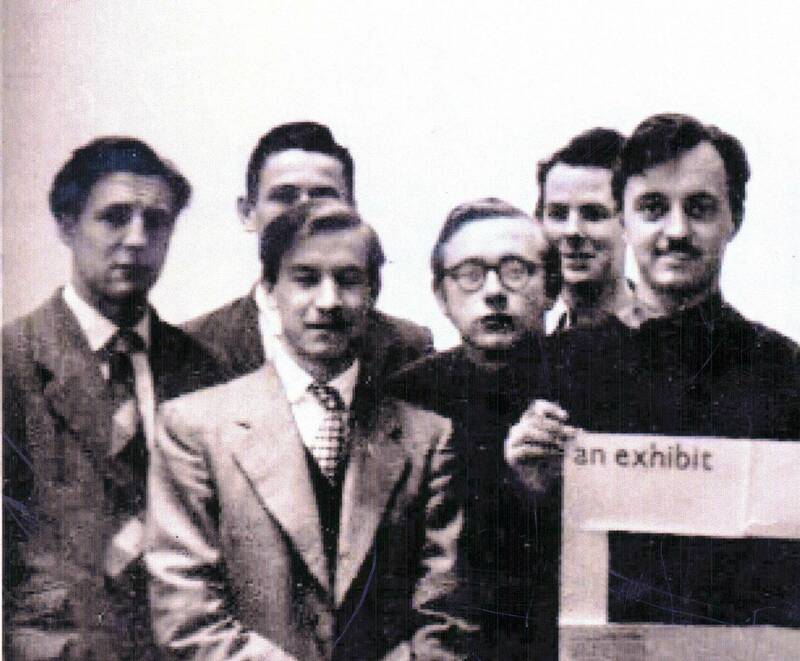 Derek Carruthers seen holding the poster for An Exhibit alongside a group of fellow students. 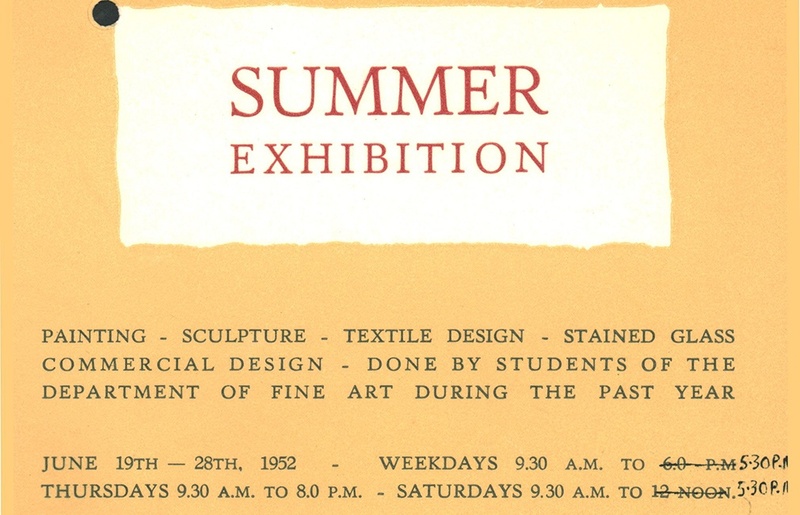 Student alumnus Matt Rugg (1956-61) recalls An Exhibit. 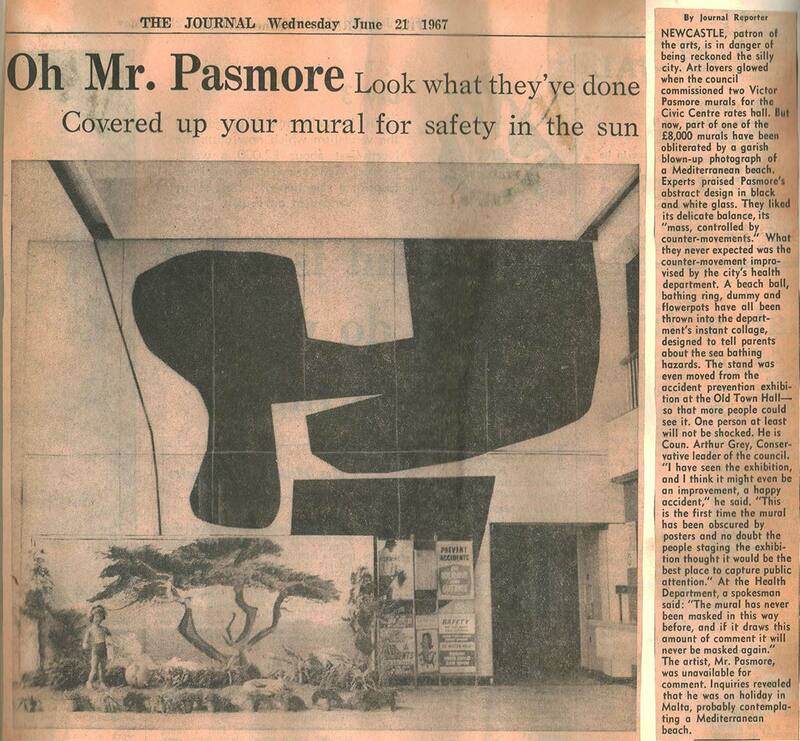 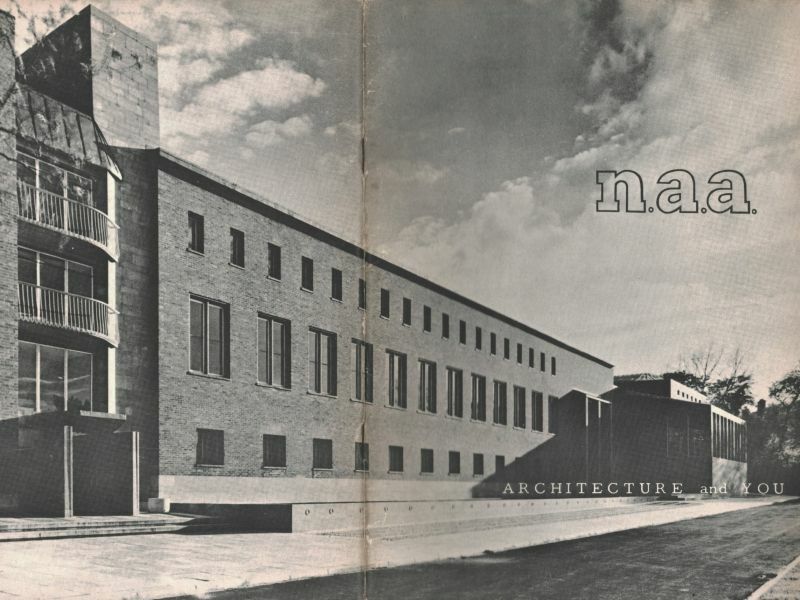 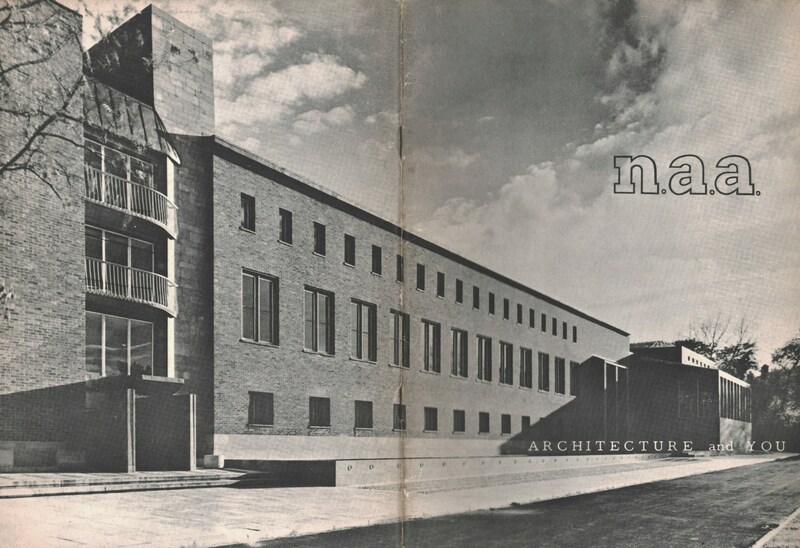 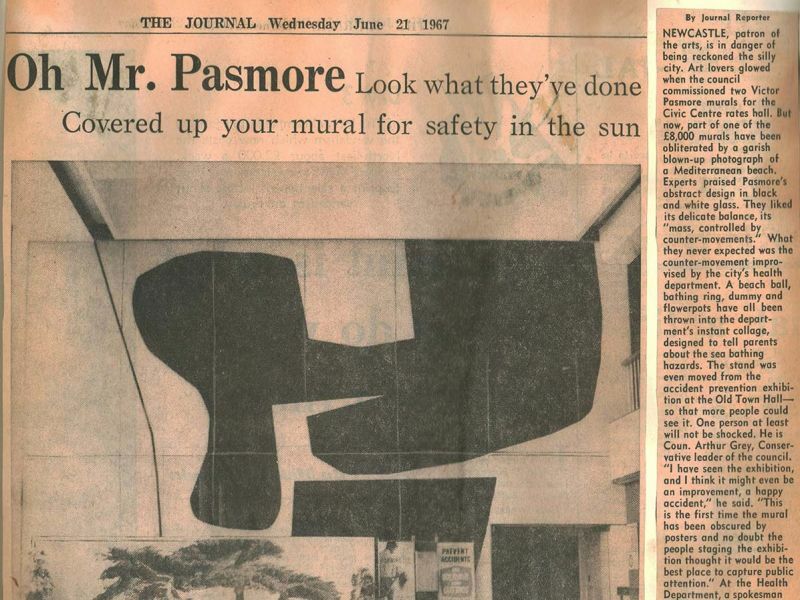 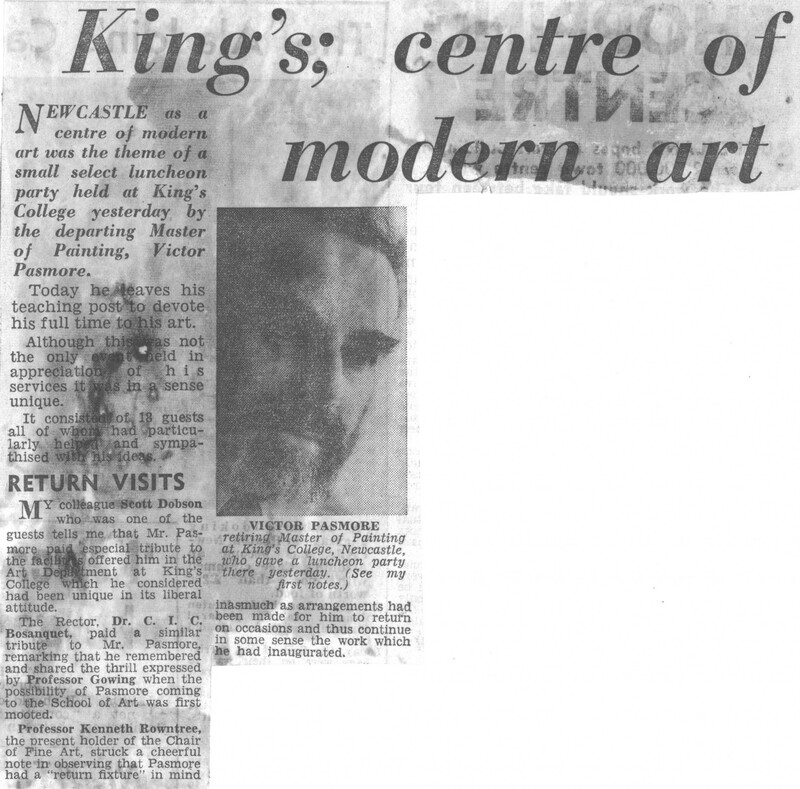 As reported here, in May 1957 Pasmore completed two large murals for the Stephenson engineering building on the Newcastle campus, unveiled by Herbert Read. 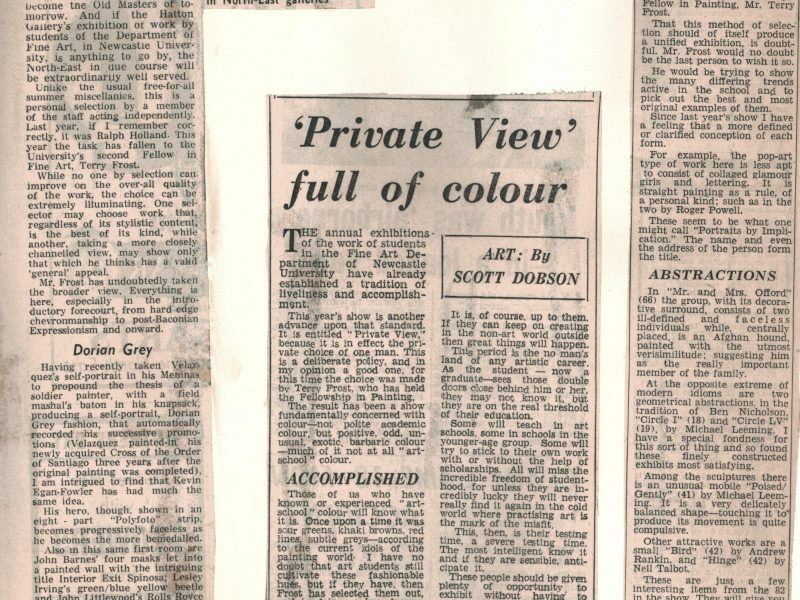 This event was accompanied by an exhibition in the Hatton titled ‘Basic Form and Colour’, described by W.E. 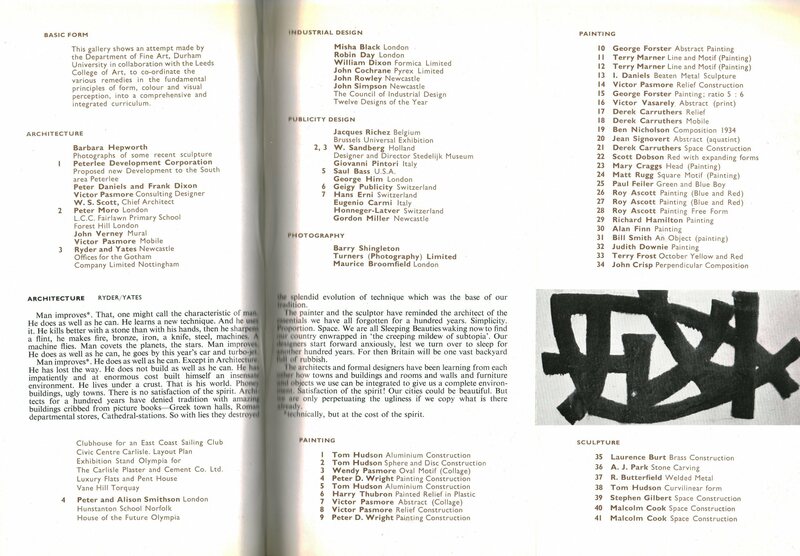 Johnson as an attempt ‘to design an alphabet of visual ideas’. 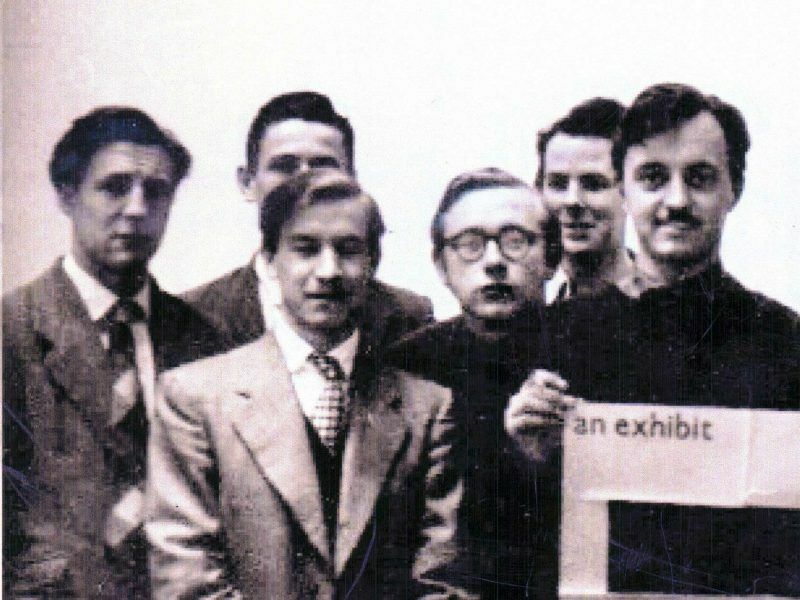 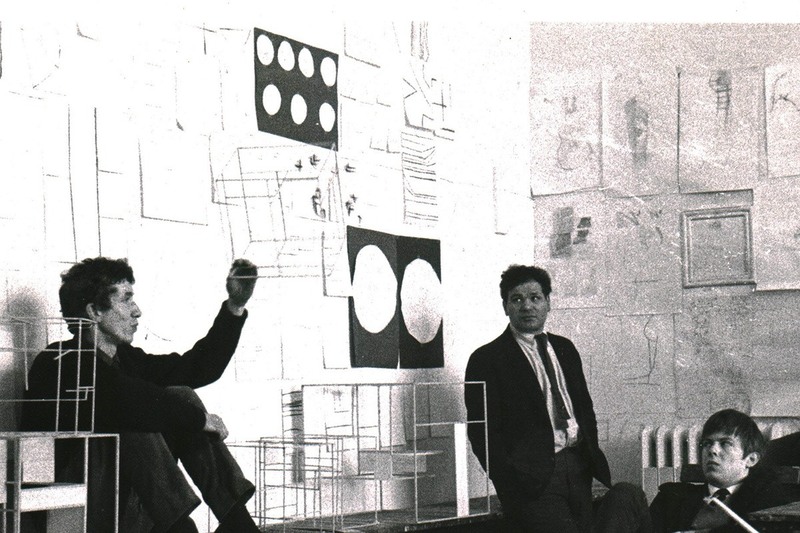 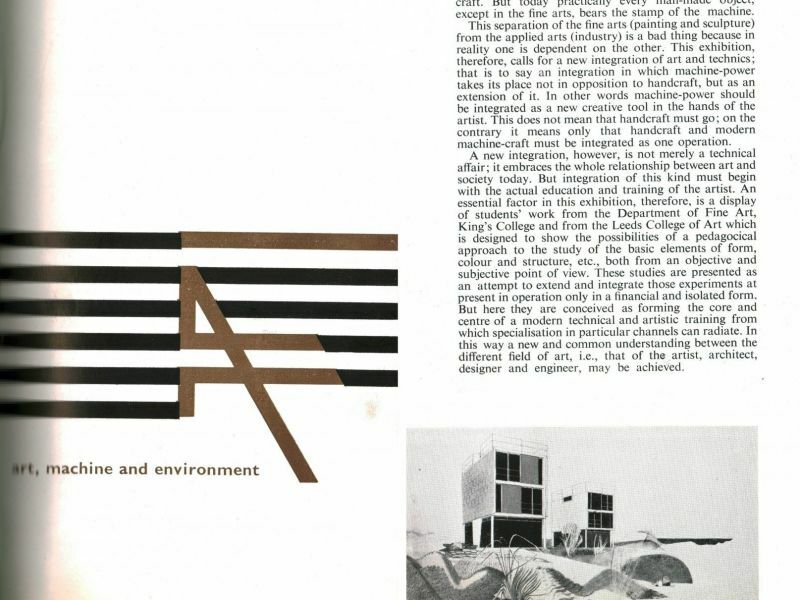 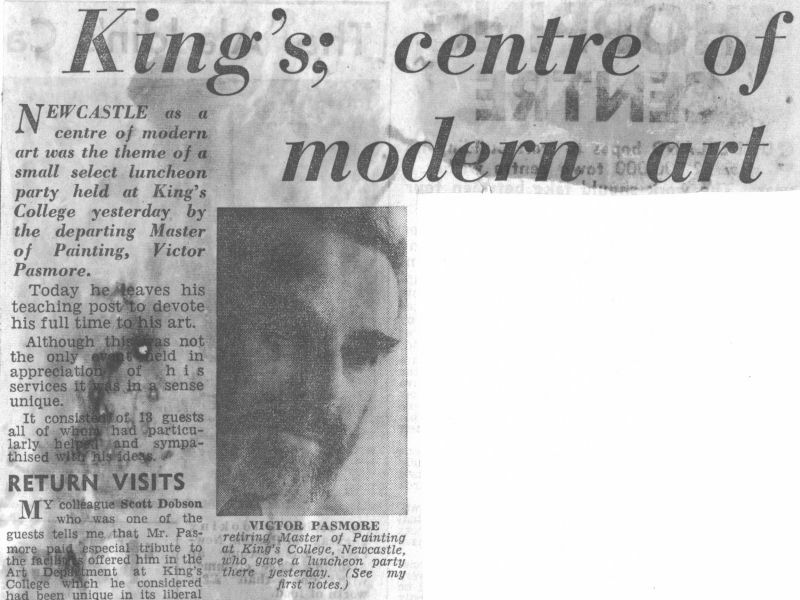 Student alumnus Derek Carruthers (1953-57) describes Pasmore’s views on art and architecture. 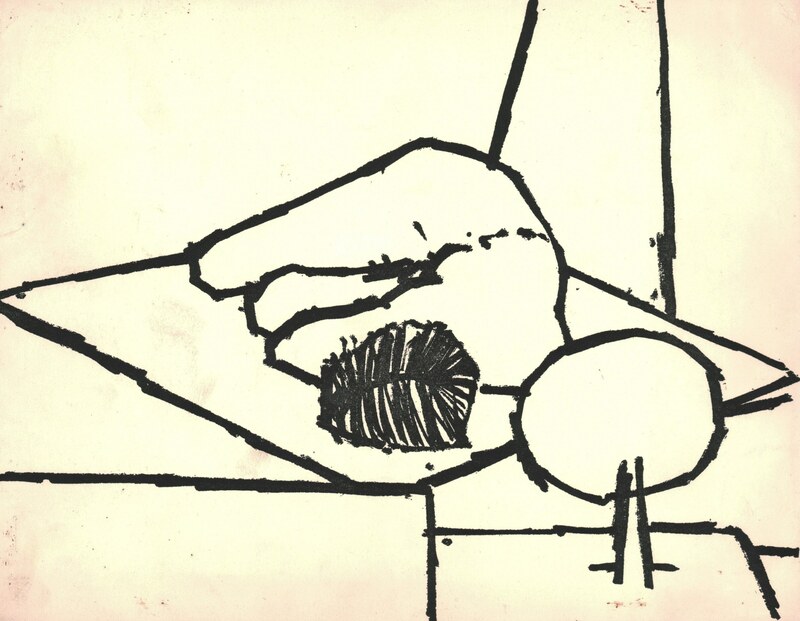 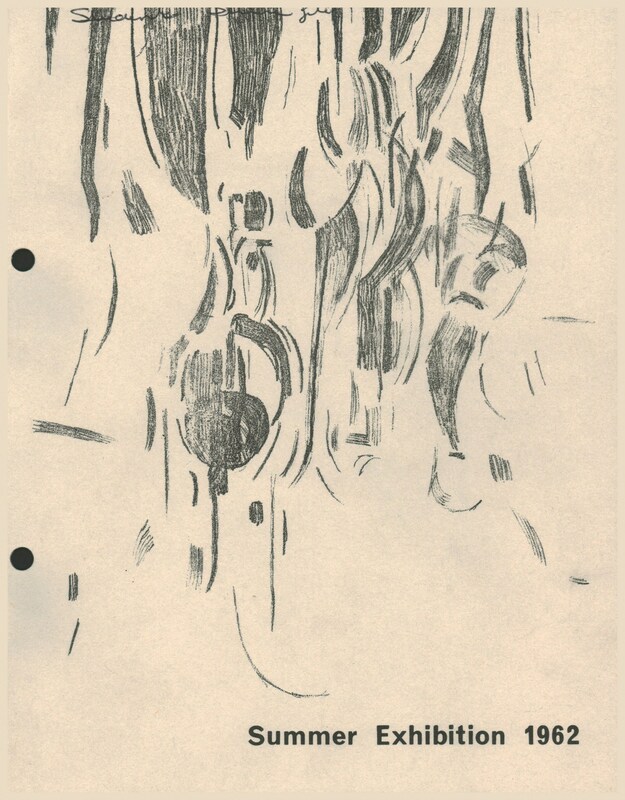 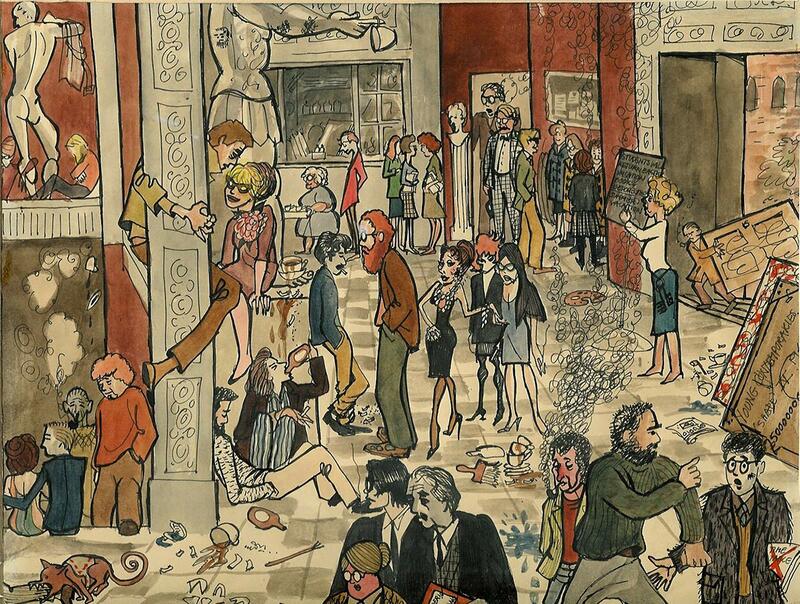 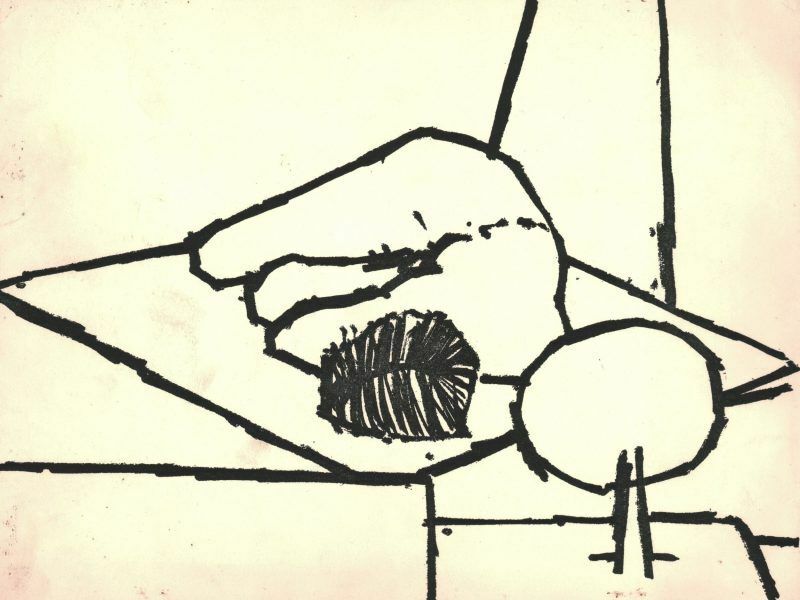 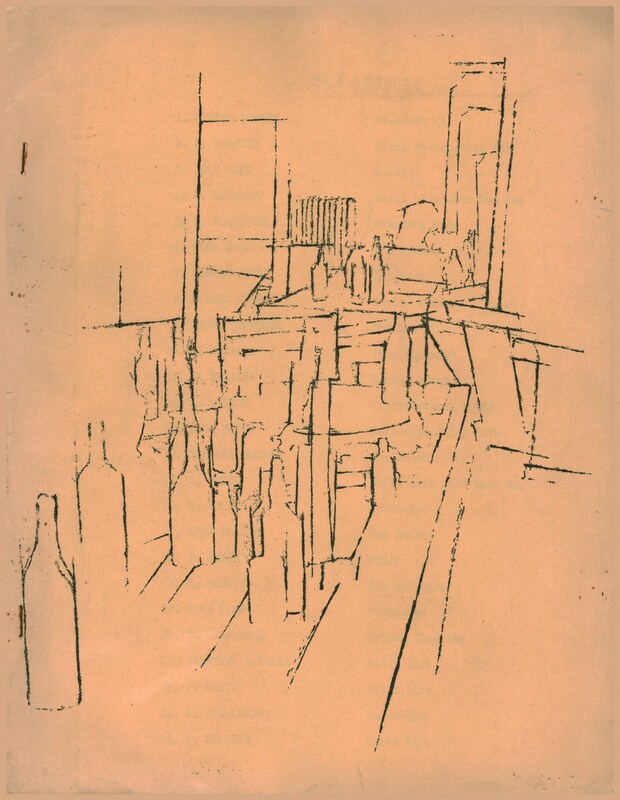 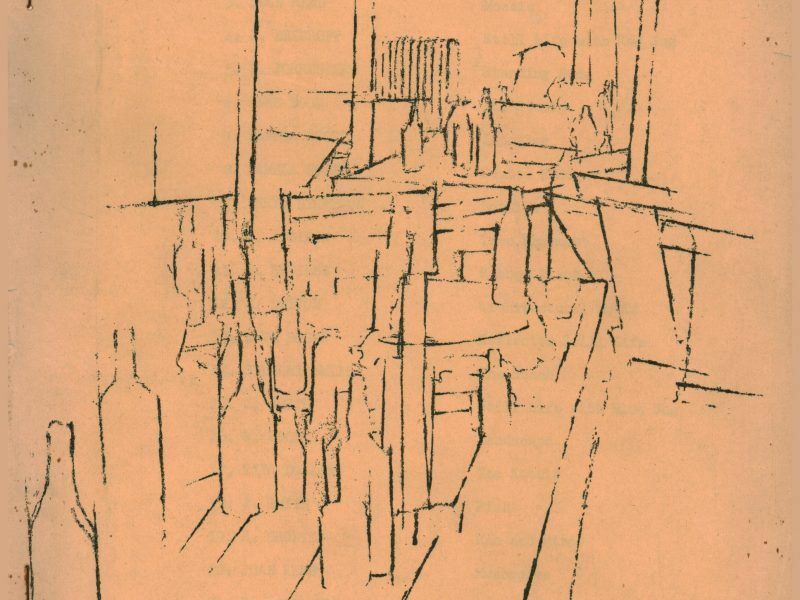 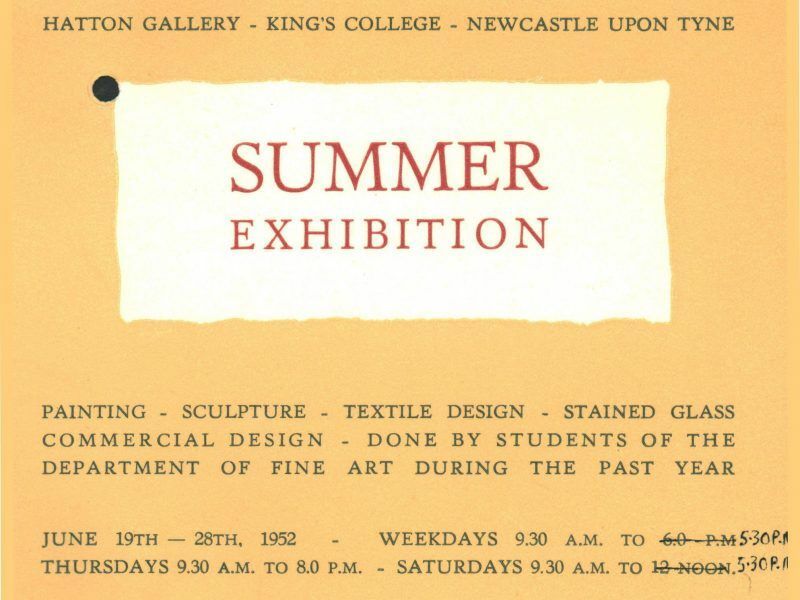 The cover of the 1957 Student Summer Exhibition catalogue by Kathleen Brown (Kate Stephenson) demonstrates that drawing from life, though with a difference, remained an important part of the course. 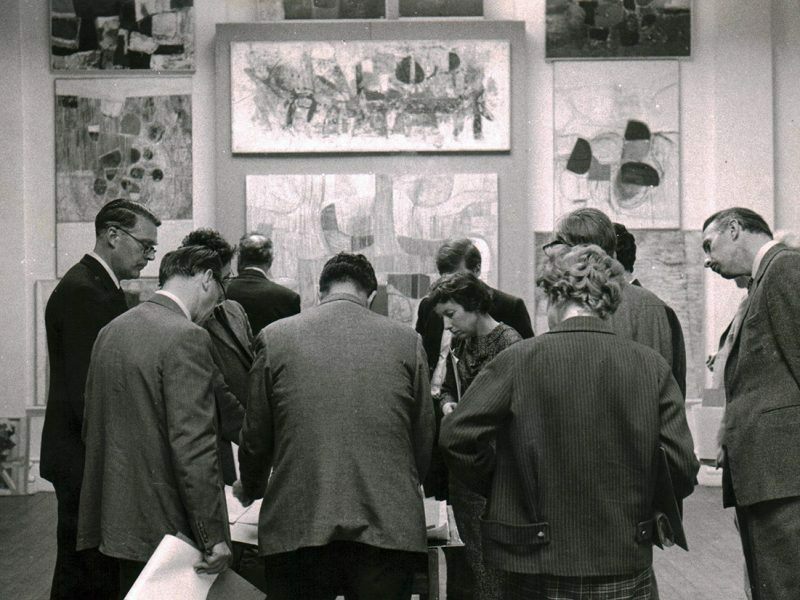 In 1957 the external examiners were William Coldstream and John Piper. 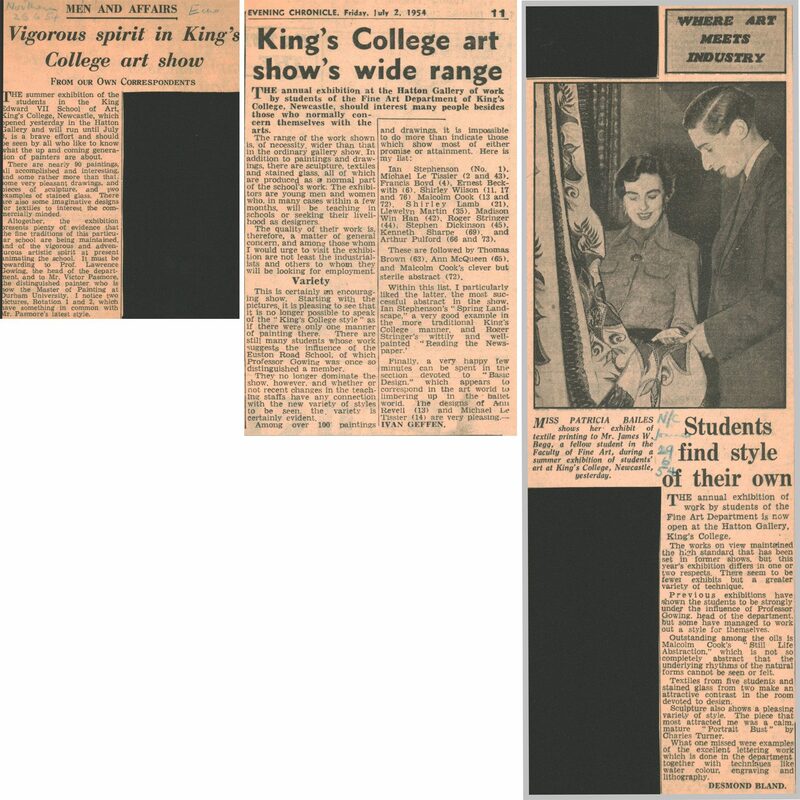 Student alumni Matt Rugg (1956-61) and Pat Kremer (1957-61) recall Ian Stephenson’s influence. 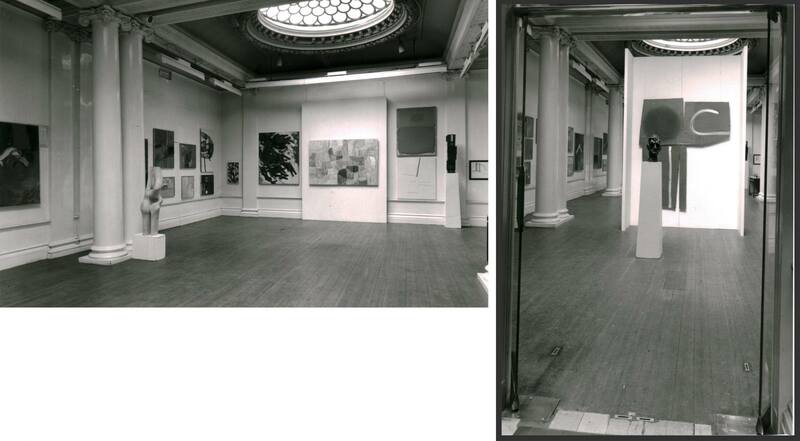 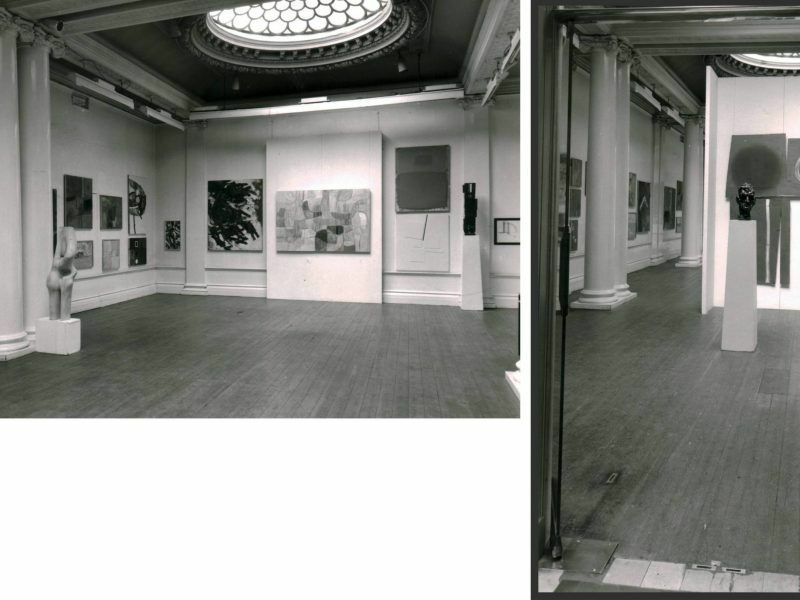 These two photographs show a display of students’ works in ‘Room 2’. 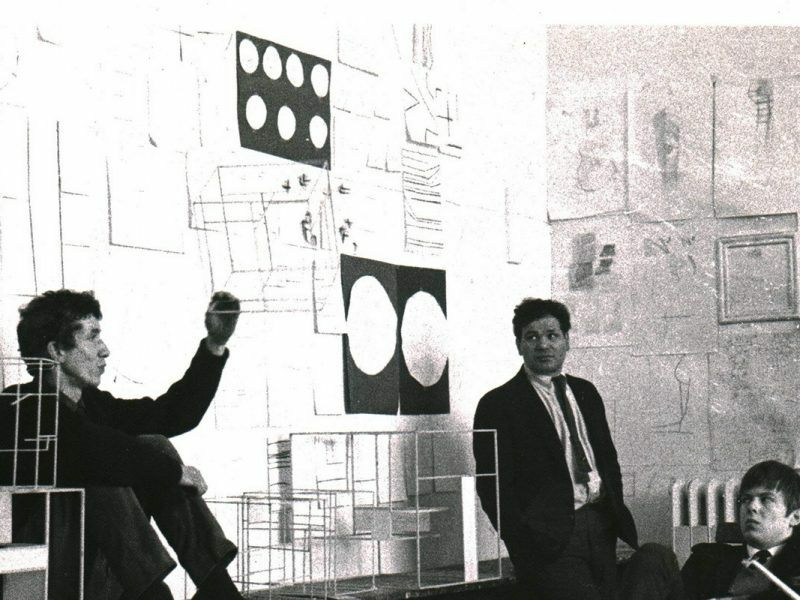 The ‘Room 2’ group at this time was made up of students apparently favoured by Pasmore and making works that adhered to his abstract leanings. 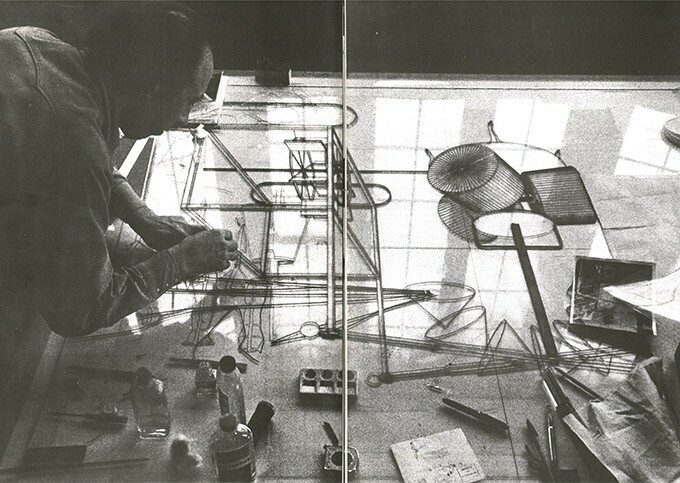 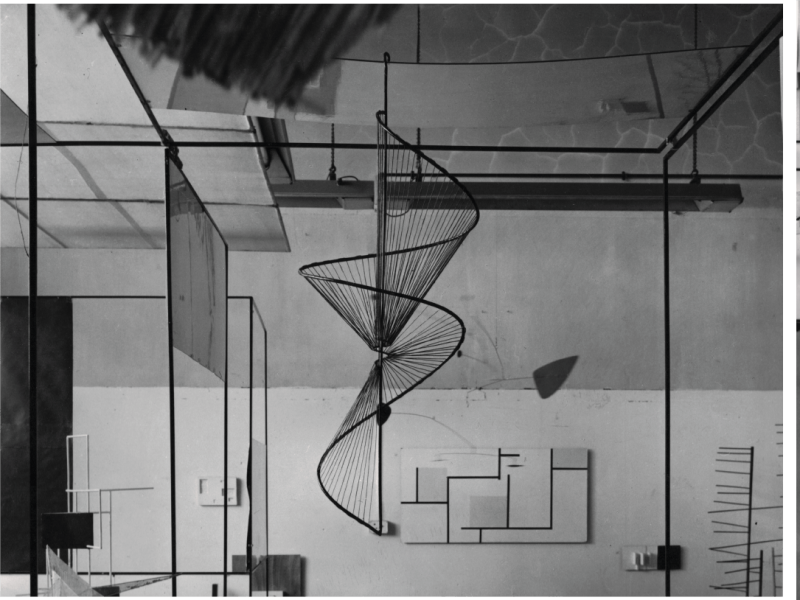 Prominent is Derek Carruthers’ spiral mobile that Pasmore had included in the 1956 Abstracts exhibition. 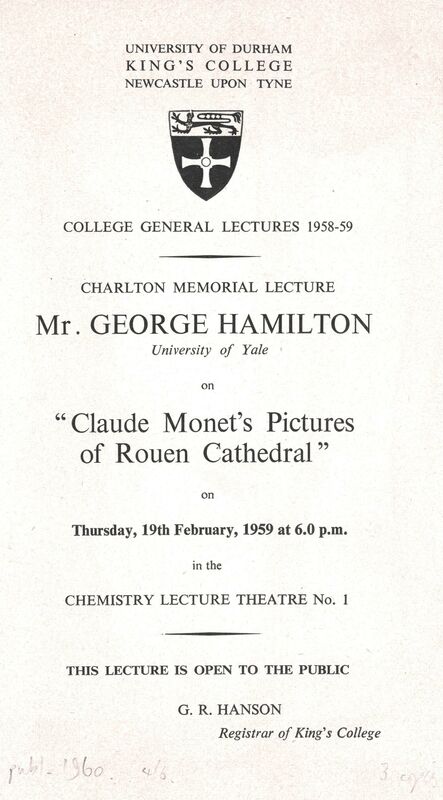 The metal framework used for Hamilton’s Man, Machine and Motion exhibition can be seen here being enterprisingly re-used. 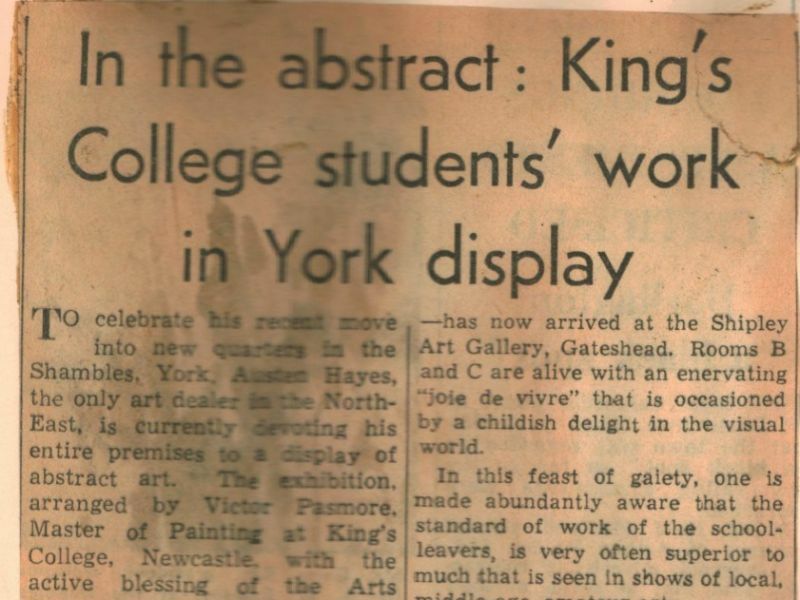 As the reputation of the Kings’ College Fine Art Department developed through the 1950s staff became involved with various external organisations and initiatives. 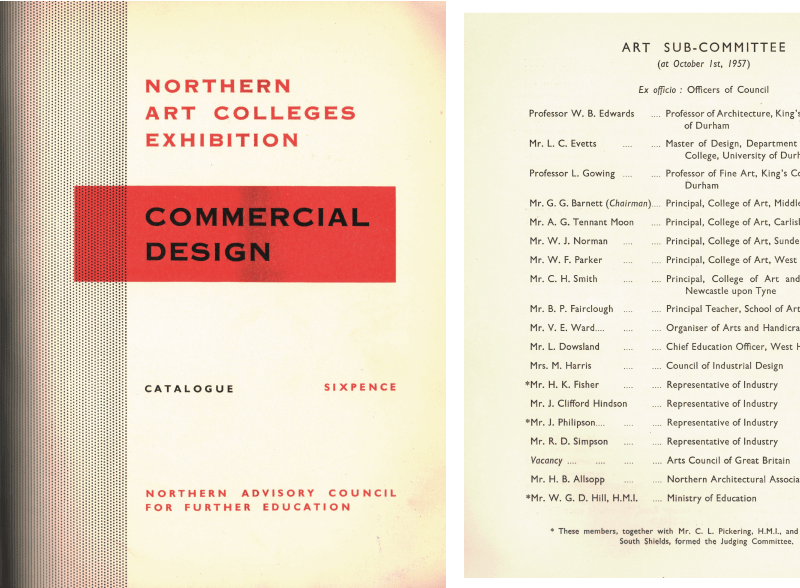 This catalogue of student work in Commercial Design from Northern Art Colleges was organised by the Northern Advisory Council for Further Education. 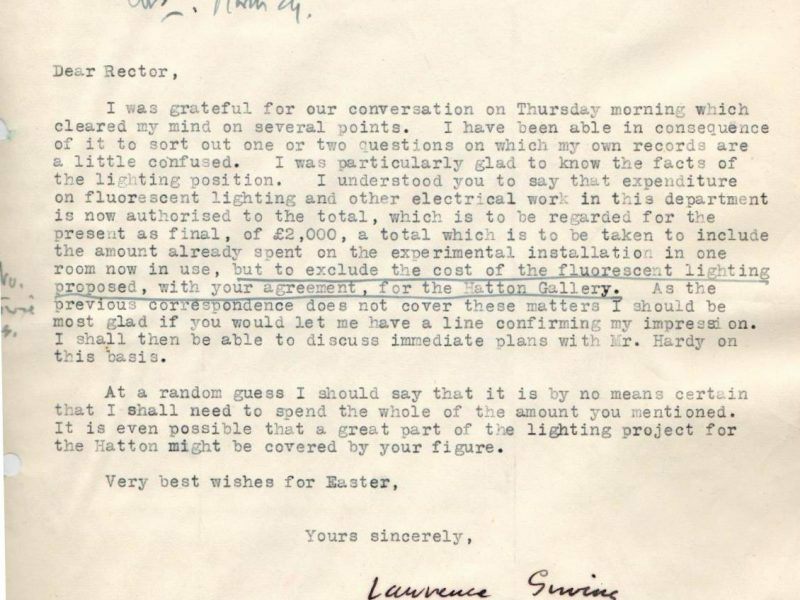 On their Art Committee sat Lawrence Gowing and Leonard Evetts from the Fine Art Department as well as Professor of Architecture, W.B. 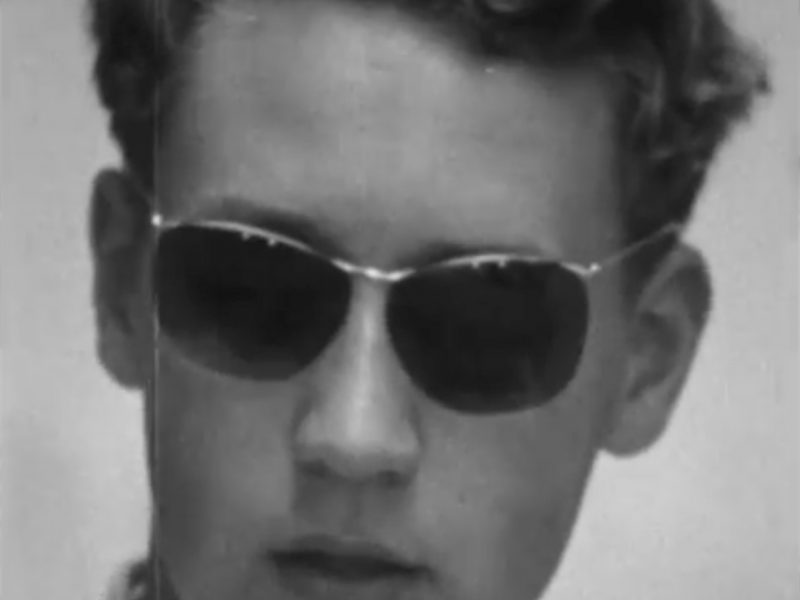 Edwards. 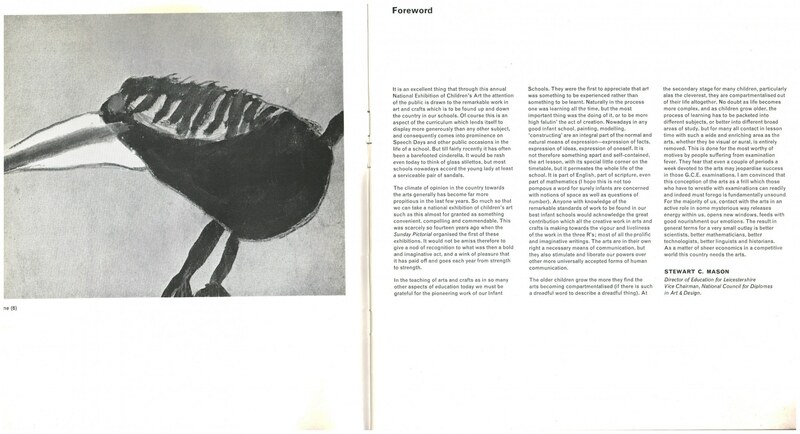 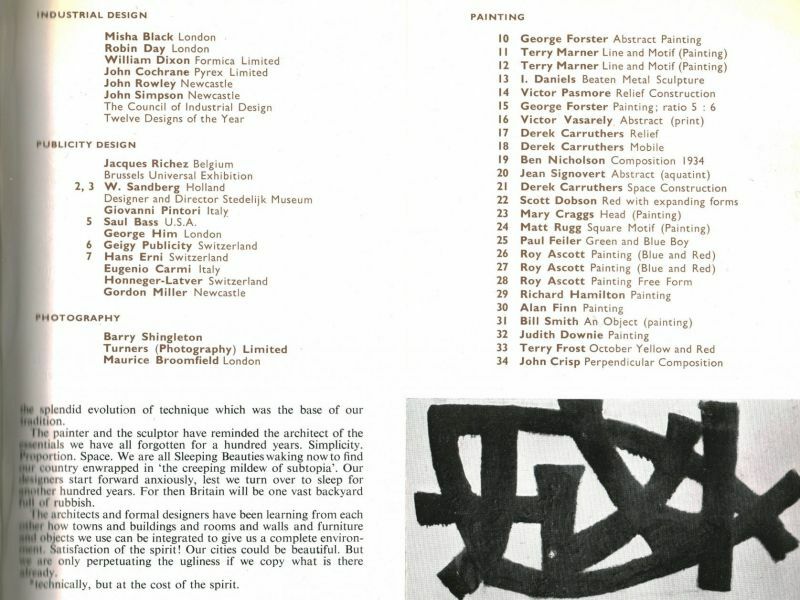 Staff and students were often included in exhibitions beyond the University, this spread showing works by sculpture tutors Murray McCheyne and Geoffrey Dudley is from the catalogue for an ‘Exhibition of Works by Artists of the Northern Counties’ held at the Laing Art Gallery. 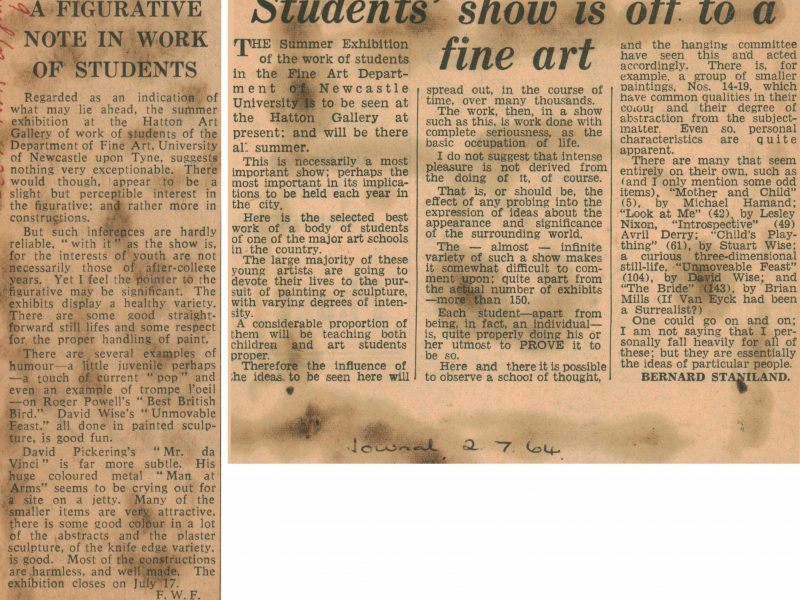 Leonard Evetts was also included, as well as students Scott Campbell, Noel Forster, Brian Sefton, Ronald Dutton and Robin Crozier. 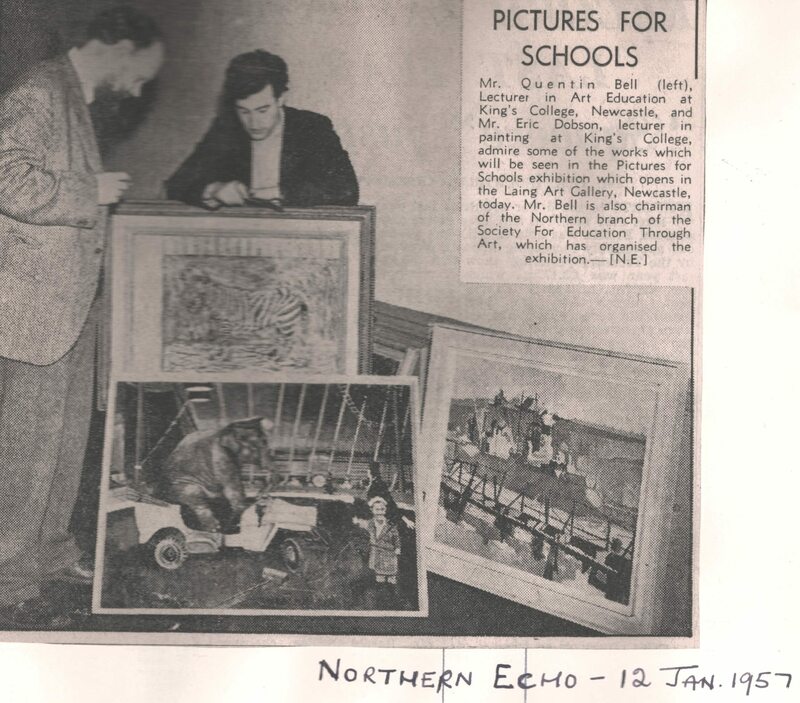 King’s College lecturers Quentin Bell and Eric Dobson are seen here at the Laing Art Gallery assisting with the Pictures for Schools exhibition held there. 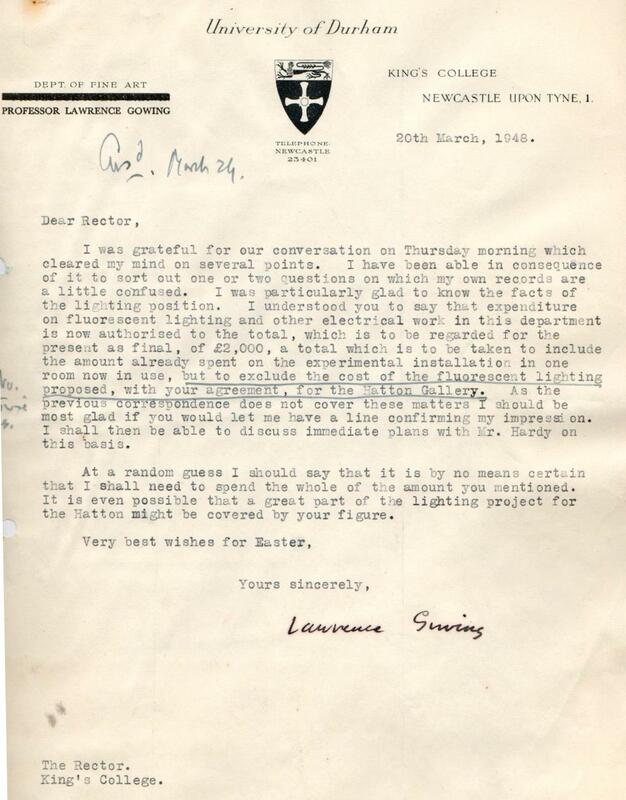 Student alumna Mary Webb (1958-63) describes Gowing’s qualities. 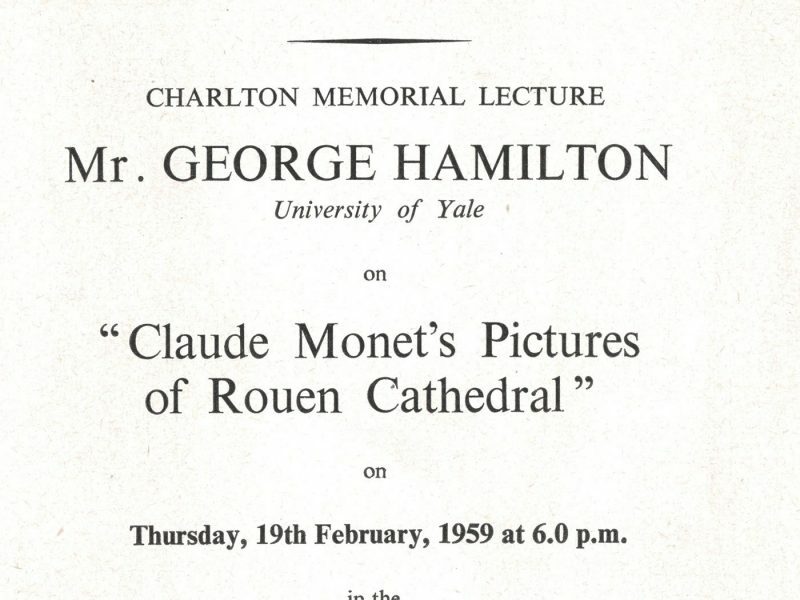 The 1958 Charlton Lecture was postponed from its usual November slot until the following February, presumably in order to allow George Heard Hamilton, Professor of Art History at Yale University (1936-1966) to deliver it. 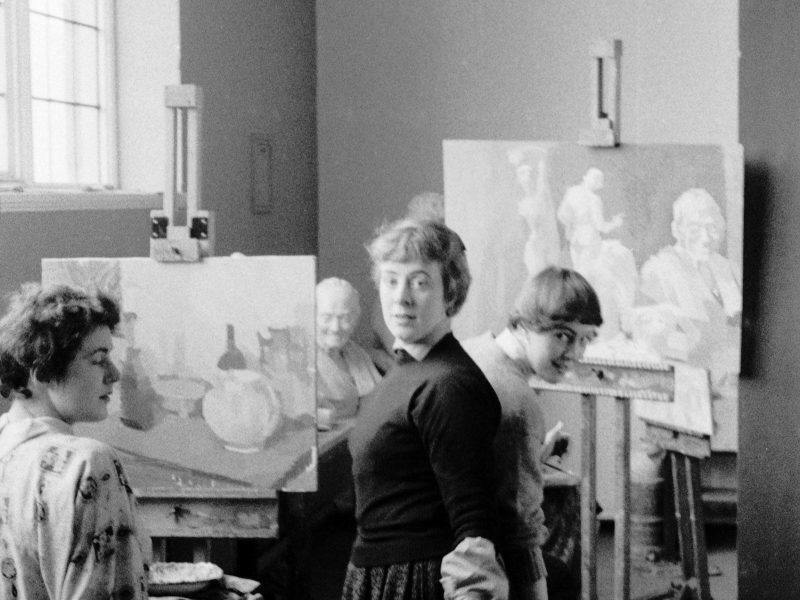 Student alumna Mary Webb (1958-63) recalls Heard Hamilton’s visit. 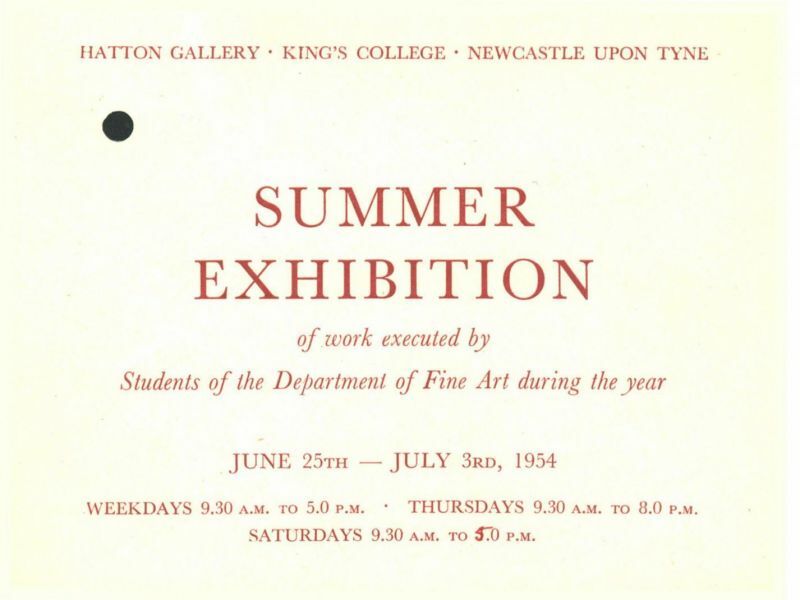 The 1959 Summer Exhibition took place between the departure of Lawrence Gowing and appointment of Kenneth Rowntree as Professor. 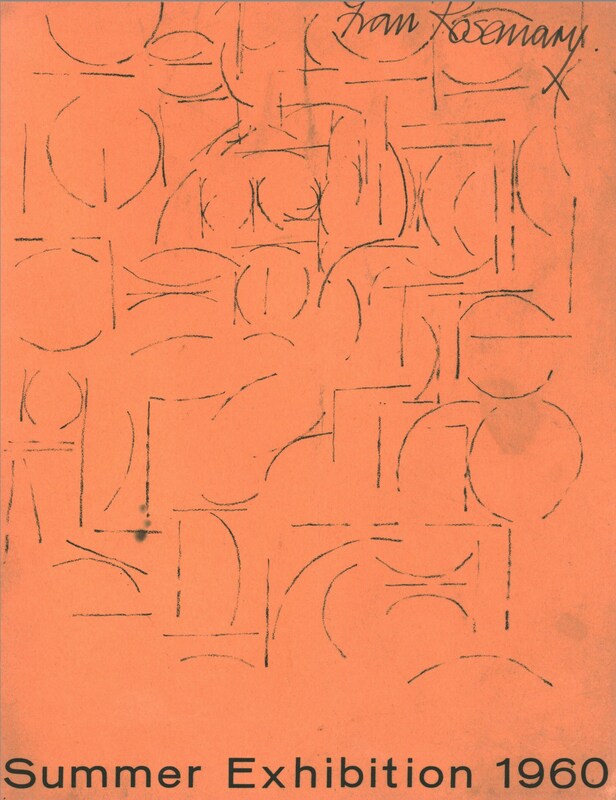 The catalogue lacked an illustrated cover, a simple type-written information deemed sufficient. 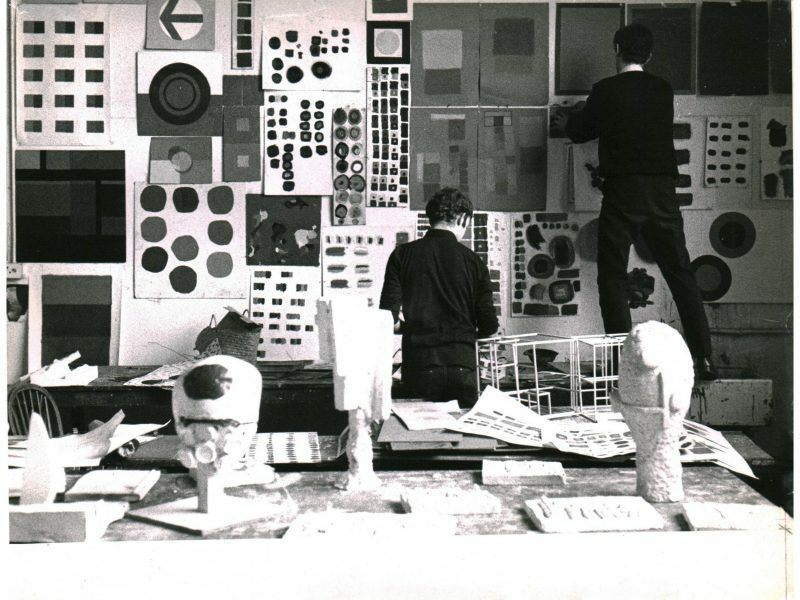 In 1959 the external examiners were Claude Rogers and Bernard Meadows. 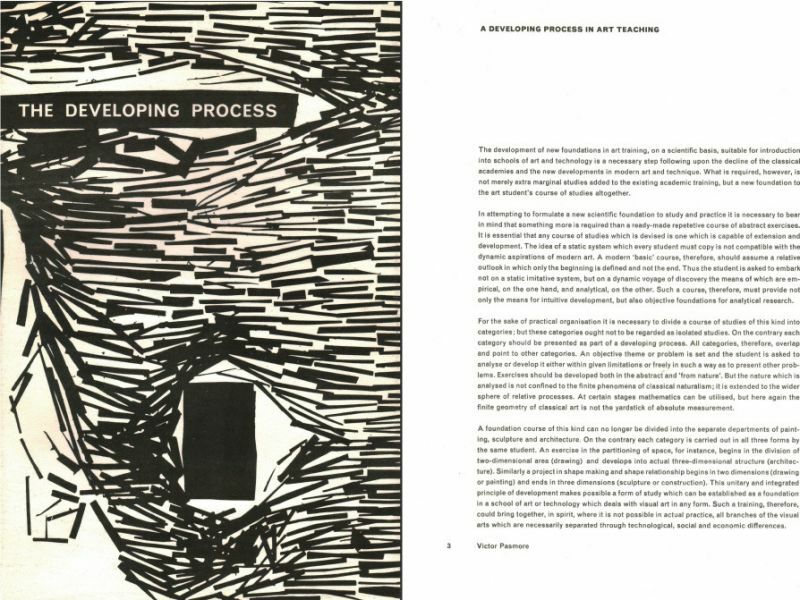 The Developing Process was the first exhibition and publication project that summarised the development of the ‘basic course’ up to that point. 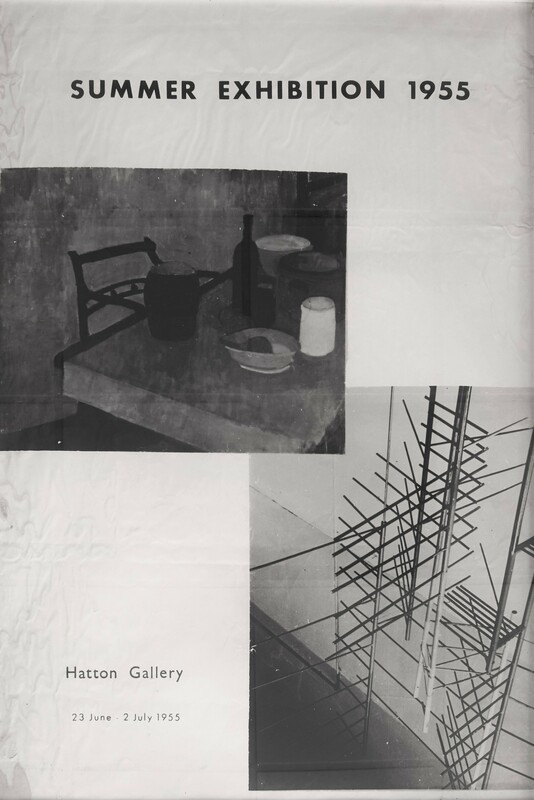 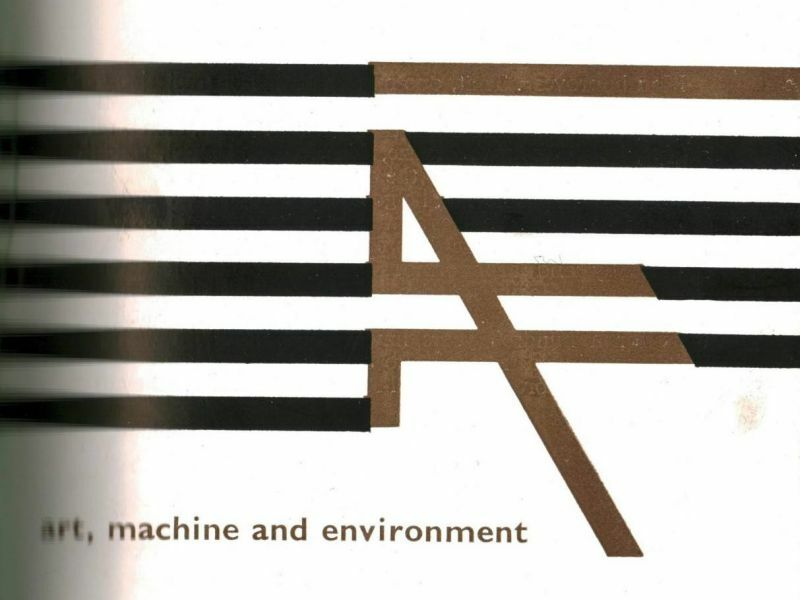 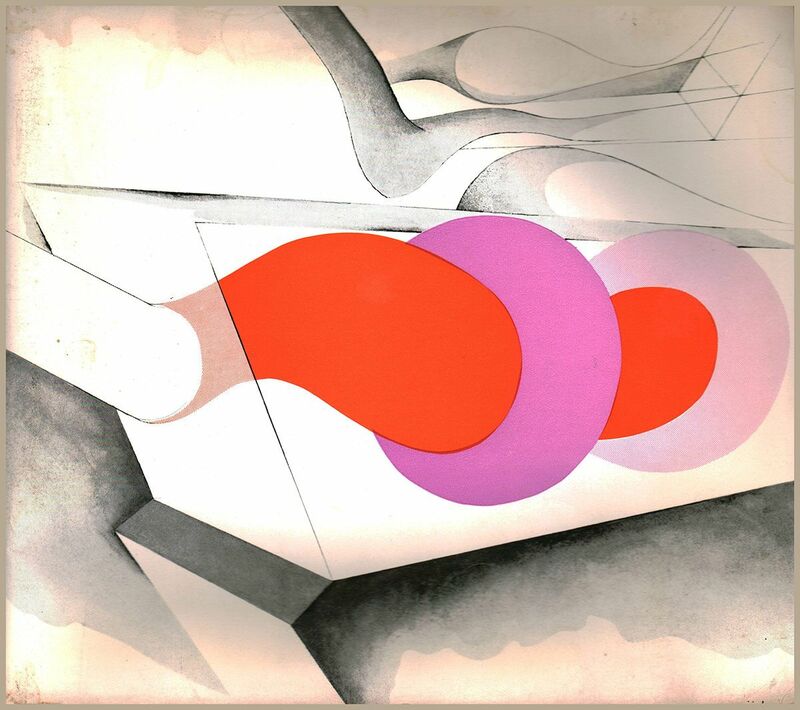 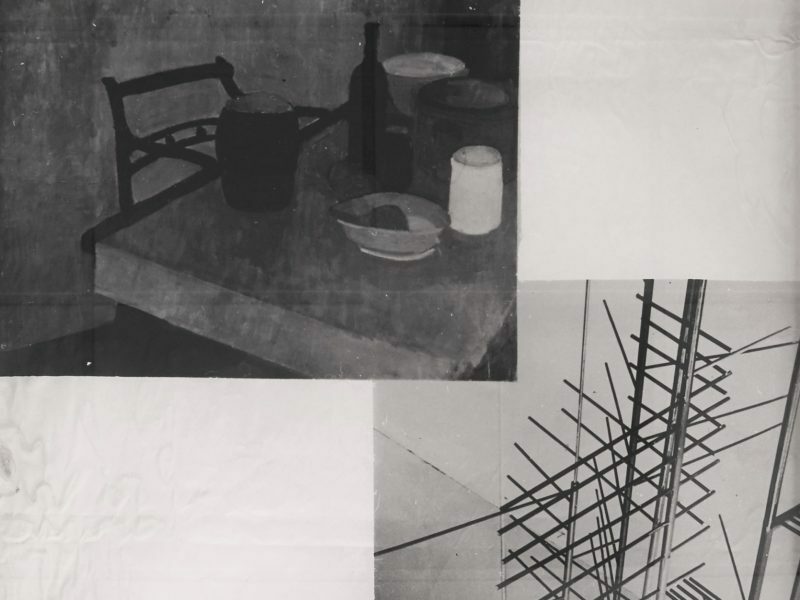 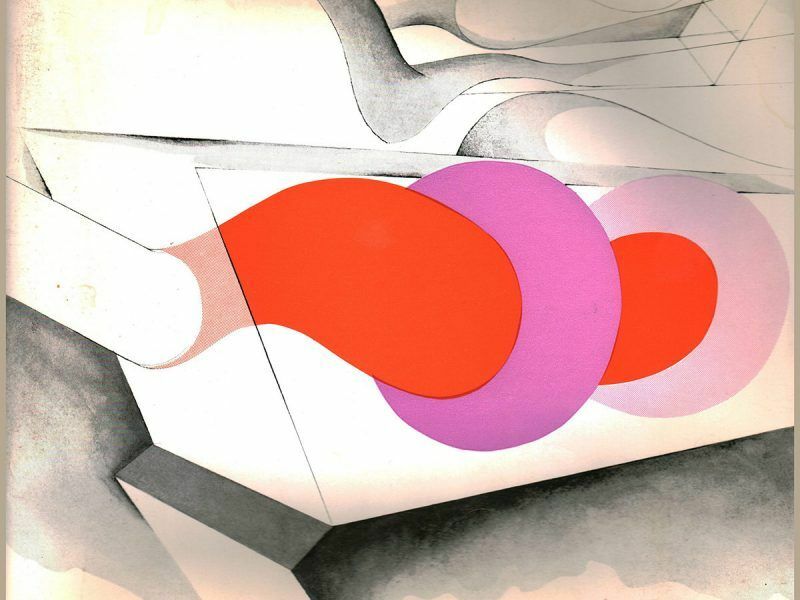 Organised by Victor Pasmore and Richard Hamilton in Newcastle and Harry Thubron and Tom Hudson in Leeds, it was first shown at the ICA in London before touring the country. 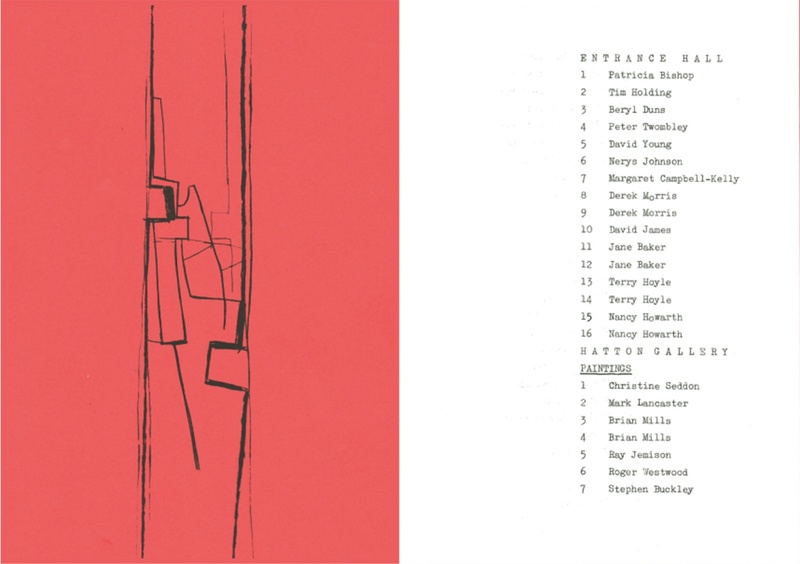 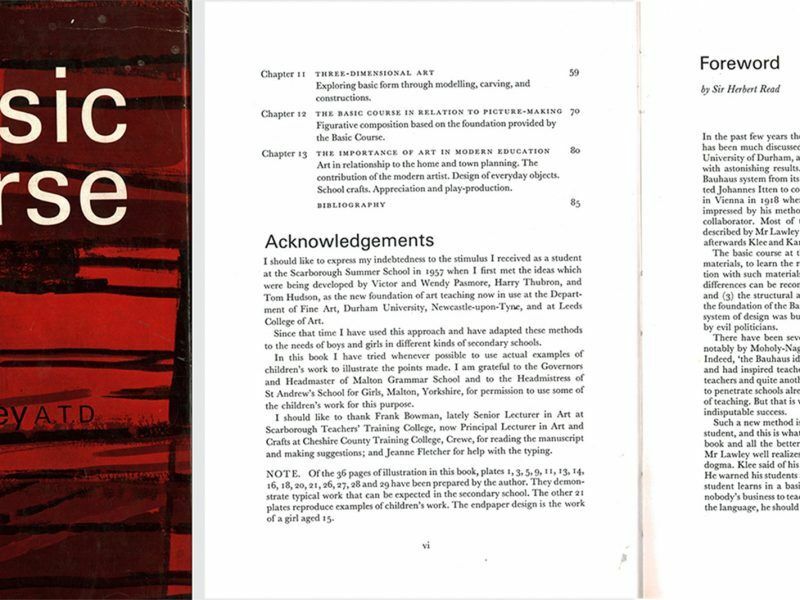 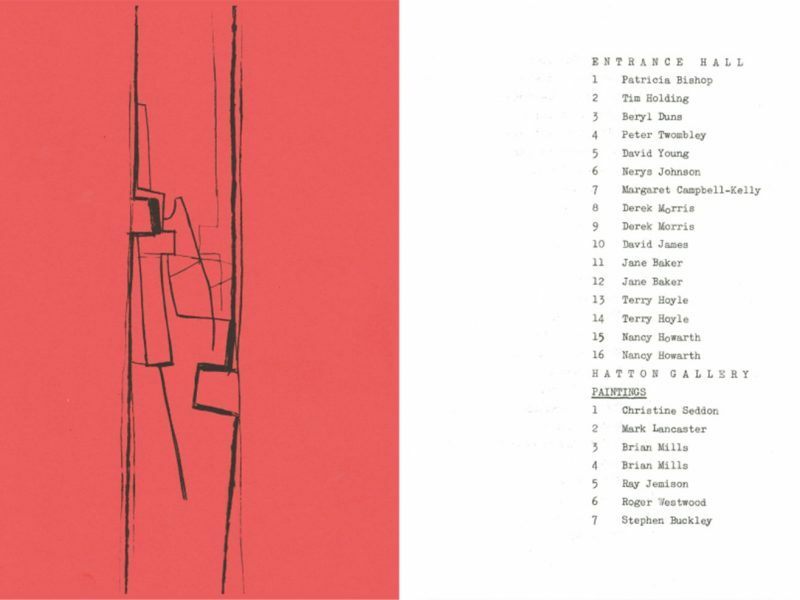 Through texts by the 4 main organisers, as well as Alan Davie, Terry Frost, Geoffrey Dudley and J Ravetz, placed alongside (unattributed) examples of students’ work, the catalogue aimed to explain both the underlying principles of the ‘basic course’ and the intention behind specific exercises (as in in Hamilton’s text ‘Diagrammar’). 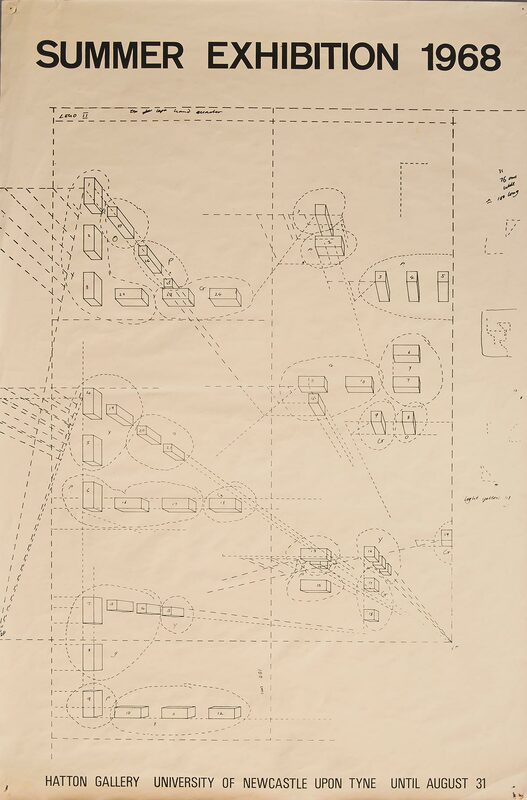 Hamilton explained that the objective behind the exercise on the left was to represent ‘forces’ or a ‘kinetic situation’ through the use of signs. 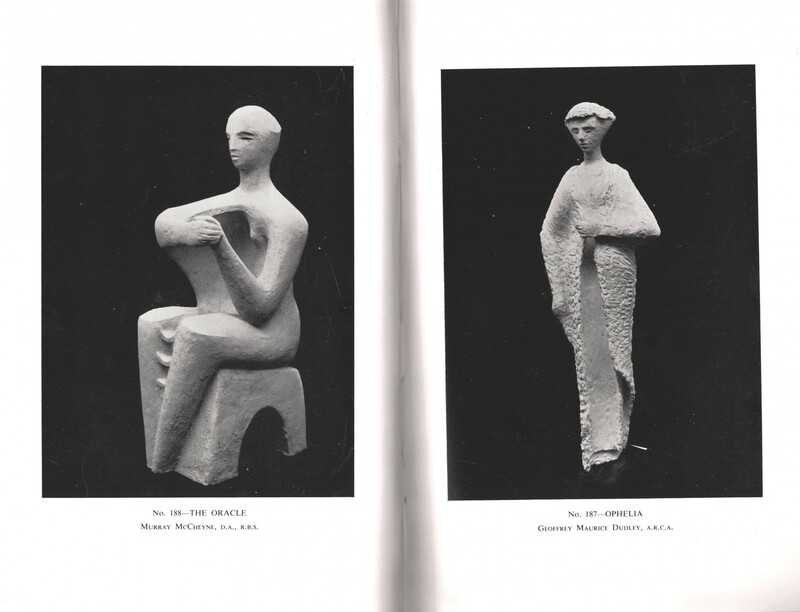 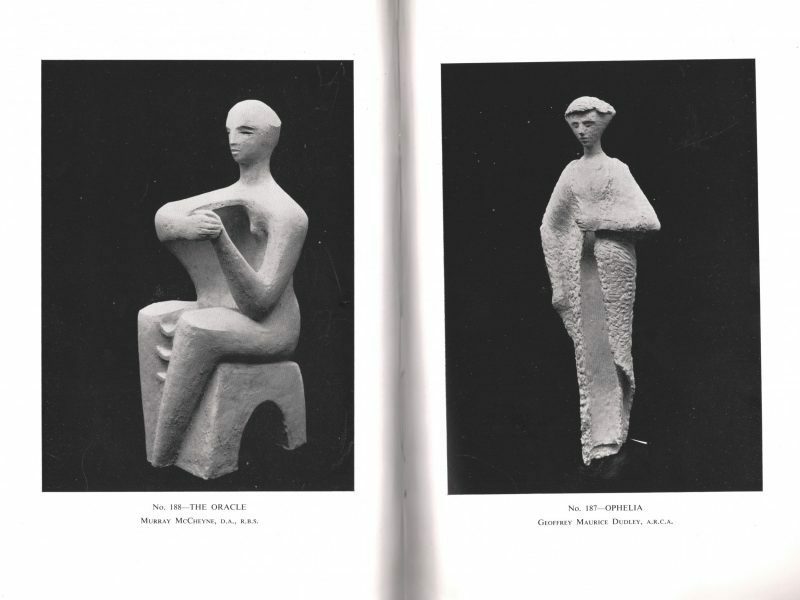 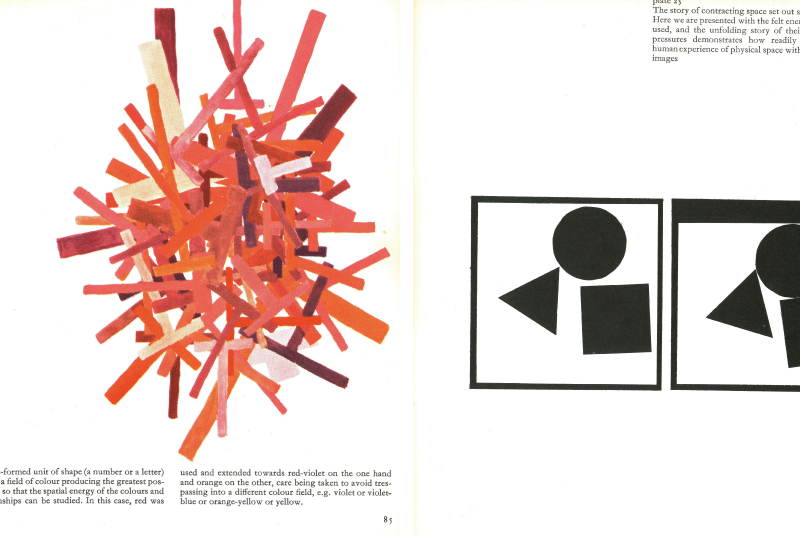 The image on the right by Kathleen Brown (Kate Stephenson) is described as a ‘space filling exercise’, with a specific aim of not repeating any particular ‘configurations’. 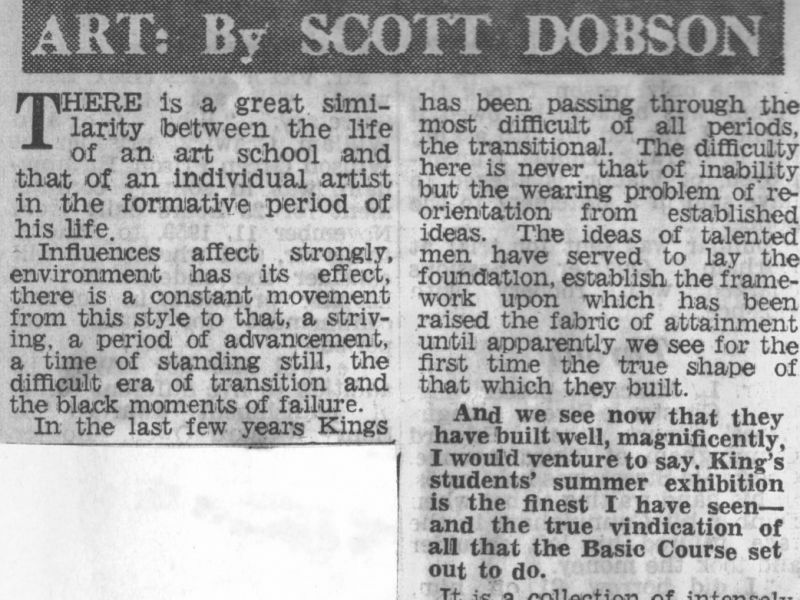 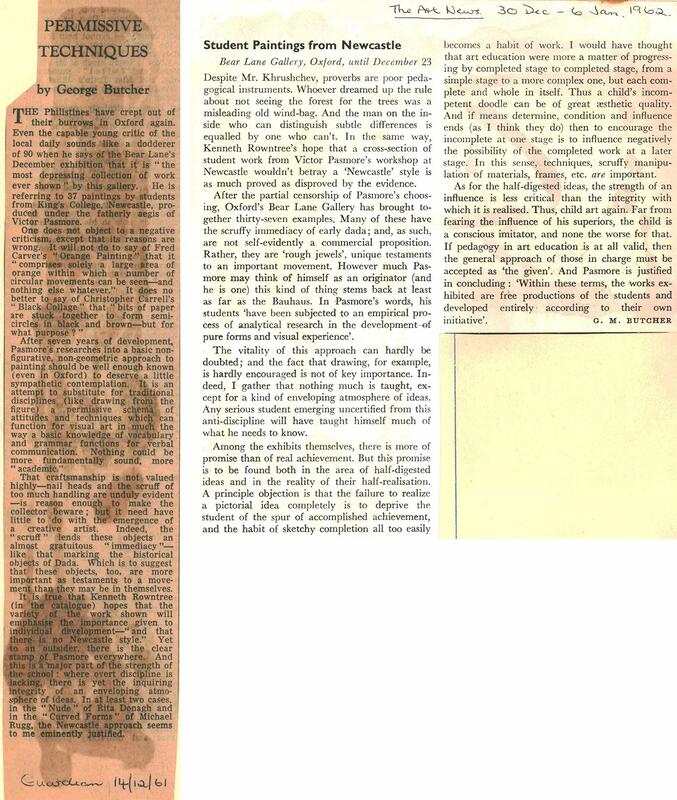 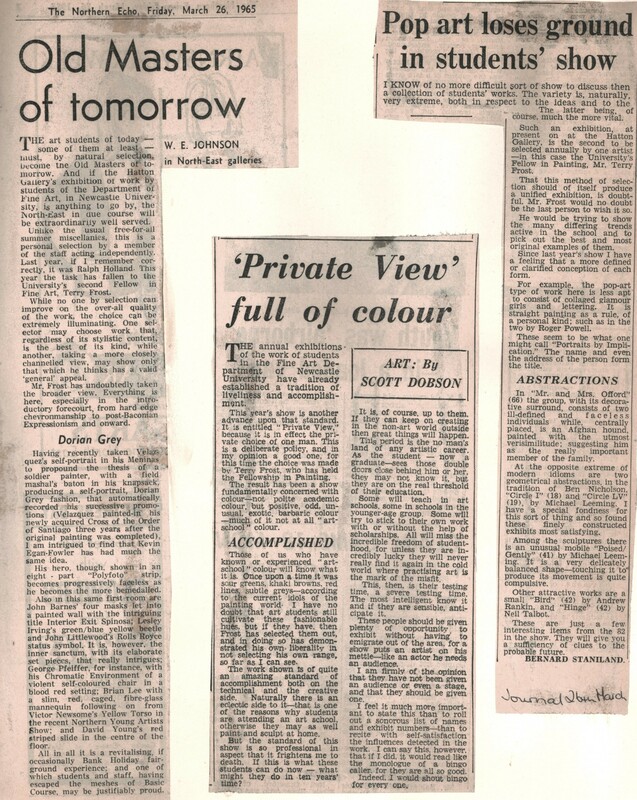 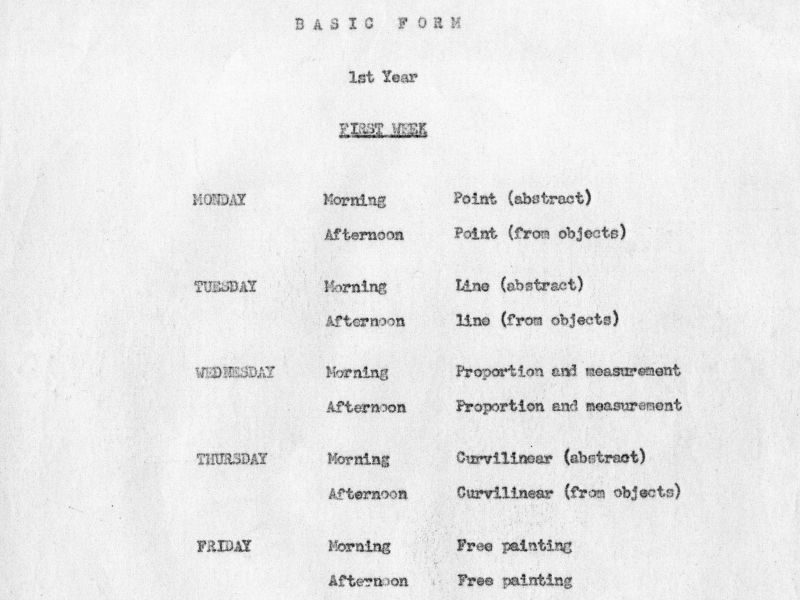 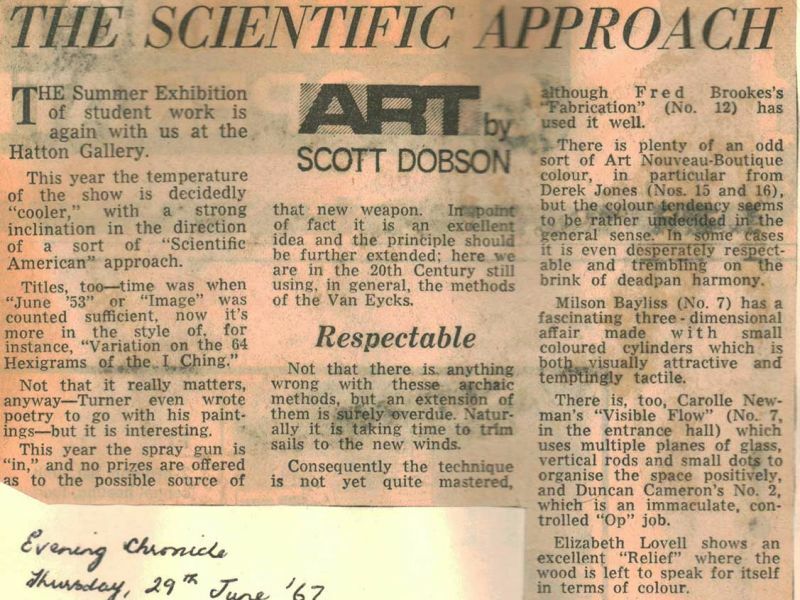 Scott Dobson’s review from the Evening Chronicle of The Developing Process, as seen at the Laing Art Gallery in 1960, emphasises the source in nature of many of the principles of the ‘basic course’, but rather than the ‘literal motif’, ‘the underlying forms…and the world that microscope has made know to us’. 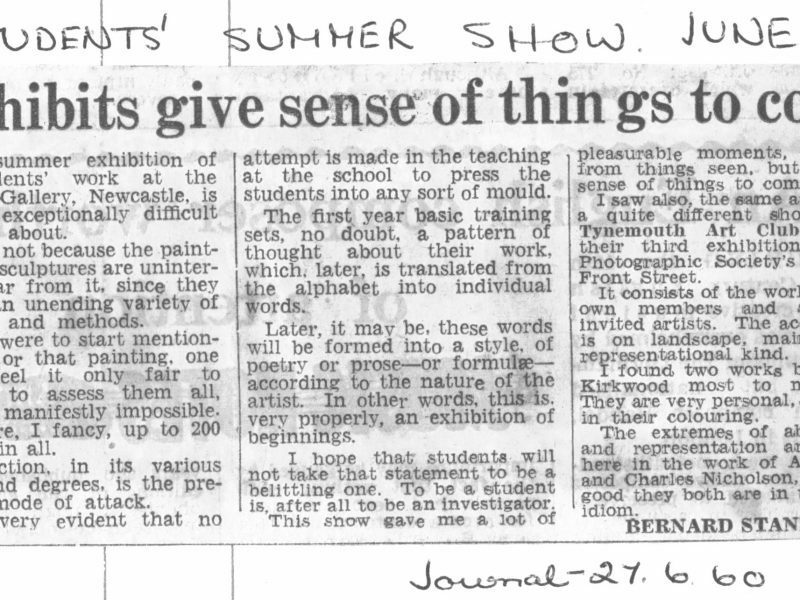 Like many artists and writers at the time he identifies the risk of the ‘basic course’ leading to a specific style and students being led into imitating the work of their tutors. This cartoon of the entrance hall to the King Edward VII building depicting staff and students of the time is a wonderful evocation of college life at the time. 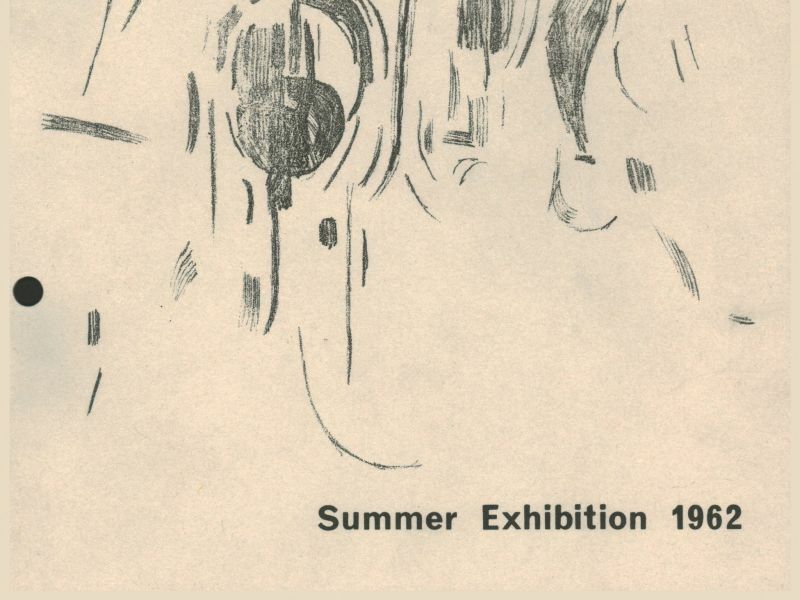 Drawn by Hillary Williams in 1961, among the identifiable figures are in the bottom right hand corner, l-r Eric Dobson, Victor Pasmore and Scott Campbell. 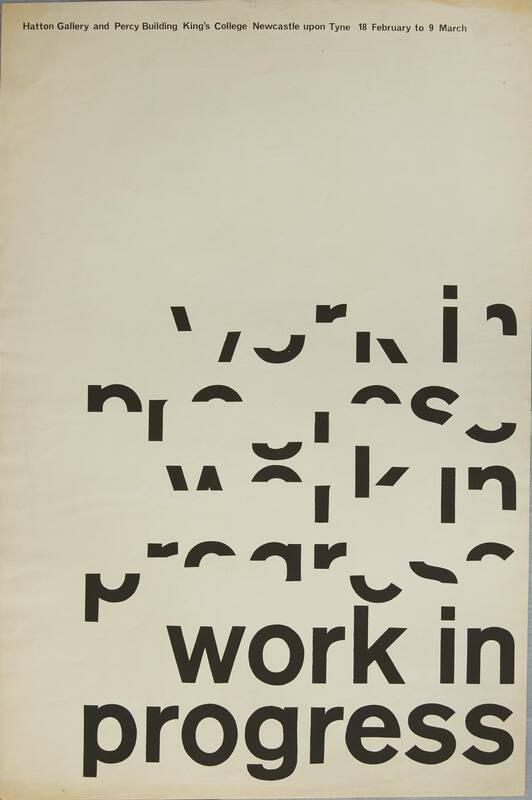 (image courtesy of Pat Kremer). 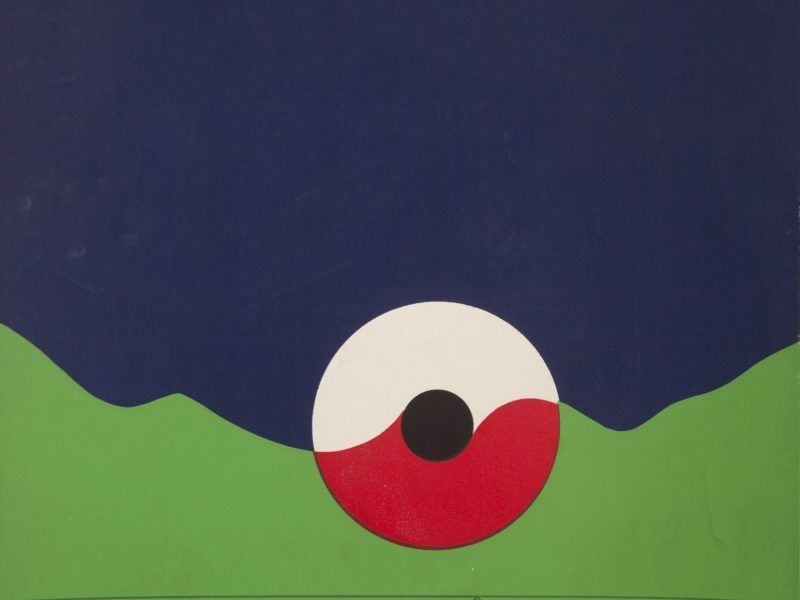 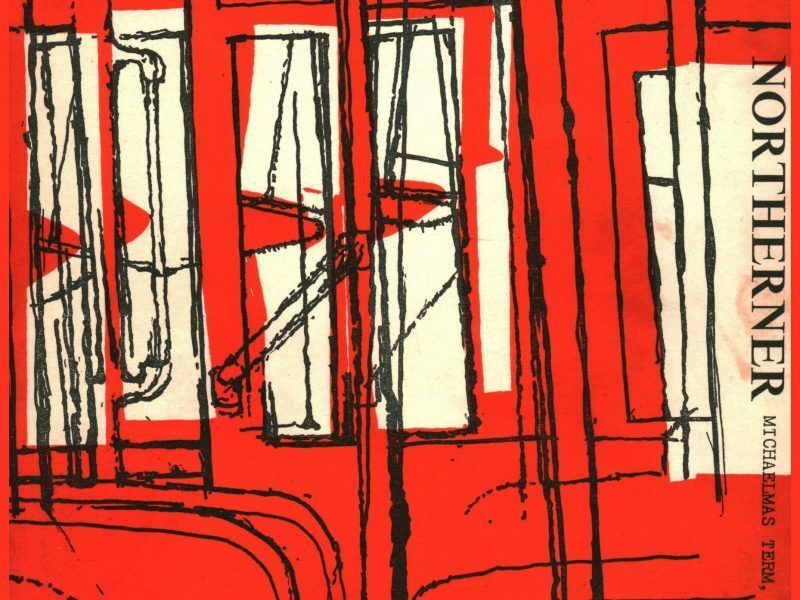 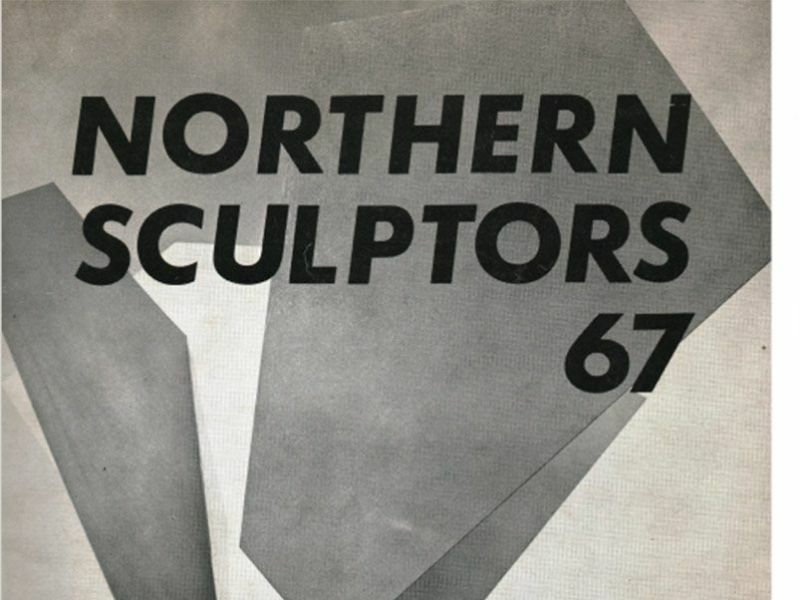 The cover of the 1961 edition of the student-led magazine The Northerner was designed by Rita Donagh. As would also be the case with the exhibition of students’ work in Oxford later in the year, when Newcastle students showed their work outside the local area, they still attracted considerable press attention. 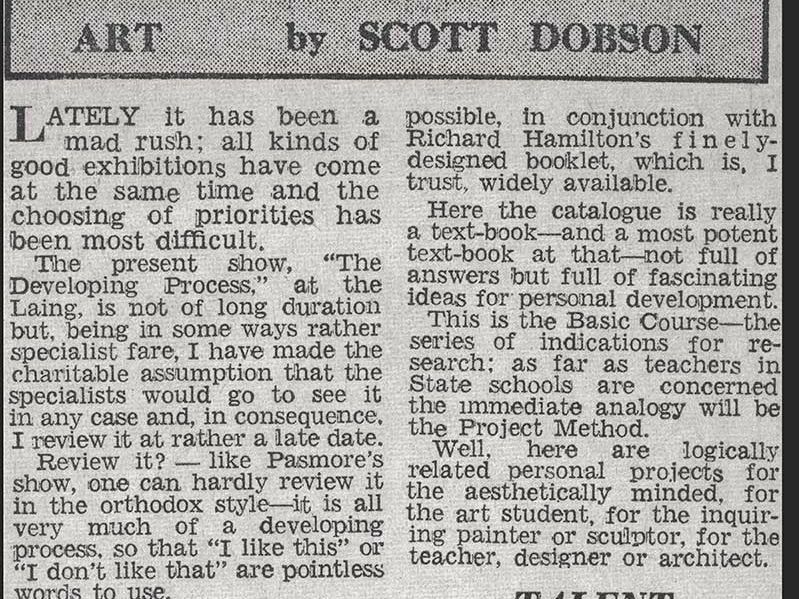 Here the Sunday Sun adopts an outraged ‘is this a joke’ position in relation to a ‘Young Contemporaries’ exhibition in London, focused on the price and materials used in the works. 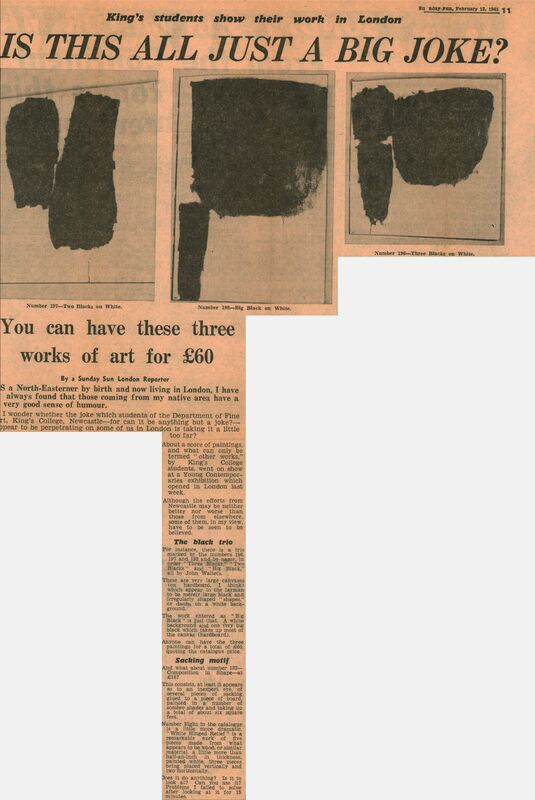 Three paintings by future BBC Radio 1 producer John Walters are reproduced and singled out for attention. 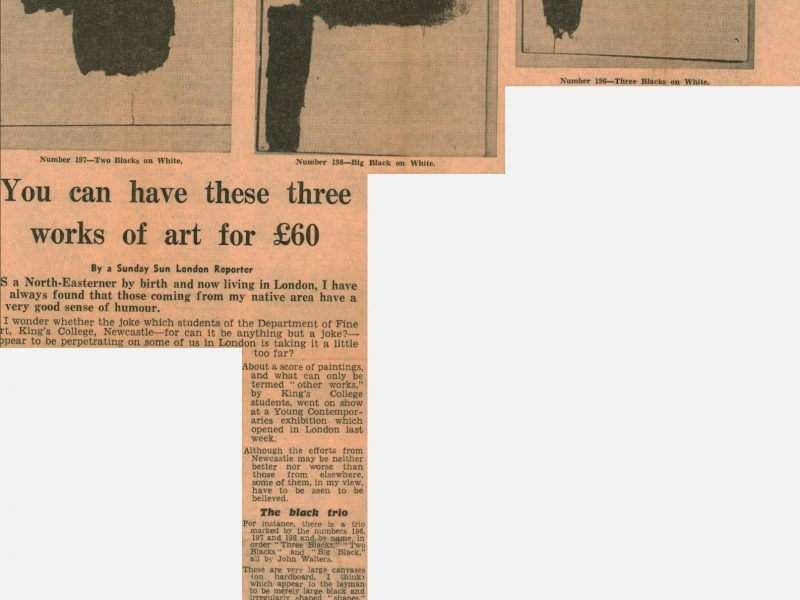 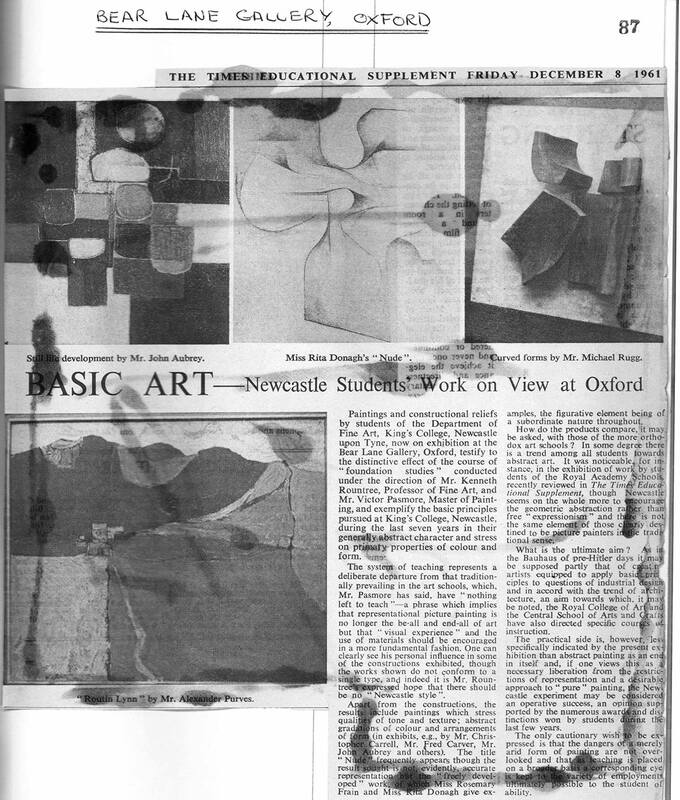 The exhibition in Oxford in December 1961 of 37 works by students of the Fine Art Department attracted press that might not usually have covered such displays in Newcastle, including the Times Educational Supplement, Art News and the Guardian. 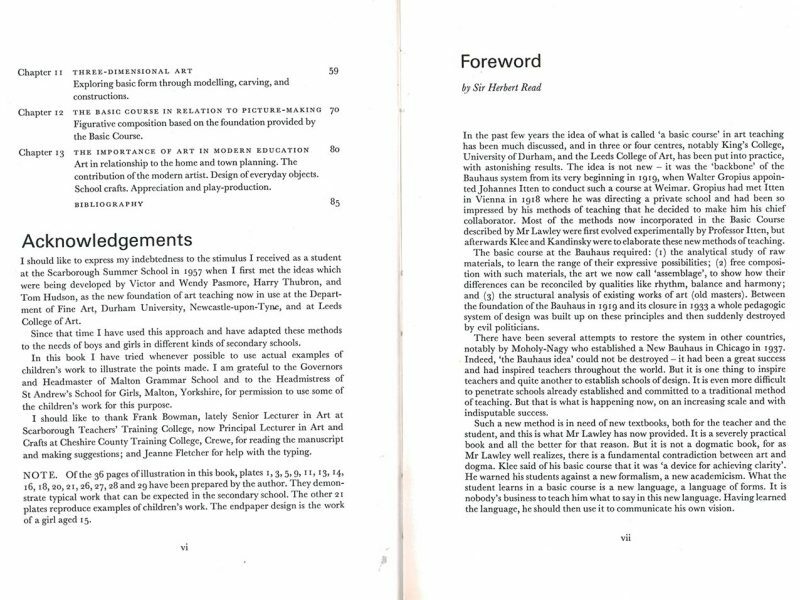 The TES reproduced works by John Aubrey, Alexander Purves, Rita Donagh and Matt Rugg, the latter two also being singled out for mention in George Butcher’s article in the Guardian. 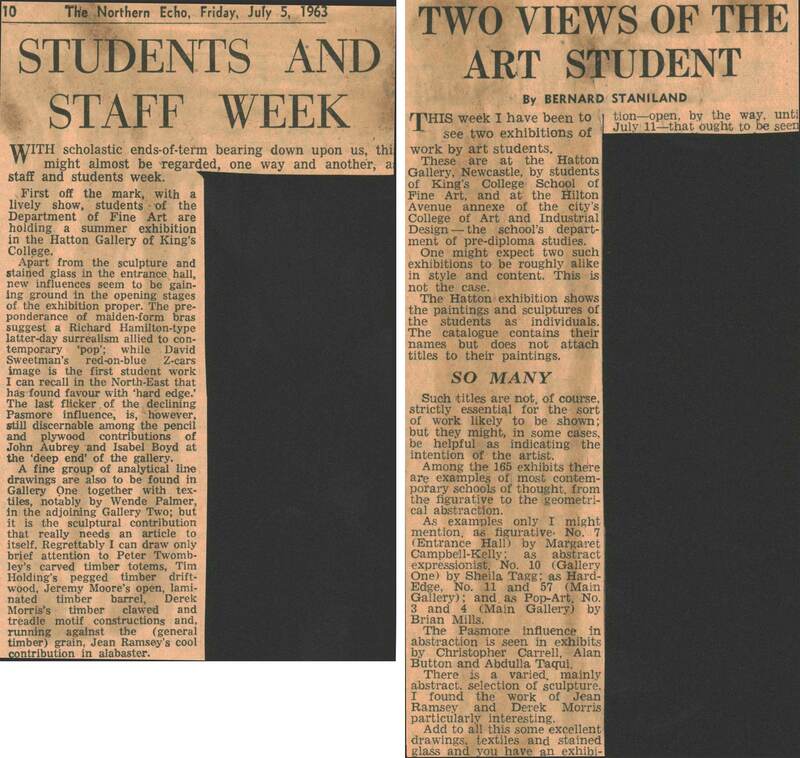 Both these reviews of the exhibition at the Bear Lane Gallery, Oxford attempt to give a sense of what the ‘basic course’ under Pasmore involved, and while both identify a general scruffiness in these abstract experiments, they agree with the hope Rowntree stated in the catalogue, that the work didn’t all conform to a particular ‘Newcastle style’. 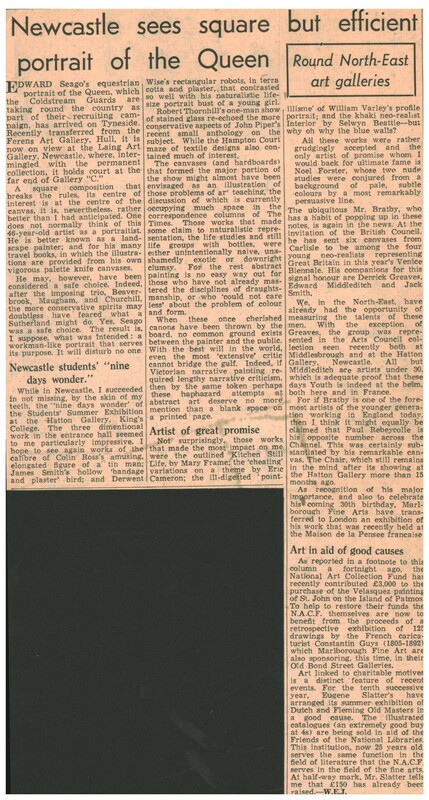 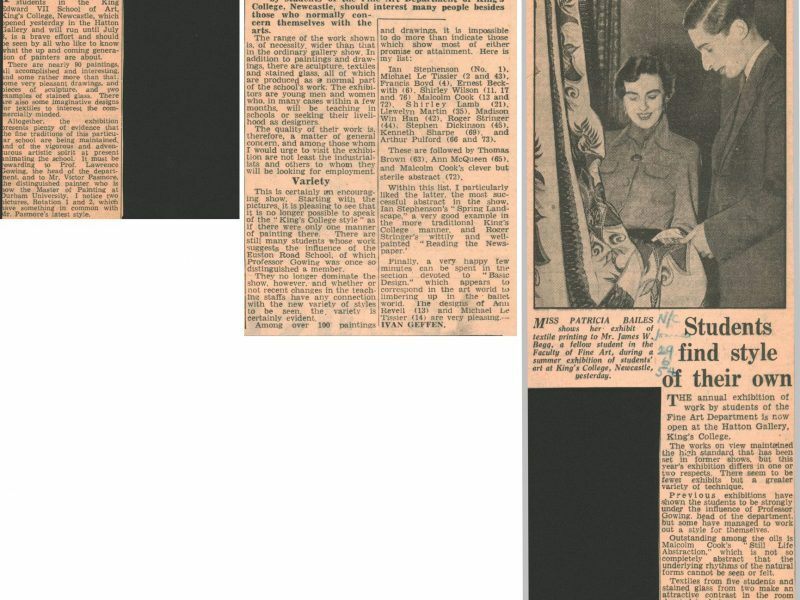 This press article from early 1961 reports on a valedictory luncheon party to mark Pasmore’s departure from Newcastle. 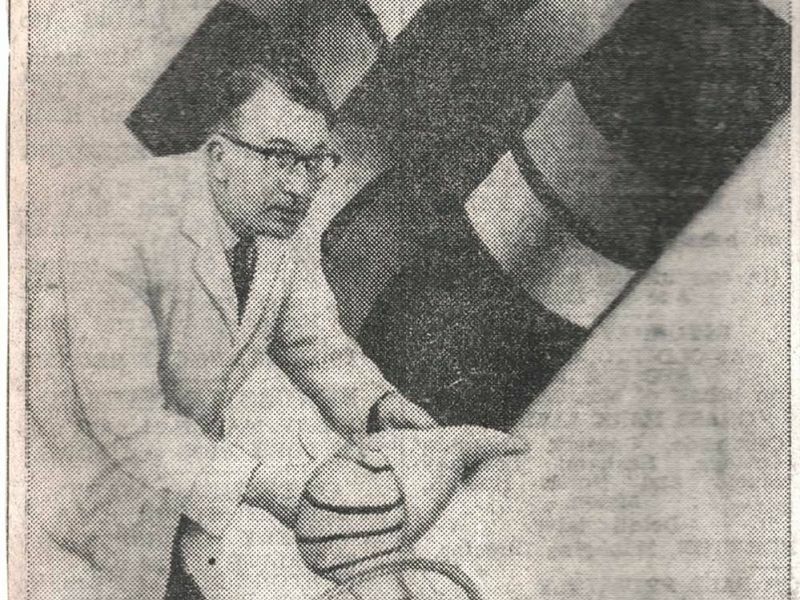 Having signed up with Marlborough Fine Art and exhibited in the British Pavilion at the Venice Biennale in 1960, he clearly thought it was time to focus full time on his non-teaching career. 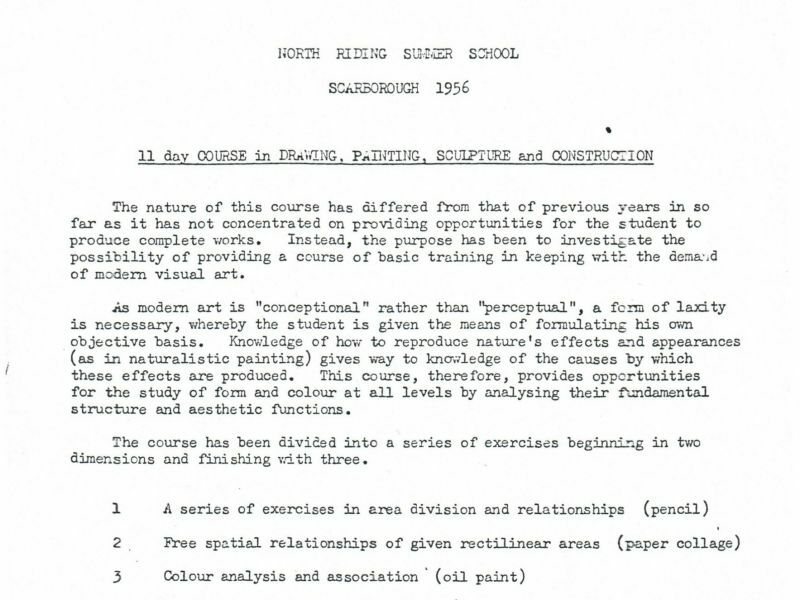 Lawley particularly acknowledges the impact and stimulus of the 1957 Scarborough Summer School led by Victor & Wendy Pasmore, Harry Thubron and Tom Hudson. 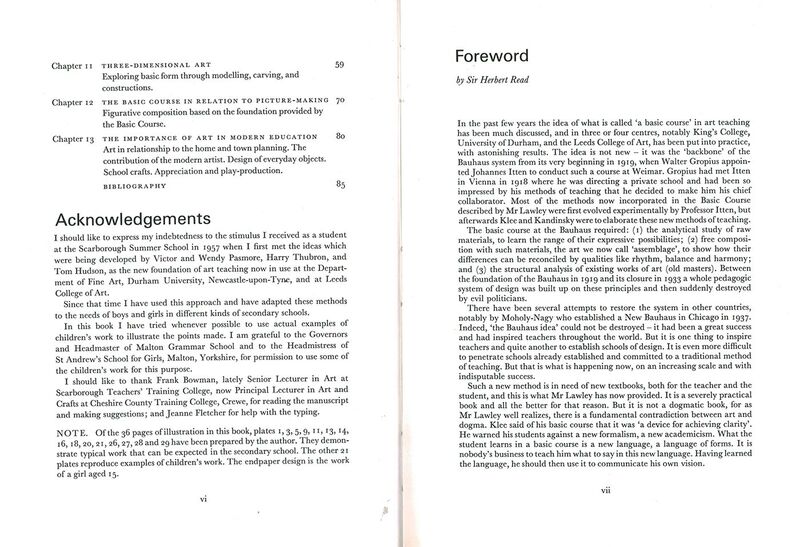 Sir Herbert Read’s Foreword notes that where a ‘basic course’ has been put into a practice is has achieved ‘astonishing results’. 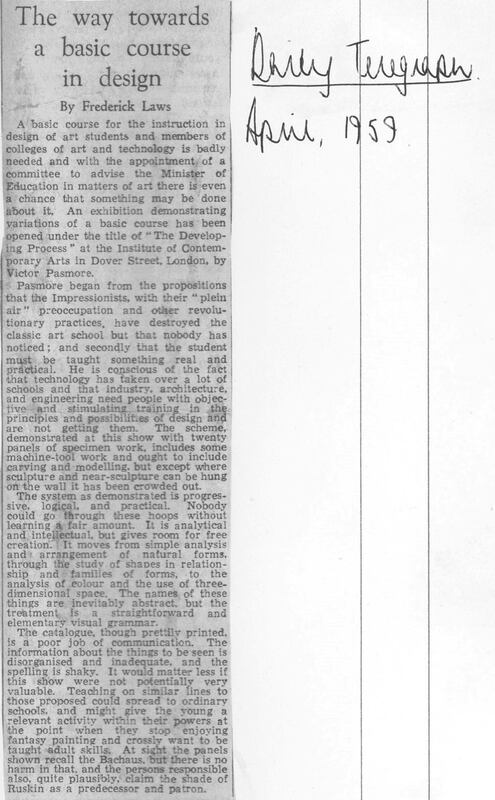 Warning against possible stylistic dogmatism, he concludes ‘What the student learns in a basic course is a new language, a language of forms. 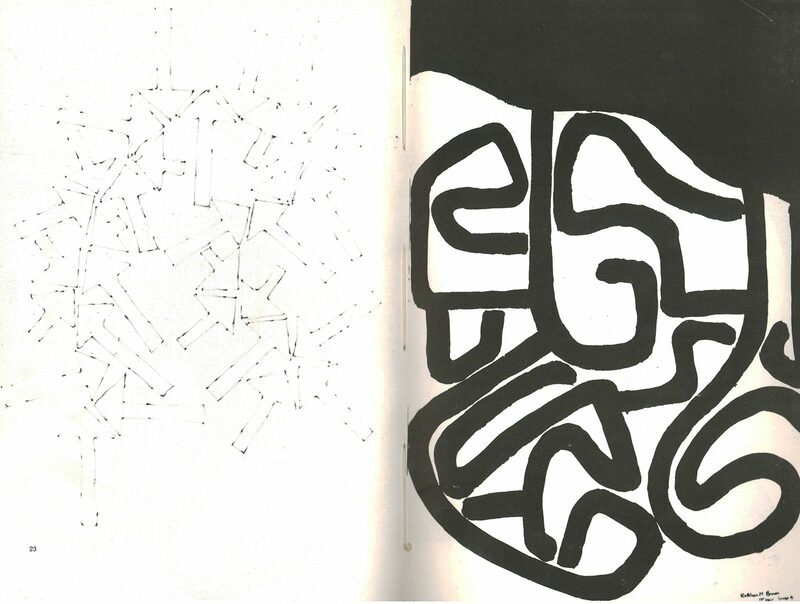 It is nobody’s business to teach him what to say in this new language’. 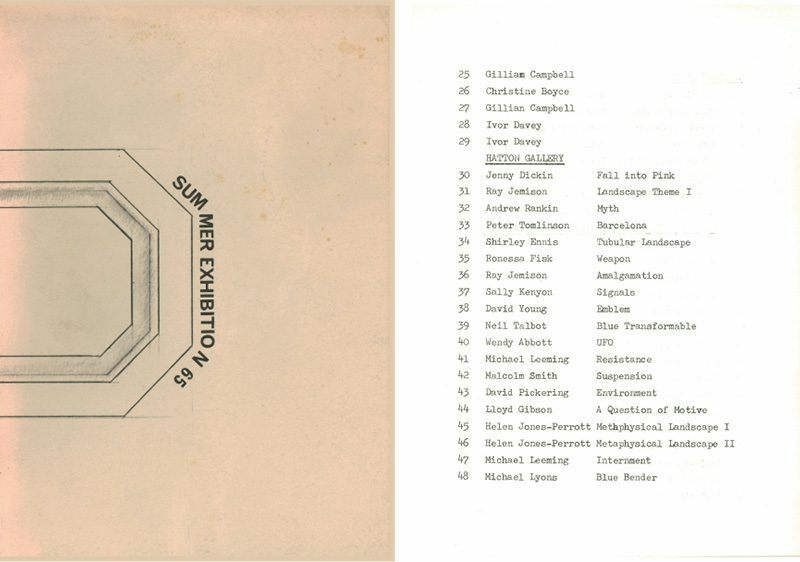 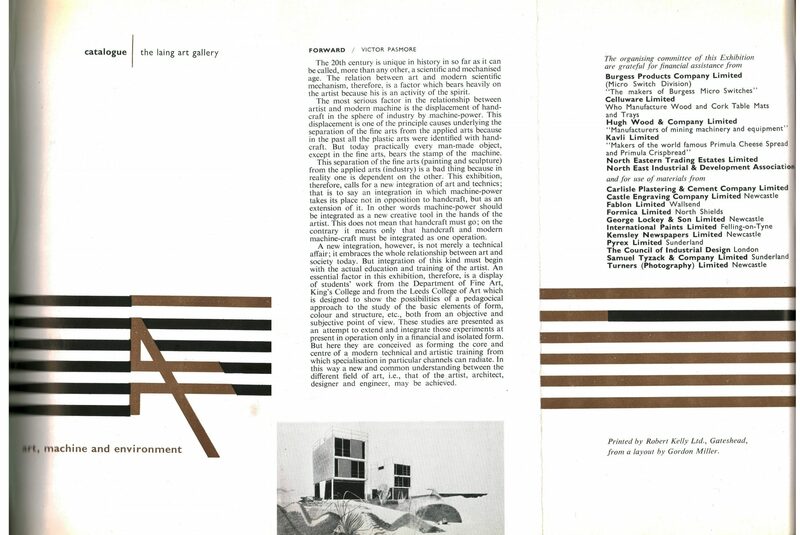 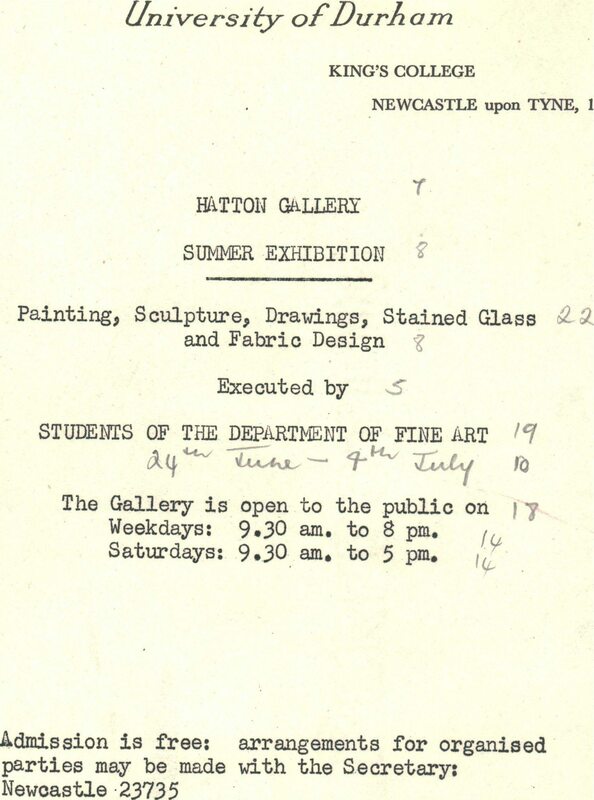 The 1962 student Summer Exhibition catalogue with annotated front page. 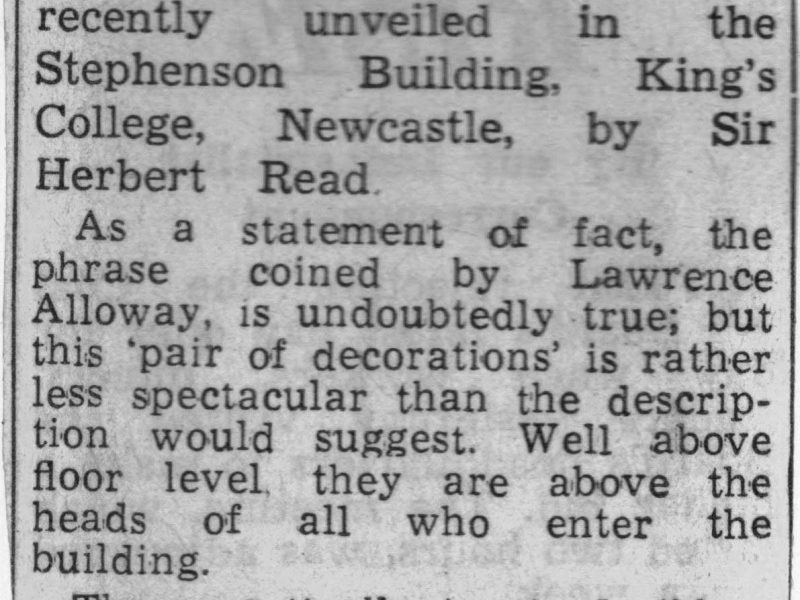 In 1962 the external examiners were Robert Clatworthy and William Scott. 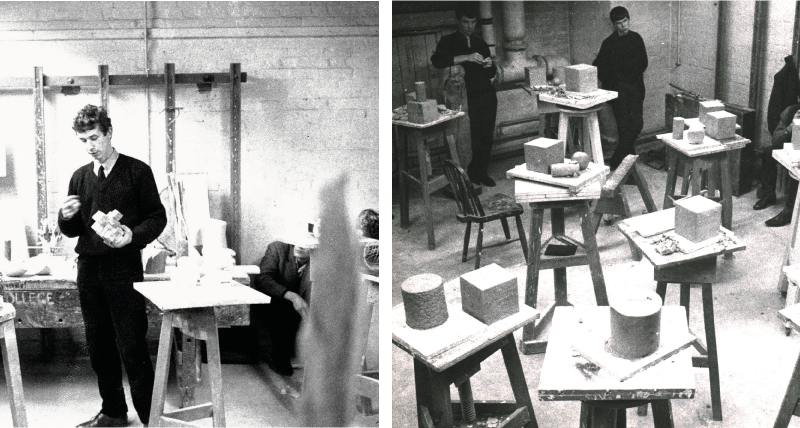 Working in three dimensions was a central part of the ‘basic course’, which placed great emphasis on spatial relations. 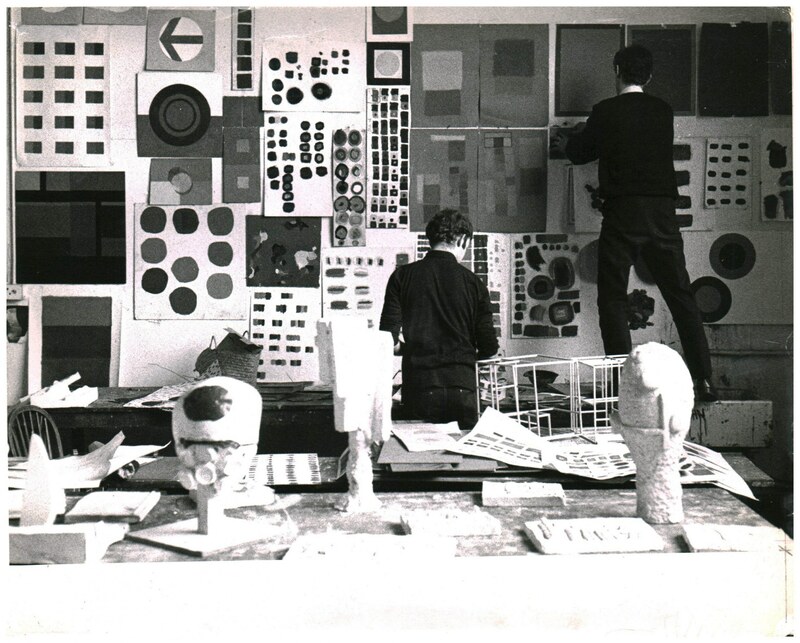 On the left Matt Rugg, who on graduating had been taken on as a Studio Demonstrator, can be seen leading a session in the sculpture studio. 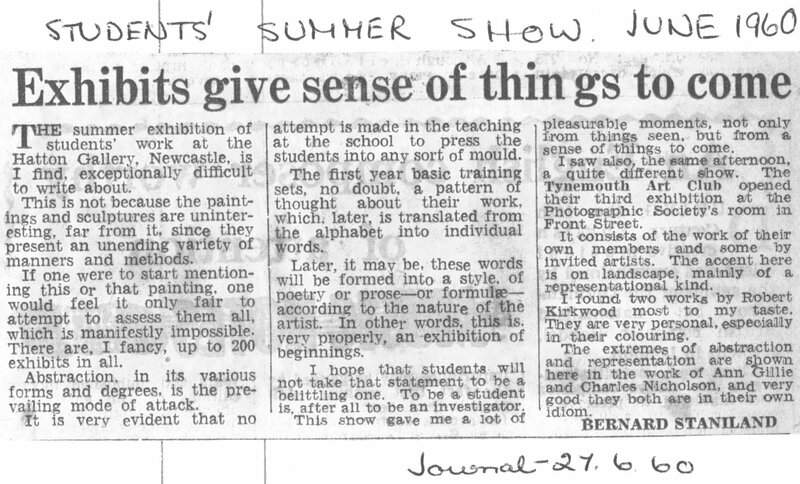 Derek Morris admires works in fellow student Rita Donagh’s final show. 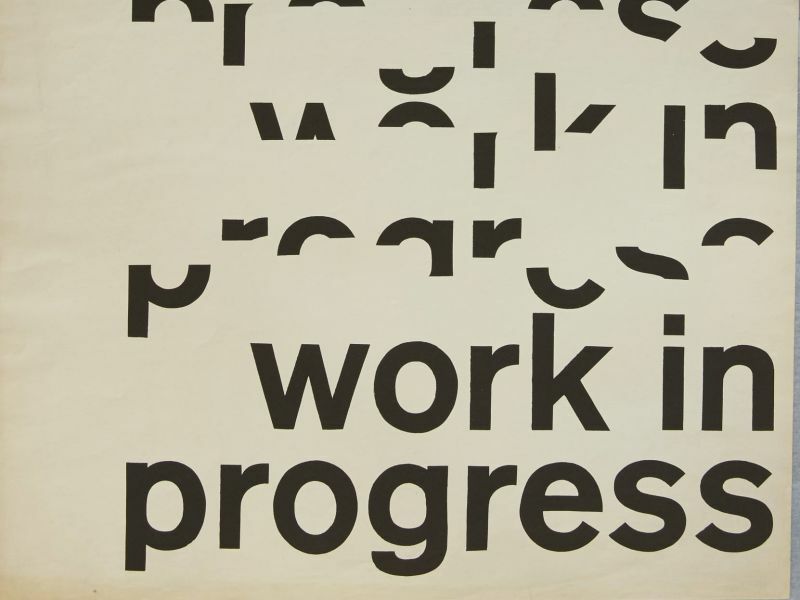 (image courtesy of Mary Webb). 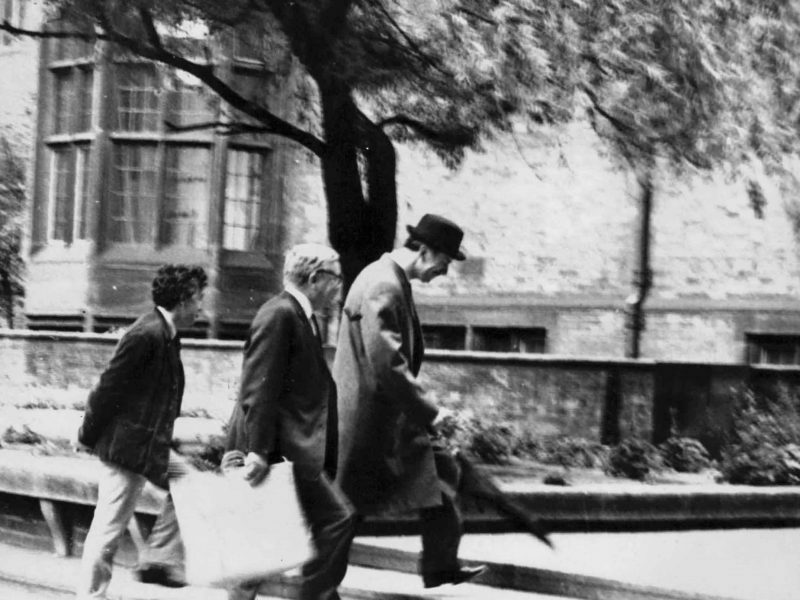 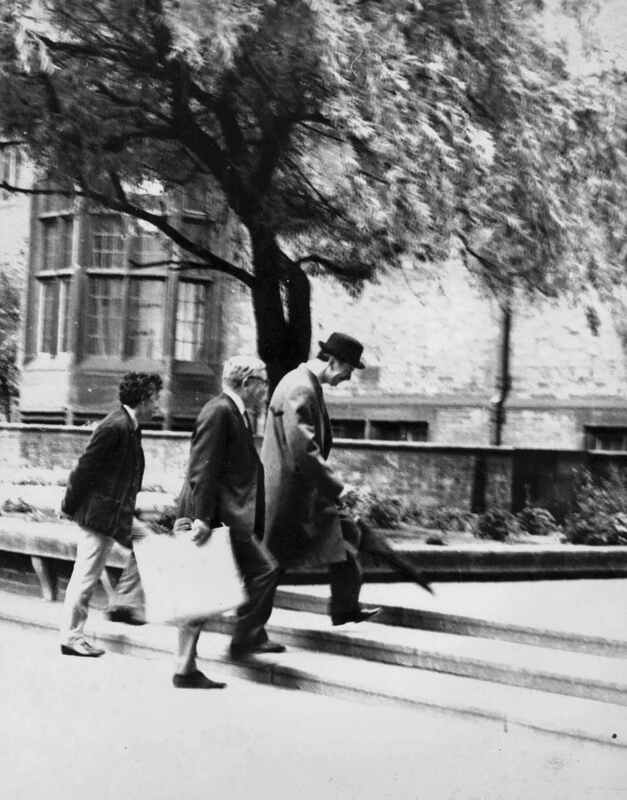 Art Historian Ralph Holland leads Professor Kenneth Rowntree and tutor Eric Dobson up the steps from The Quadrangle to the entrance of the King Edward VII building. (Photograph by Ralph Selby, courtesy of Mary Webb). 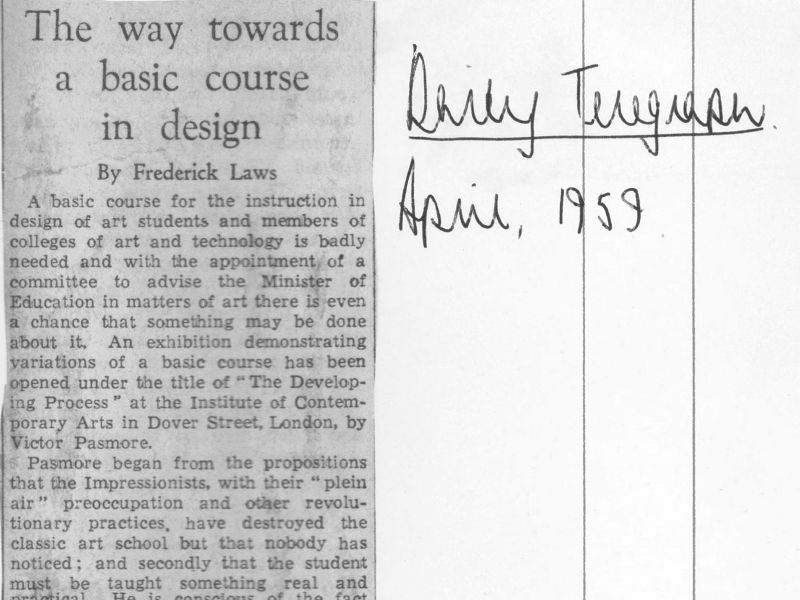 Many of the artist-teachers who first conceived ‘Basic Design’ were very interested in ‘Child Art’, believing it to be produced with fewer preconceptions and greater freedom of expression than that of adults. 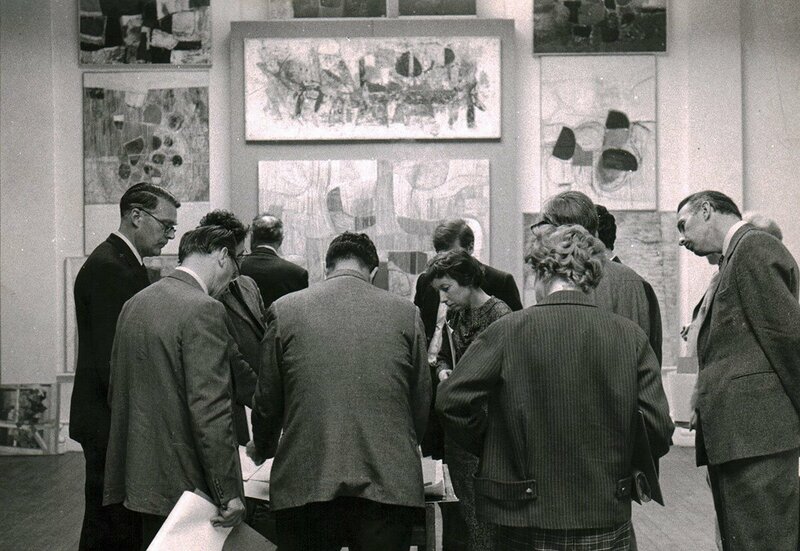 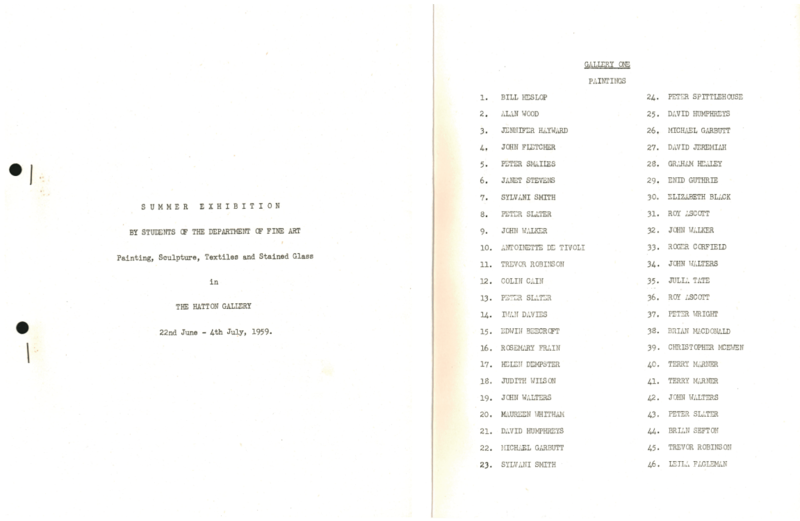 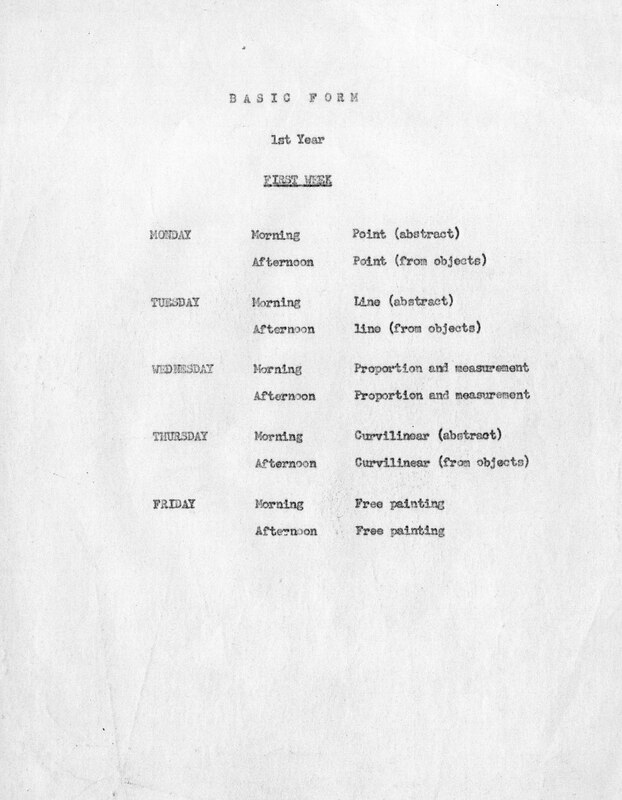 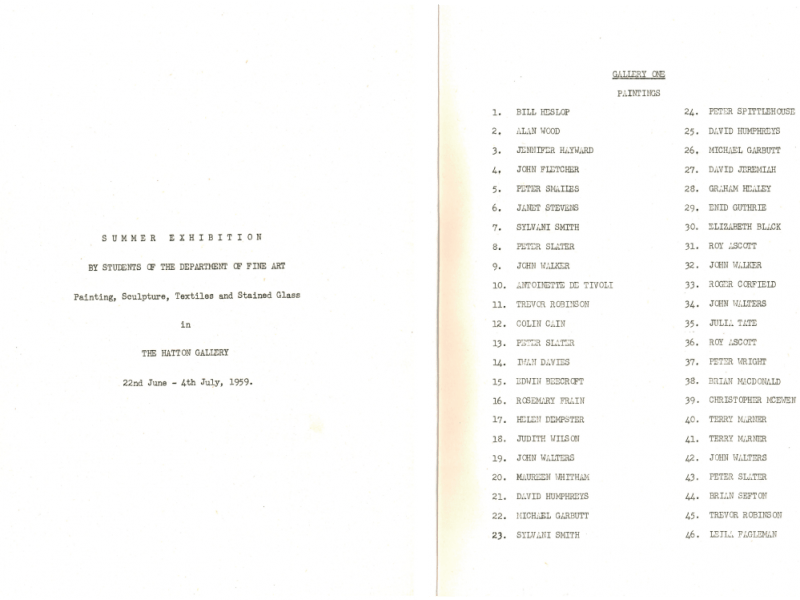 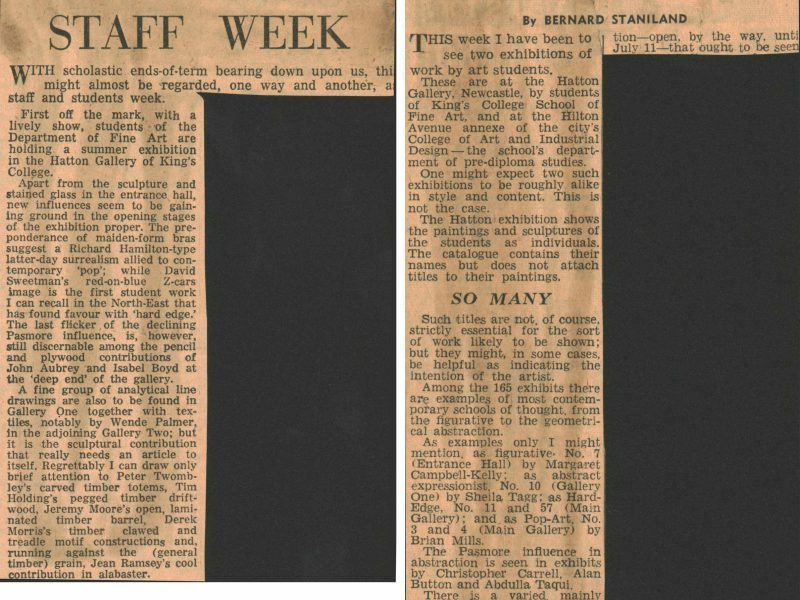 It is interesting to note that the Advisory Committee for the touring Sunday Pictorial National exhibition of Children’s art, which toured to the Laing Art Gallery in 1962, included Herbert Read, Eduardo Paolozzi and Victor Pasmore, and the preliminary selection committee included Tom Hudson, one of the originators of the ‘basic course’. 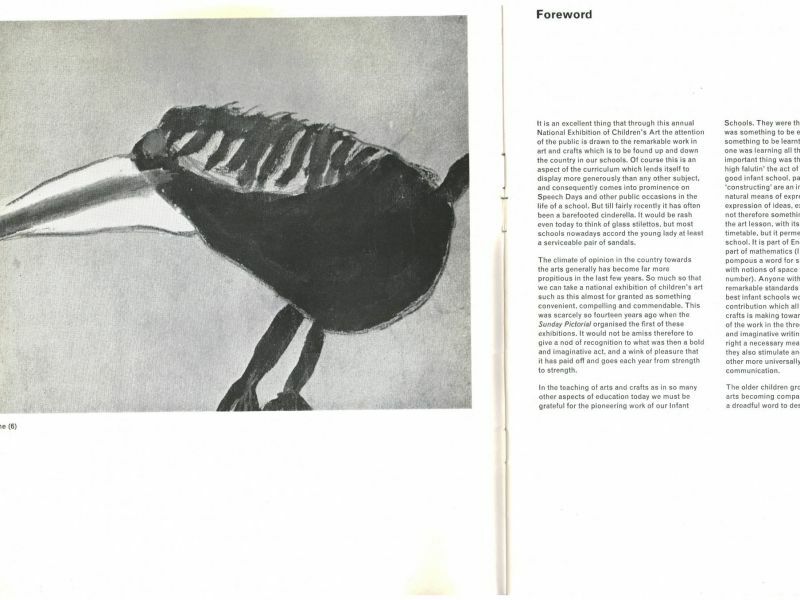 Leslie Lawley’s book was one of the first widely available books to describe ‘a ‘basic course’ in art’, though he focused more on the teaching of school children than students. 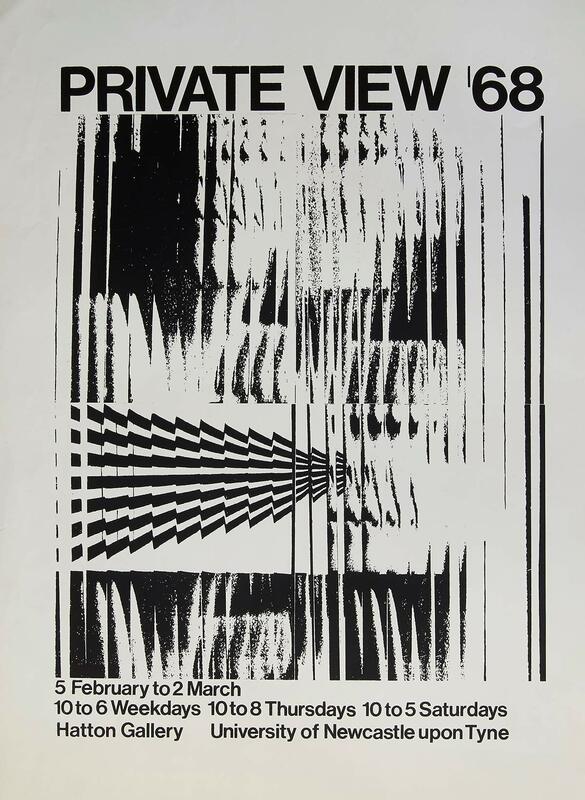 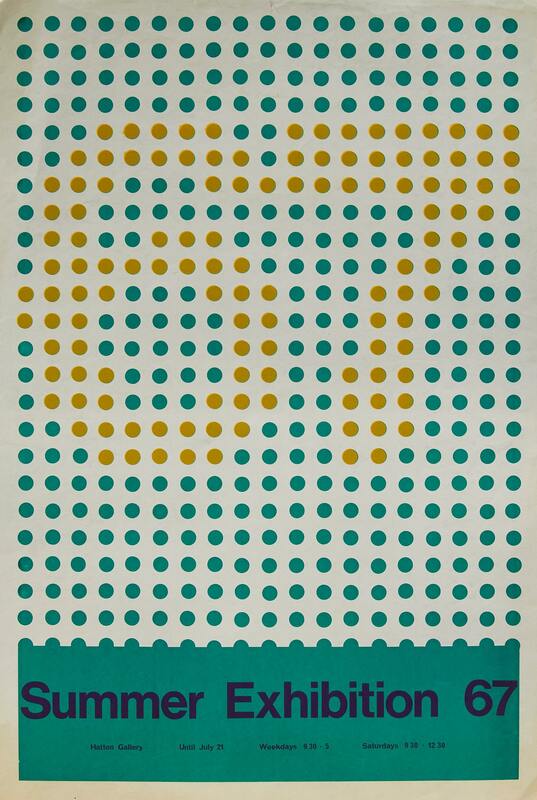 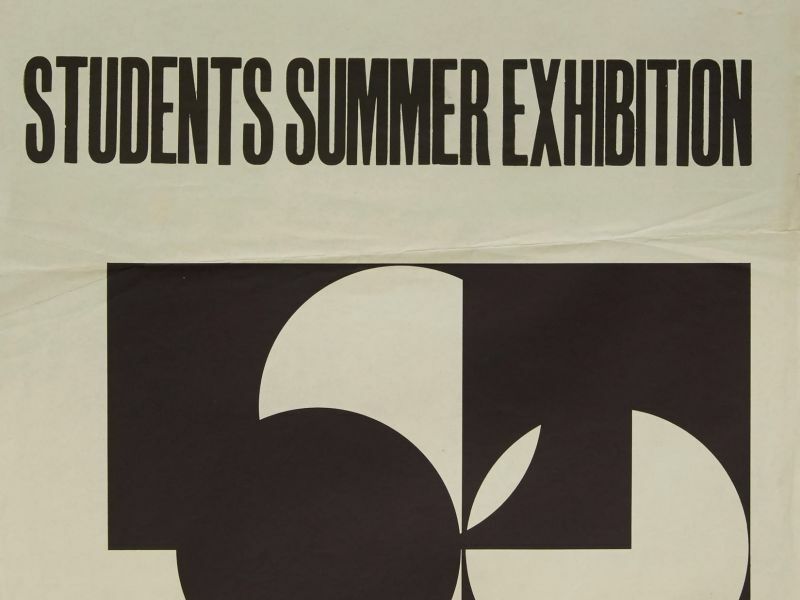 The ‘Op Art’ derived poster for the 1967 Student Summer Exhibition is unusual in the image being evidently designed specifically for the poster, rather than an existing piece of students’ work being selected. 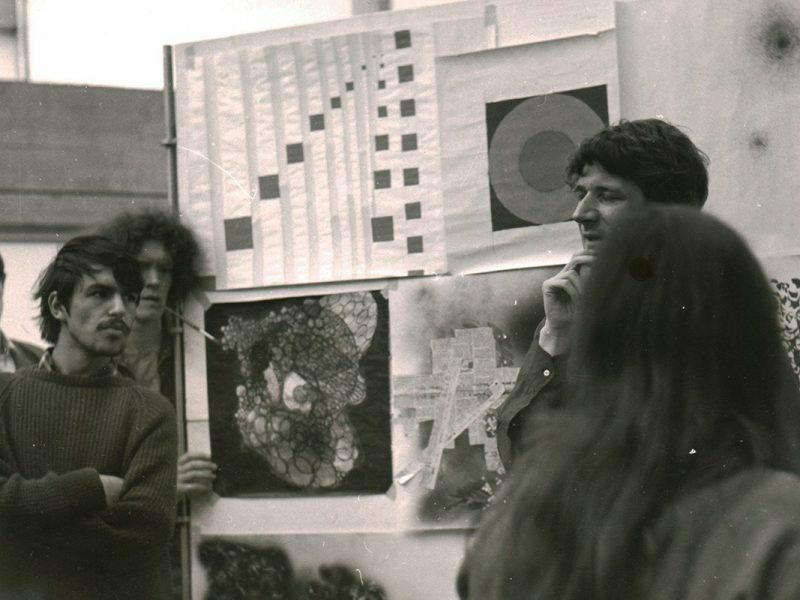 In 1967 the external examiners were Robert Adams and William Scott, the John Bell Simpson prize winner was Mike Brick and Hatton Scholarships were awarded to Lloyd Gibson and Mali Morris. 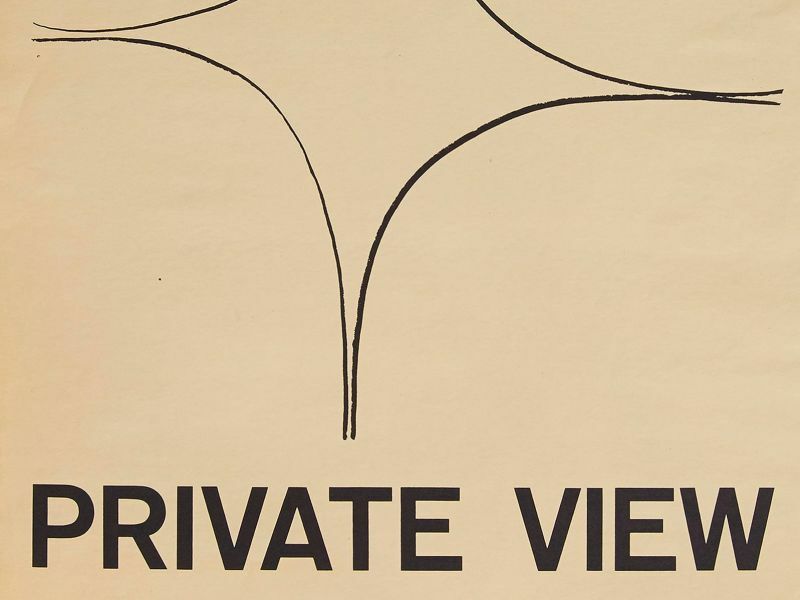 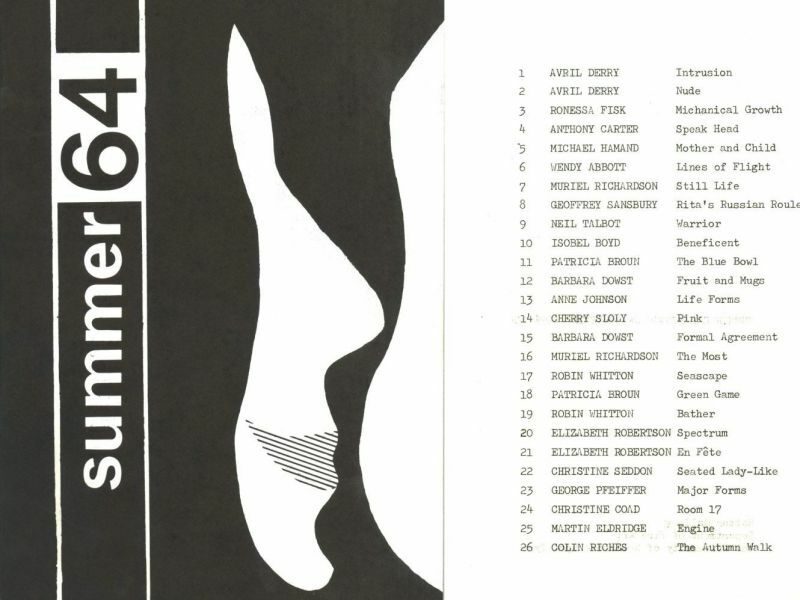 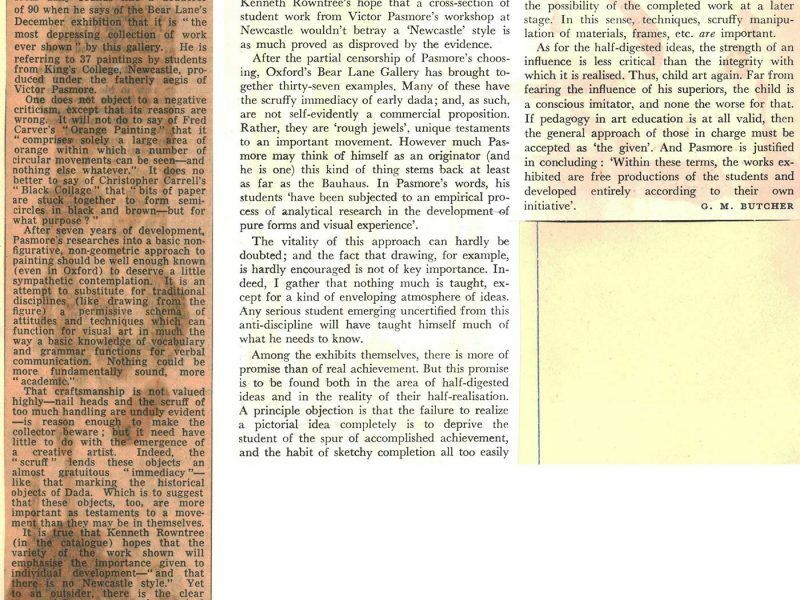 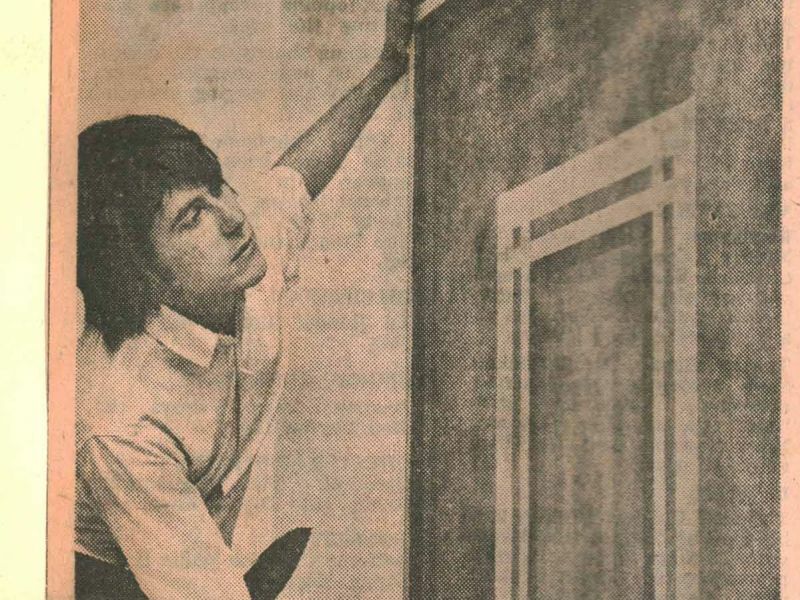 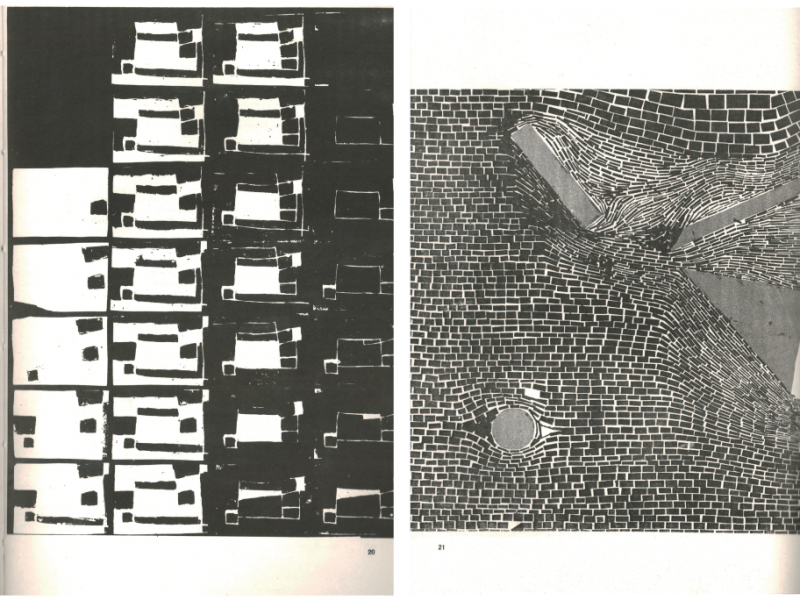 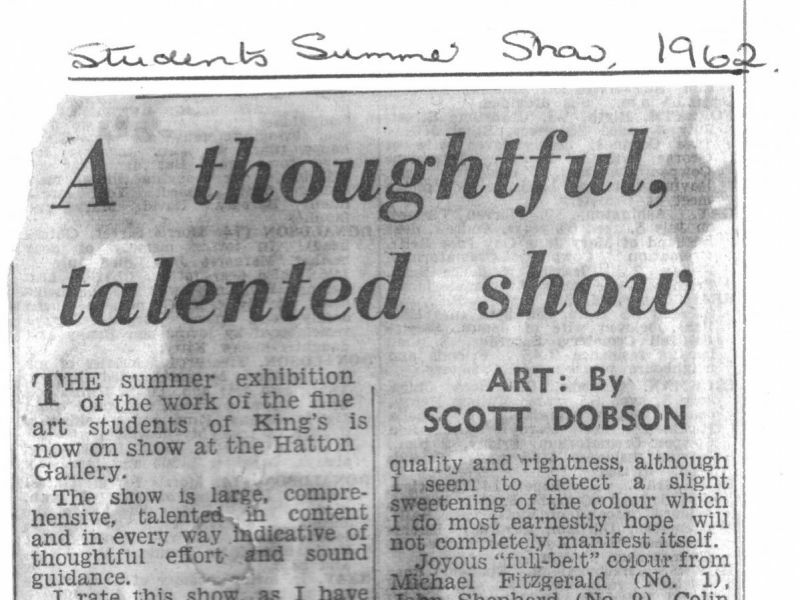 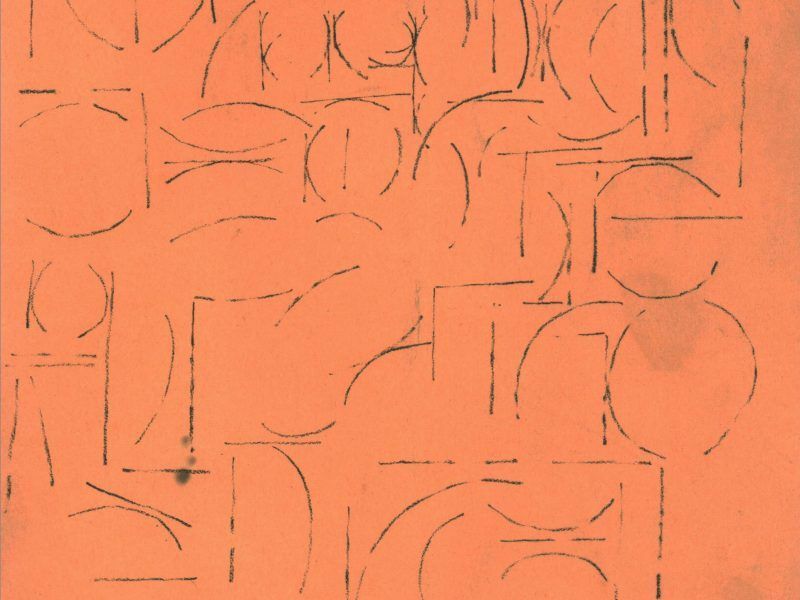 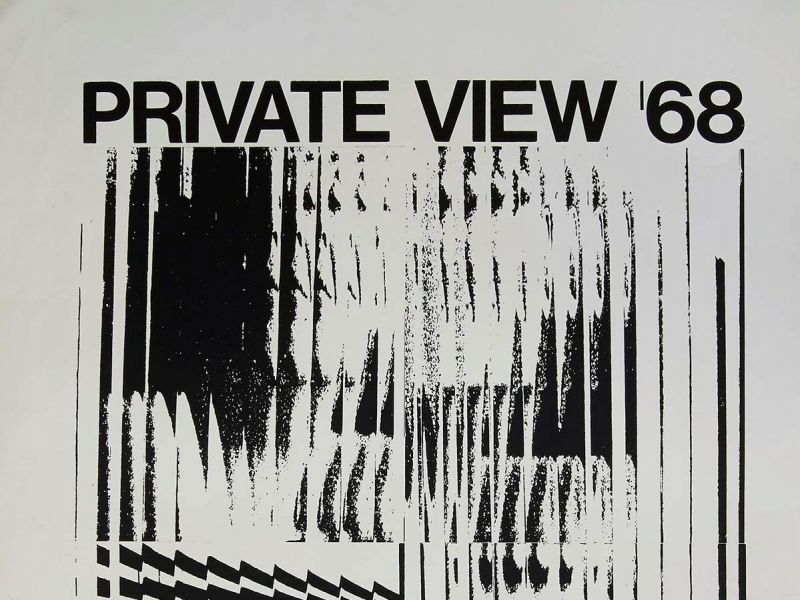 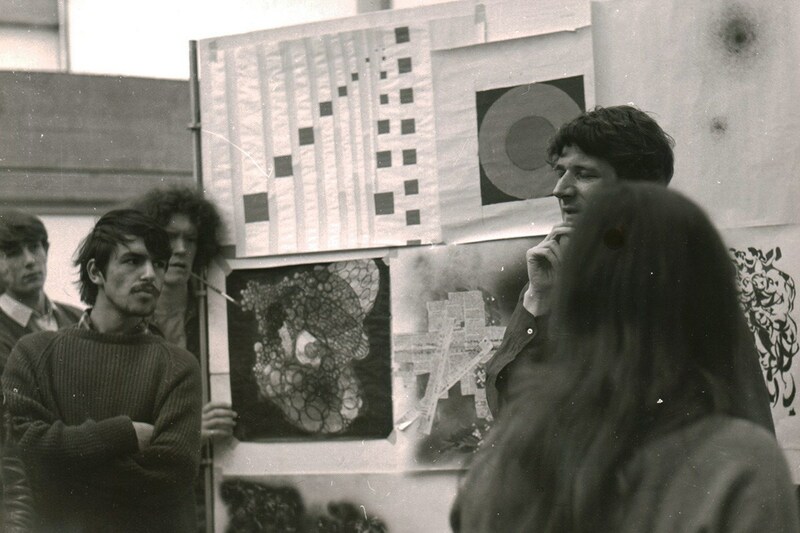 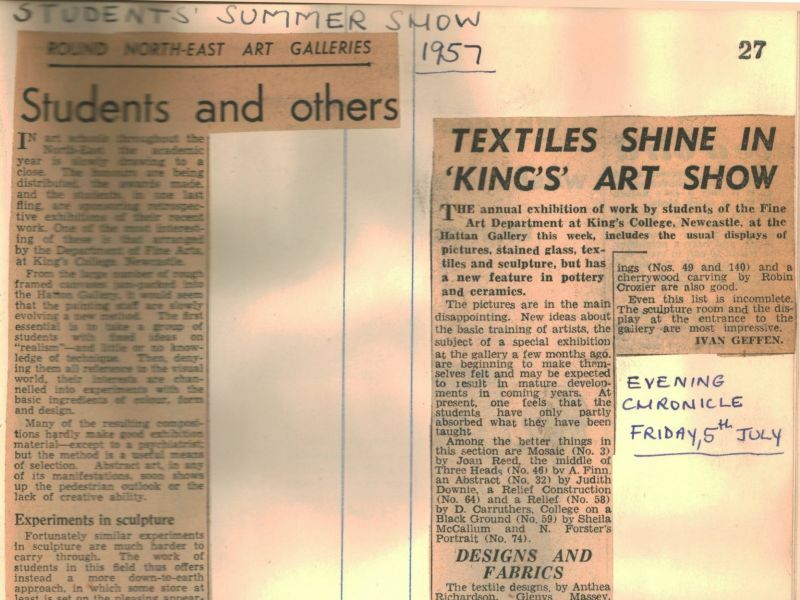 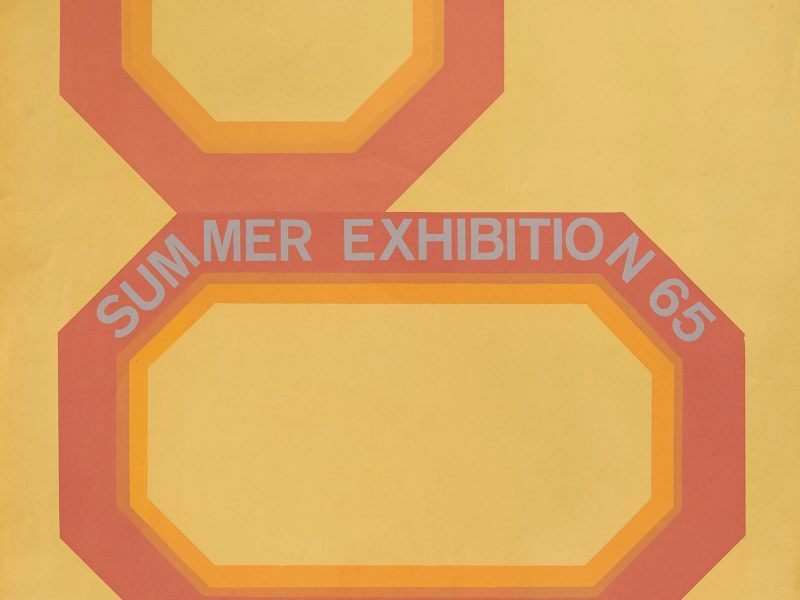 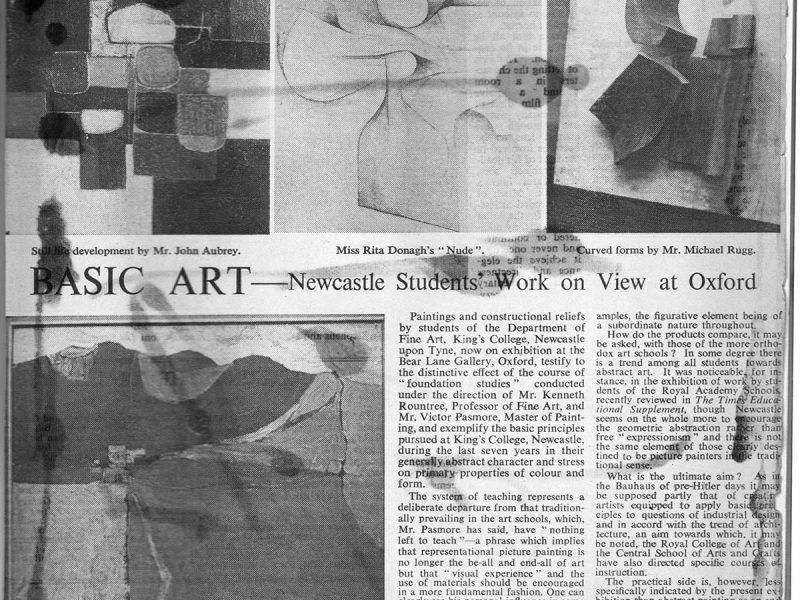 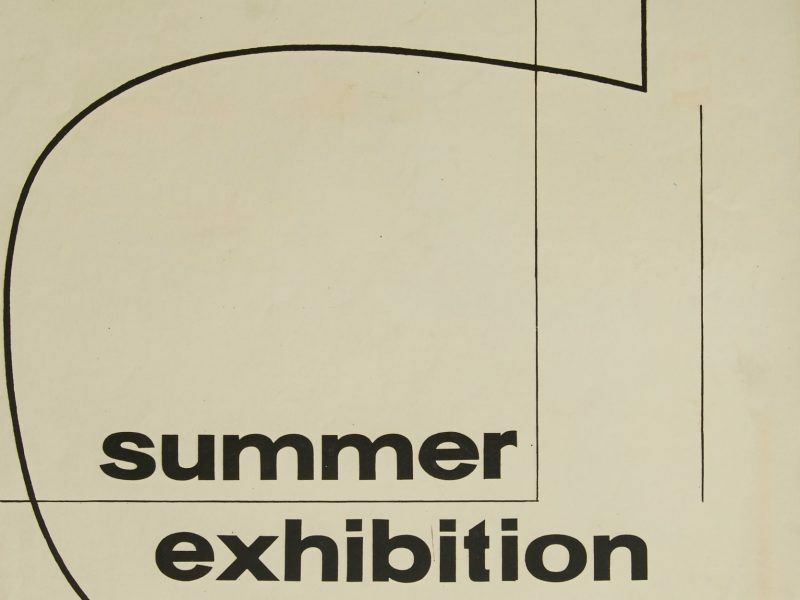 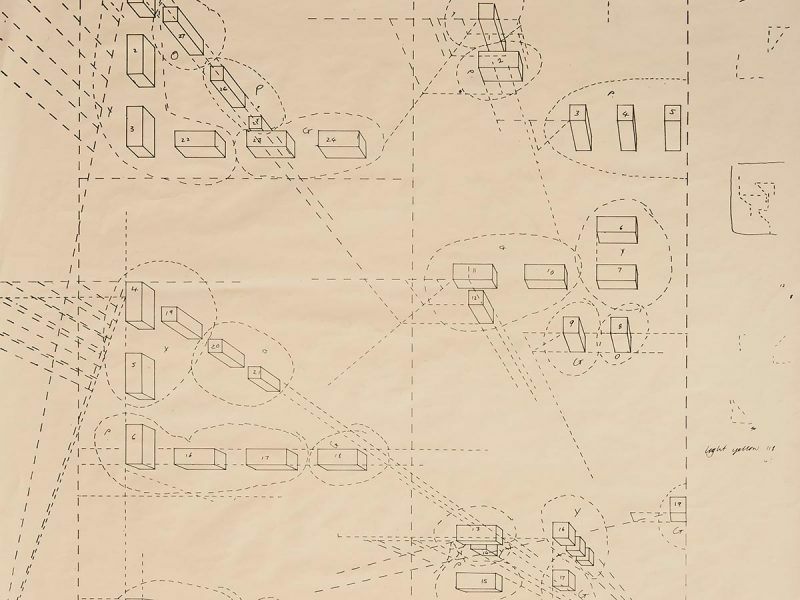 Scott Dobson and William Varley’s reviews of the 1967 student Summer Exhibition both pick out a number of different artists to mention, and recognise the diversity of styles and approaches amongst the students’ work. 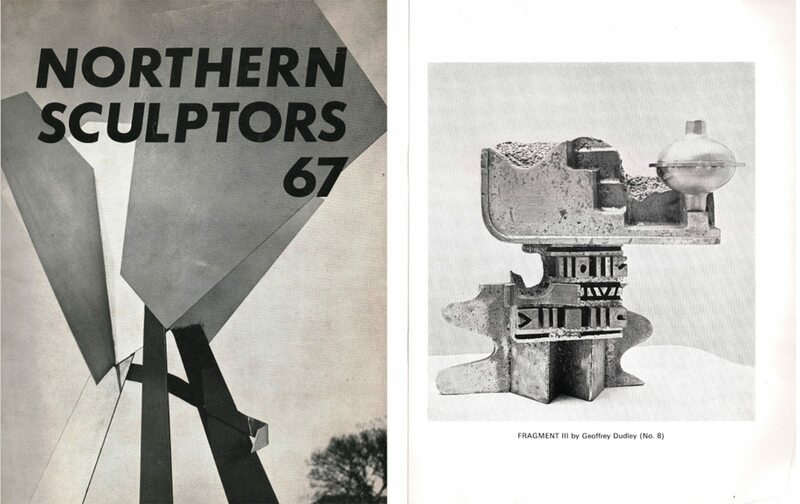 Catalogue cover and page, featuring Geoffrey Dudley (by then teaching at Chelsea rather than Newcastle), for the ‘Northern Sculptors 67’ competition and exhibition held at the Shipley Art Gallery, April-May 1967. 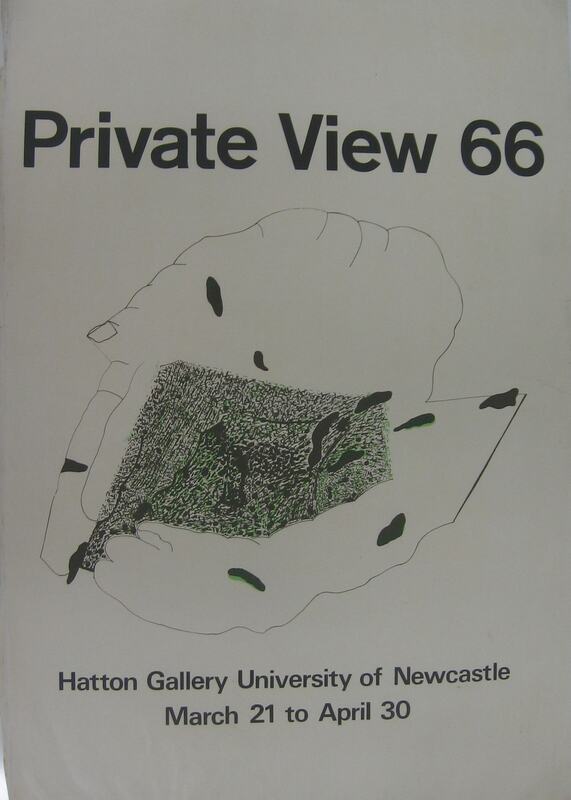 23 finalists were chosen for the exhibition from 120 entrants, among them were former King’s College students Robin Crozier, David Humphreys, Neil Talbot, Matt Rugg and Derek Carruthers (who won one of the prizes) as well as tutors Geoffrey Dudley and Derwent Wise. 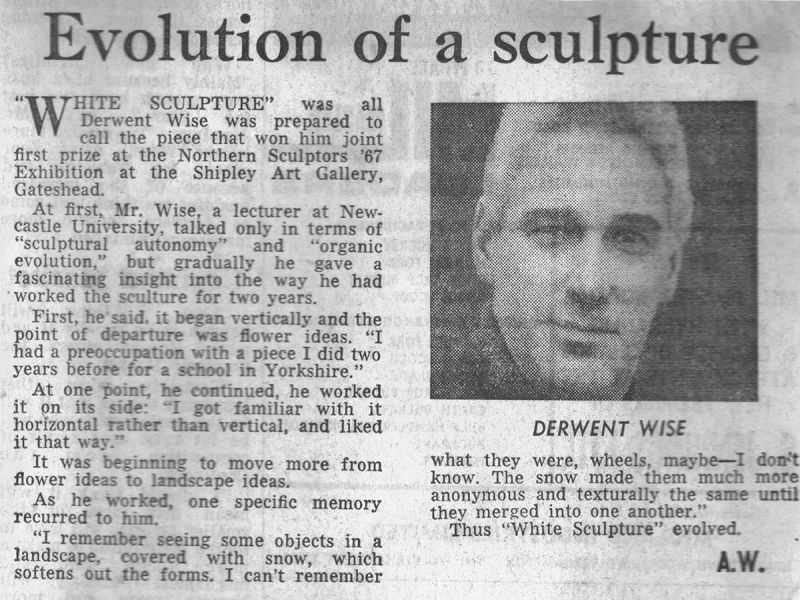 Sculpture tutor Derwent Wise’s success in the ‘Northern Sculptors 67’ competition is reported here in The Journal. 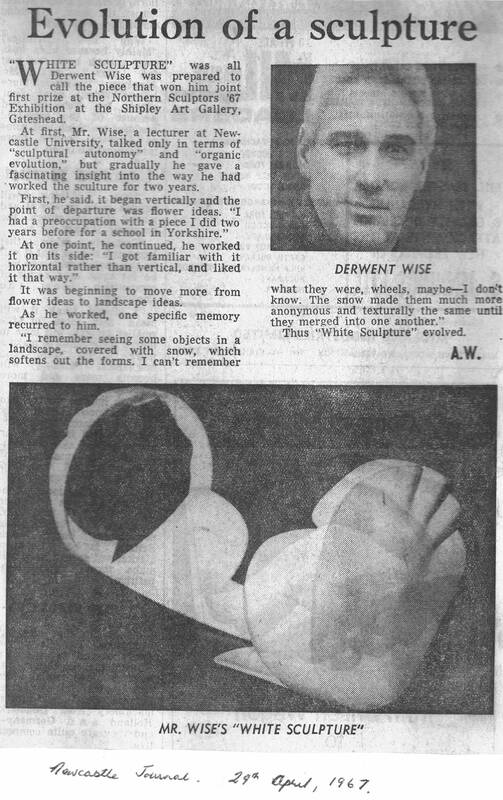 The three eminent competition judges were Alan Bowness, David Sylvester and sculptor Hubert Dalwood, Wise’s winning ‘White Sculpture’ was subsequently purchased for the Arts Council Collection. 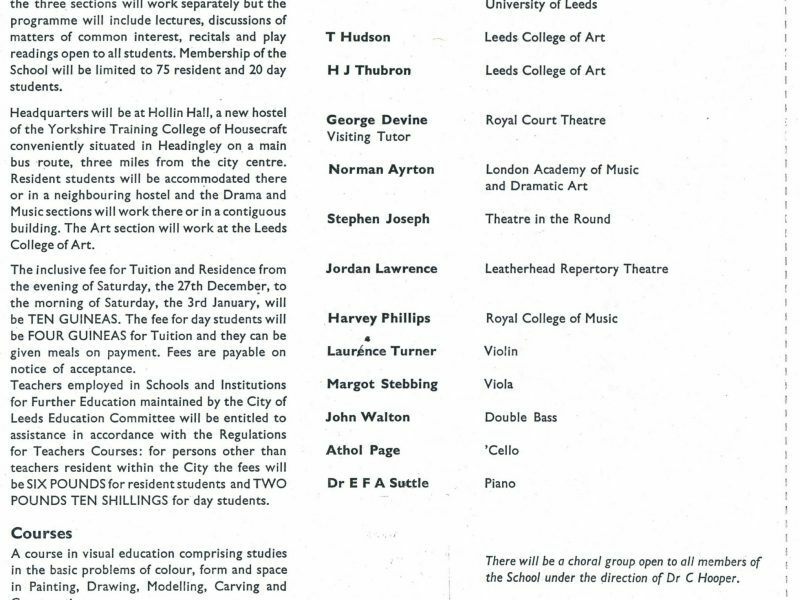 In 1967 Ian Stephenson was appointed to replace Hamilton as director of Foundation Studies. 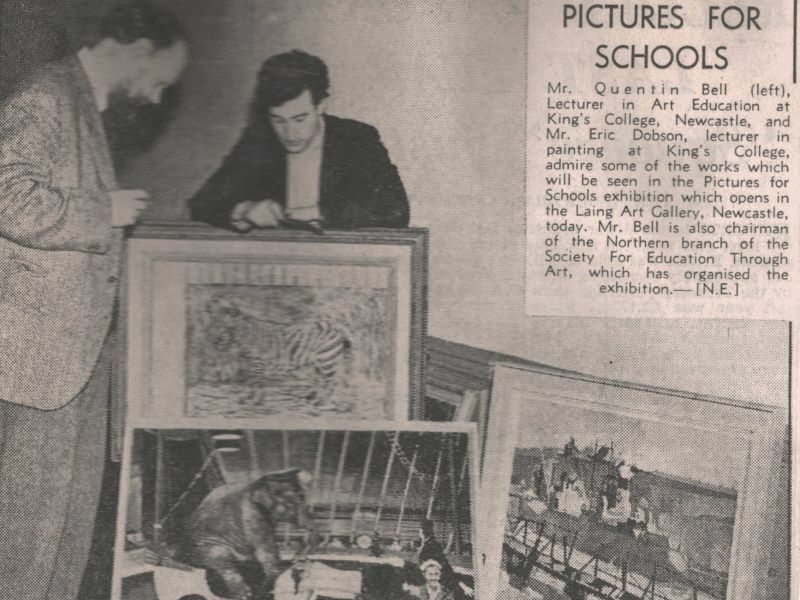 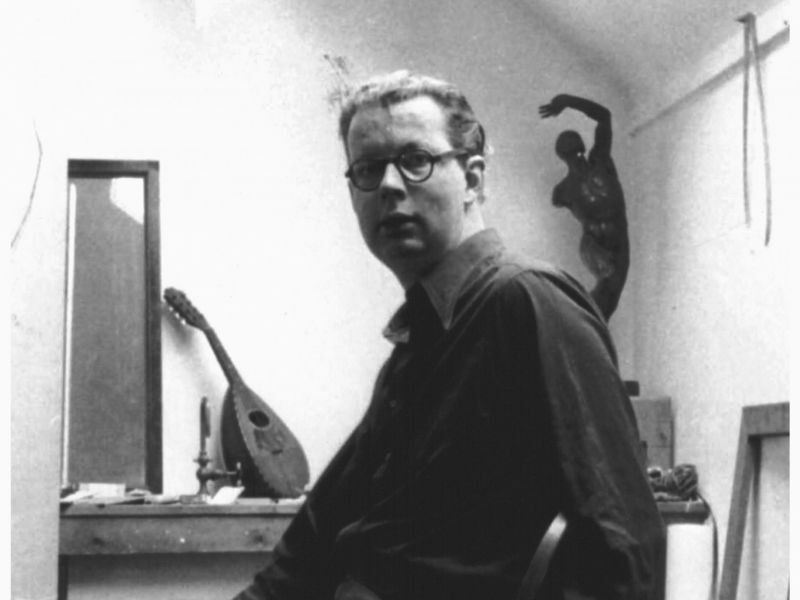 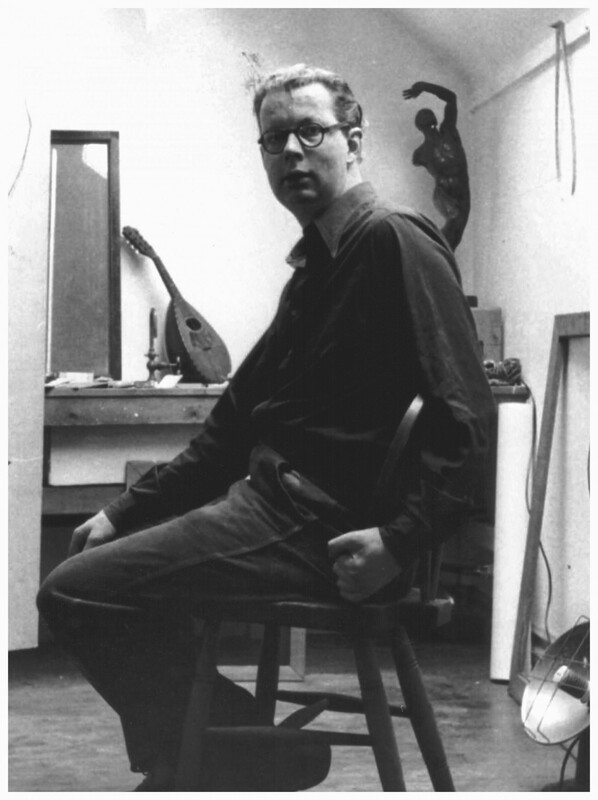 Stephenson had been a student in the Fine Art Department between 1951-56. 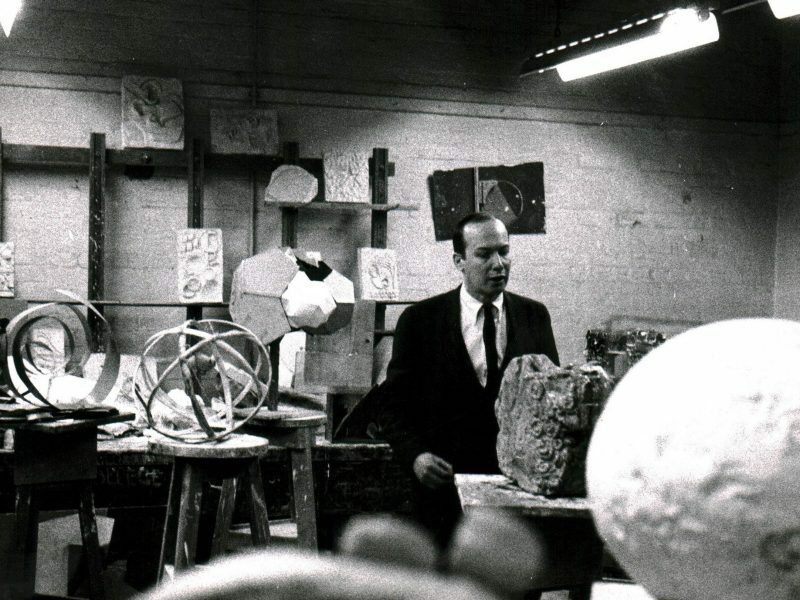 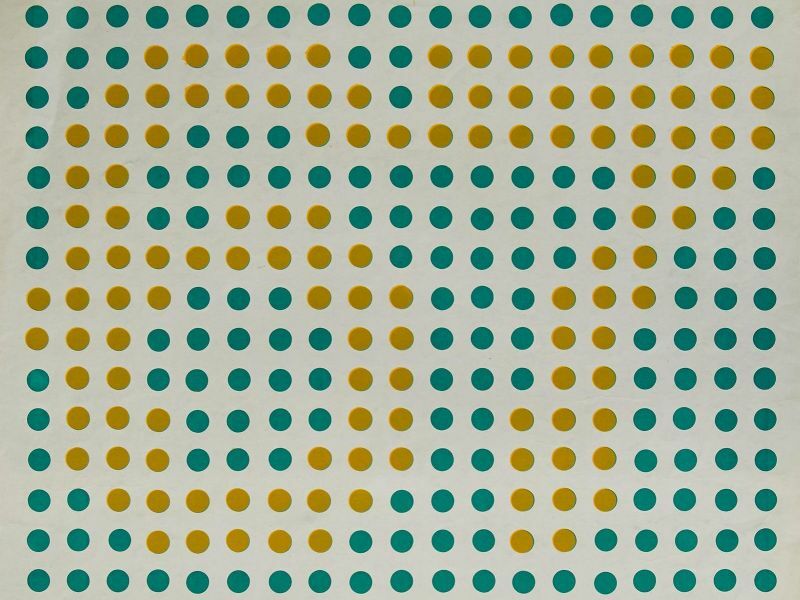 On finishing his degree he was appointed Tutorial Student, then Studio Demonstrator as Pasmore’s ‘basic course’ was being developed 1956-58, before going on to teach at Chelsea School of Art. 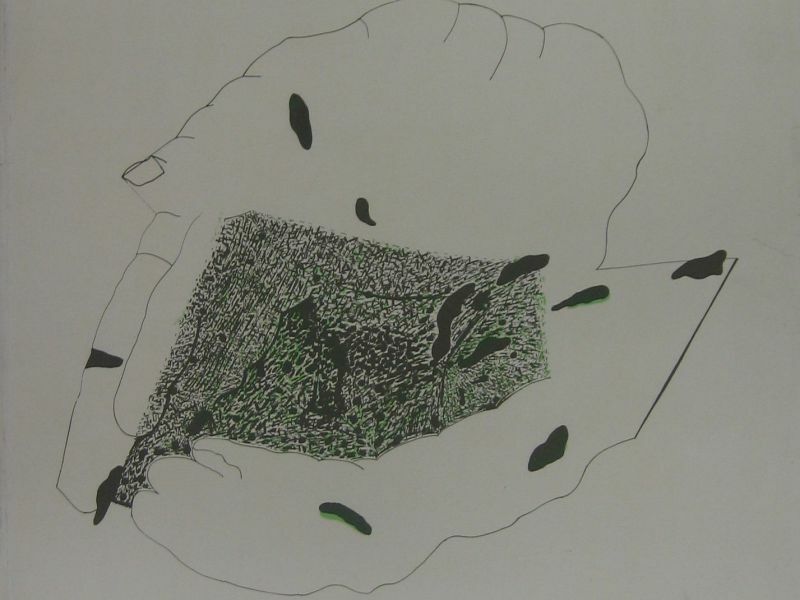 Recent graduate Bryan Ferry attracted the attention of The Journal with his first public showing of his abstract paintings, though he recognised that finding a local market for such works would be difficult. 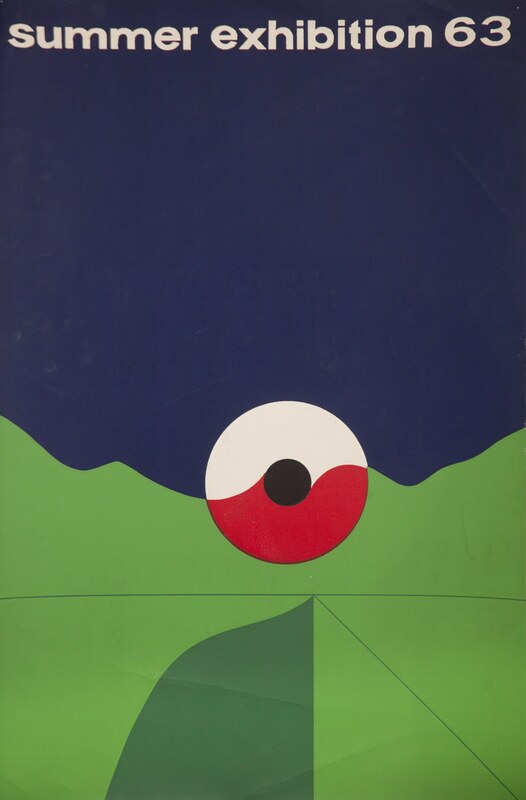 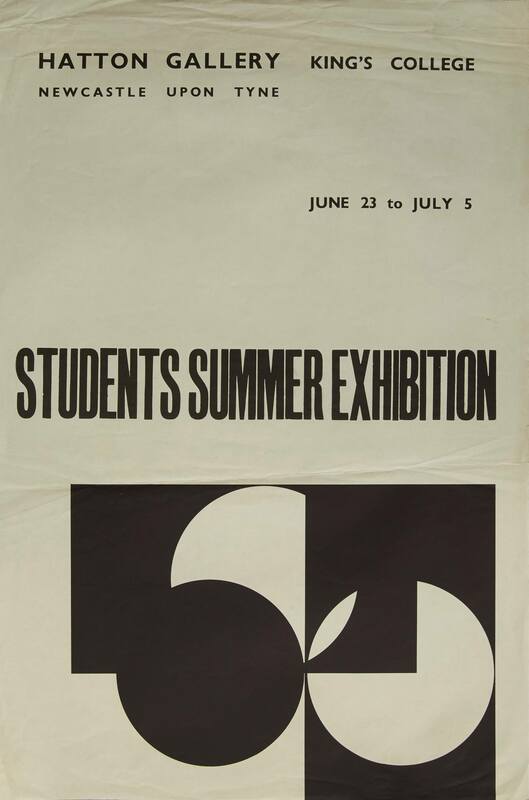 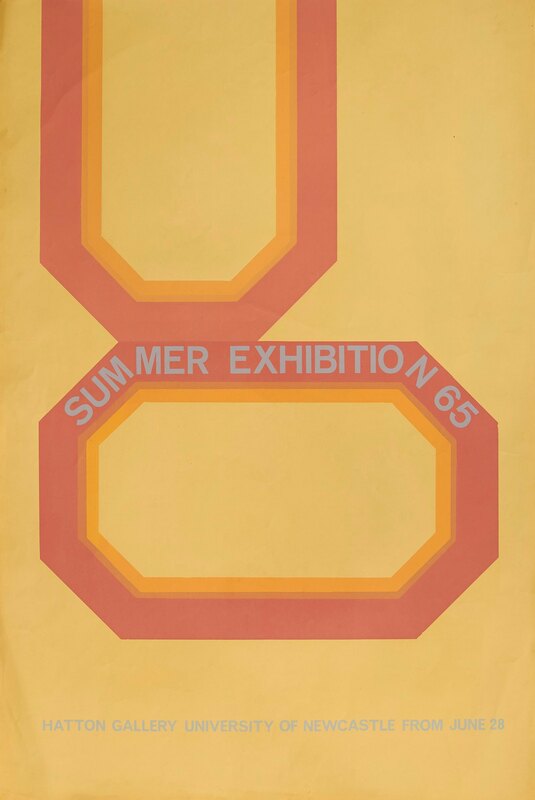 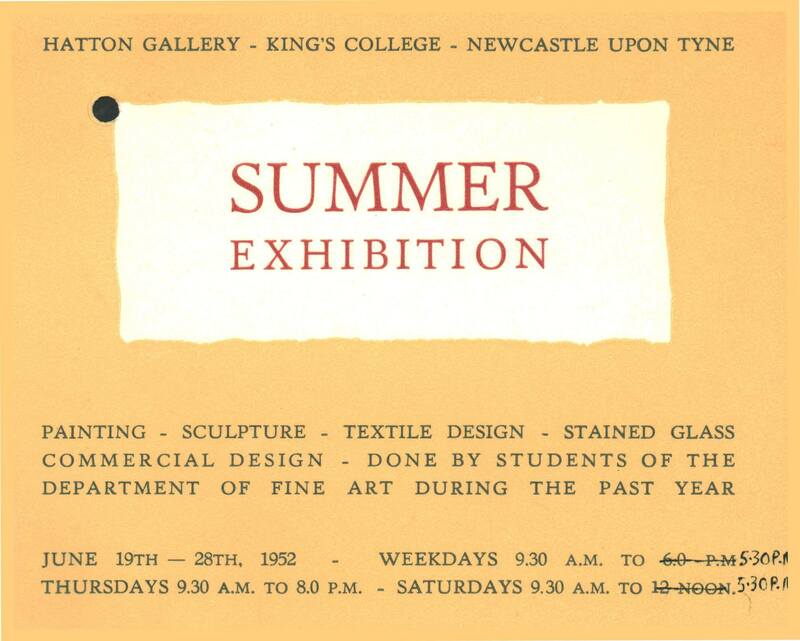 Poster for the 1968 student Summer Exhibition. 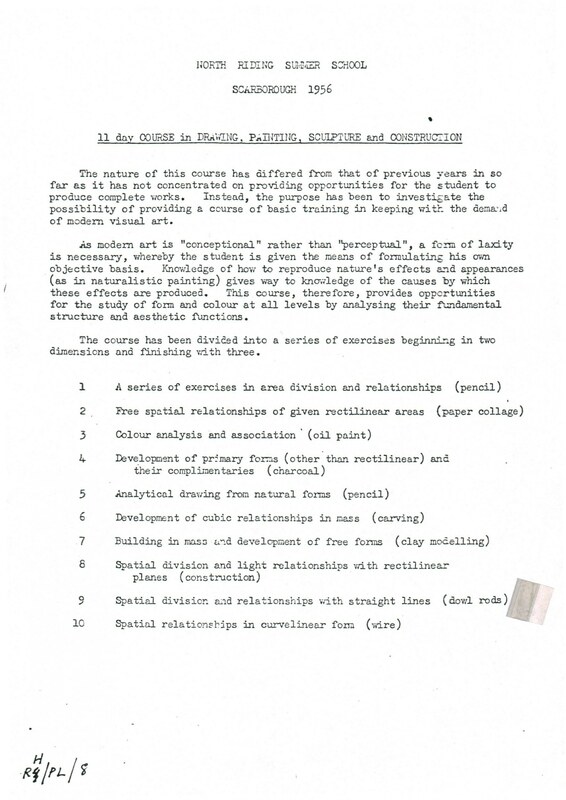 In 1968 the external examiners were F.E. 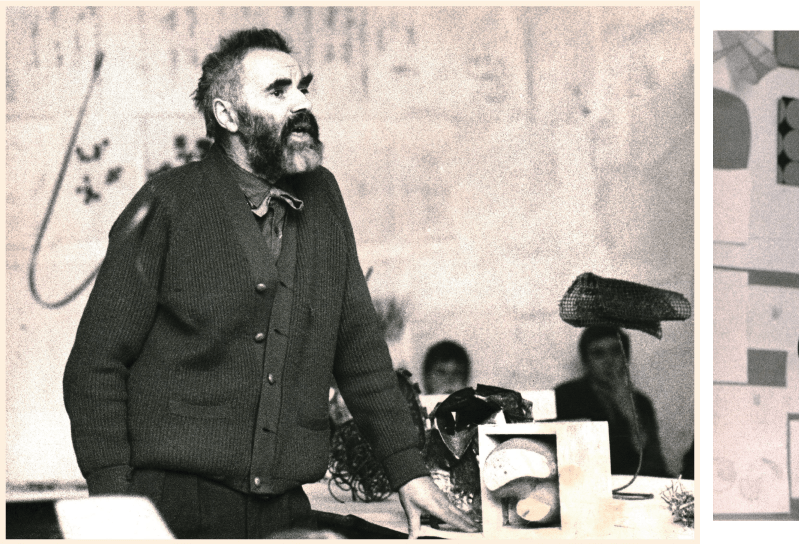 McWilliam and William Scott.